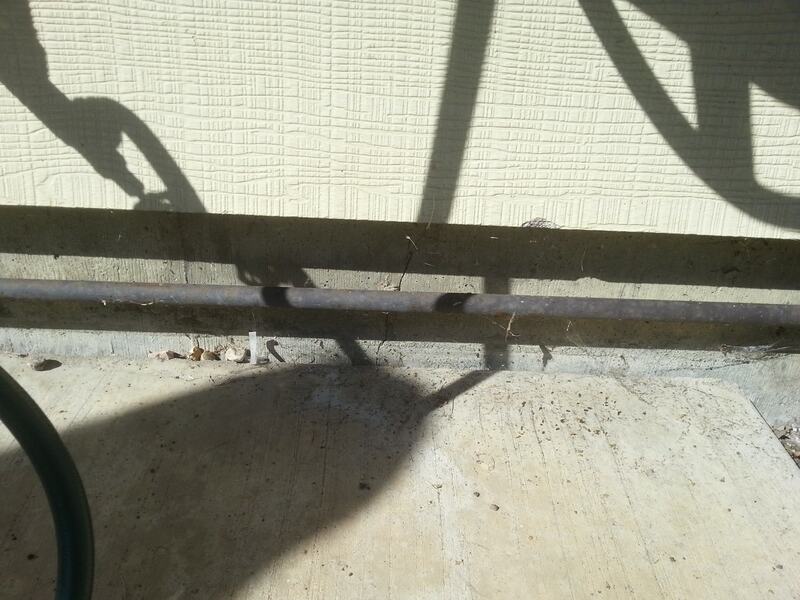 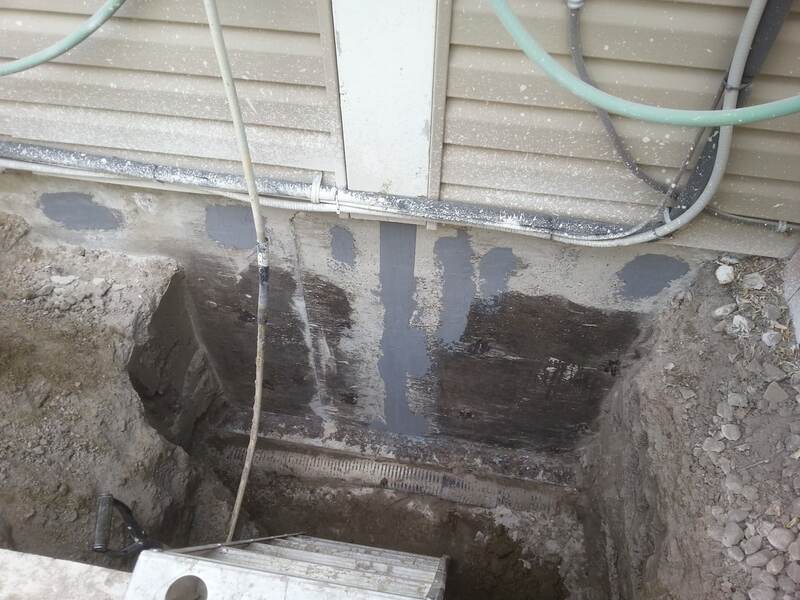 Basement Crack Repair & Waterproofing - Grounds Master Inc.
After every spring snow melt or heavy rainstorm, does water accumulate at the bottom of your interior basement foundation wall? 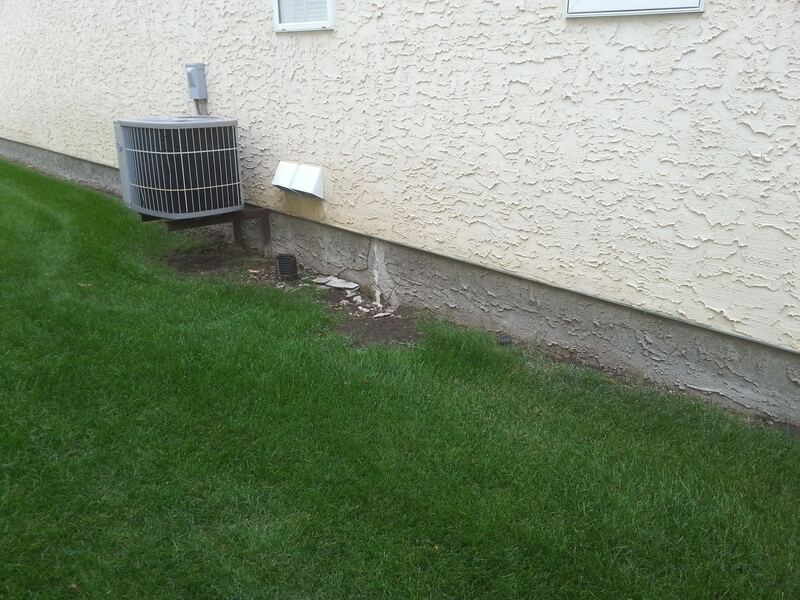 Do you have a structurally unsound concrete, cinderblock, or wood foundation wall that is allowing water in? 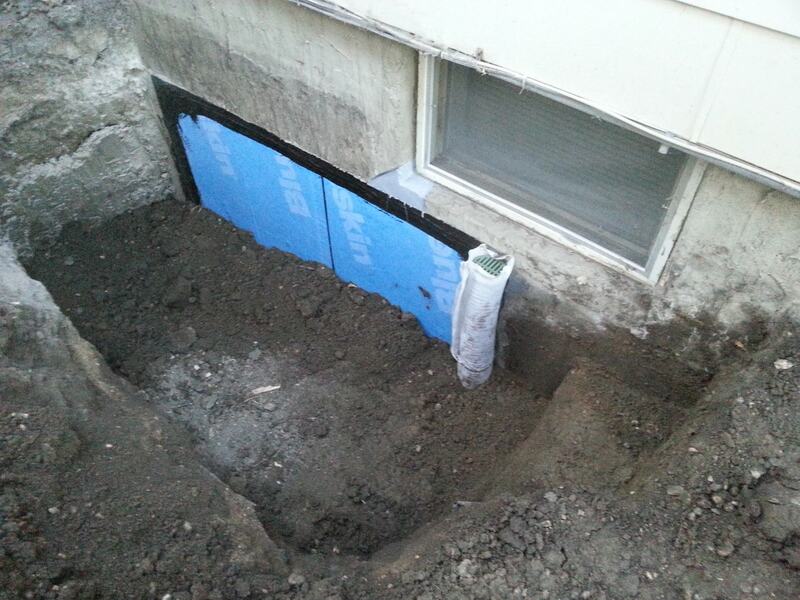 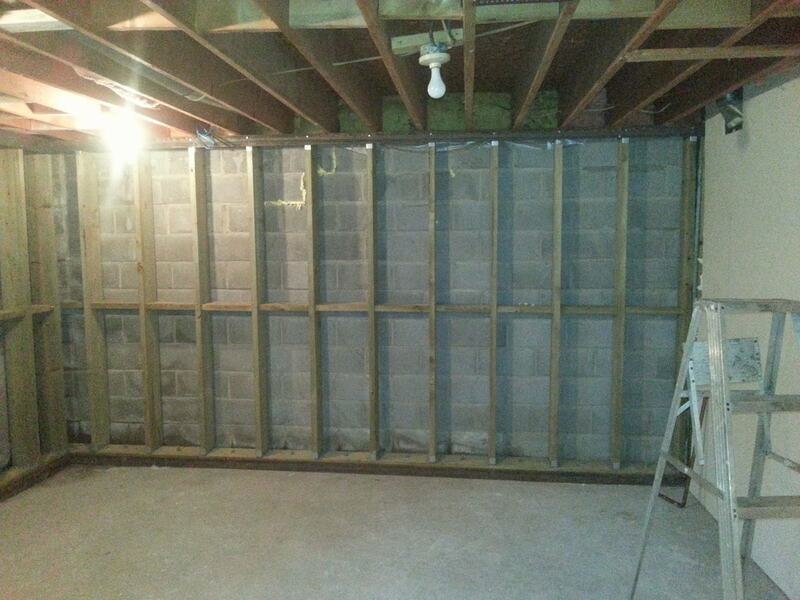 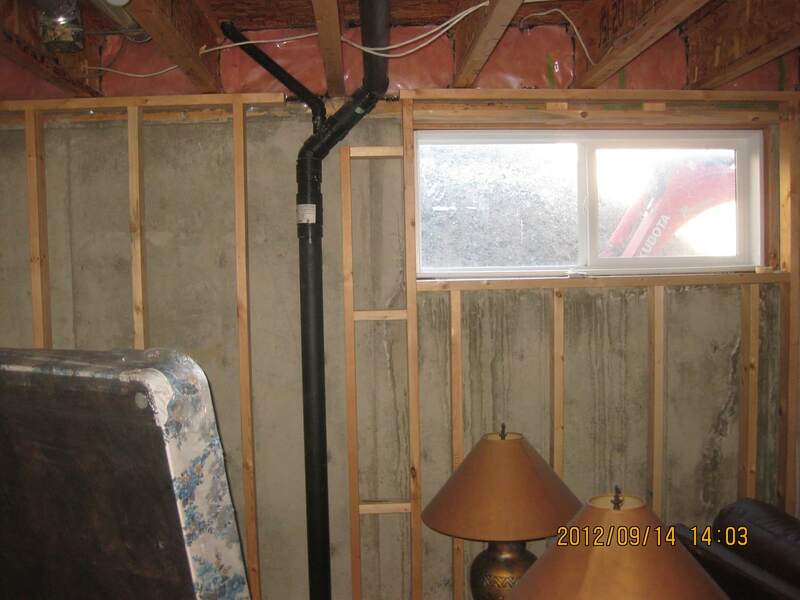 Maybe you have a basement window-well that fills with water and causes your window to leak water into your basement? 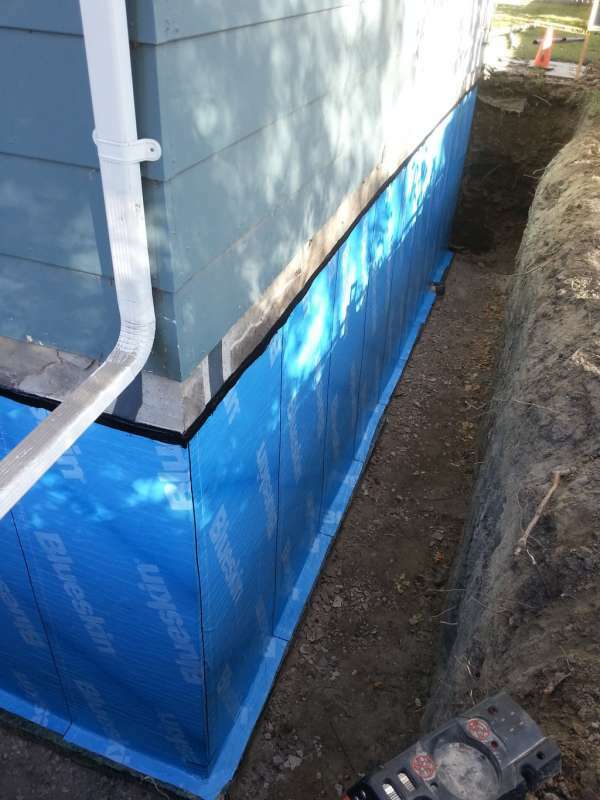 Are you building a new house and find yourself weighing the benefits of waterproofing your basement foundation rather than just damp-proofing it. 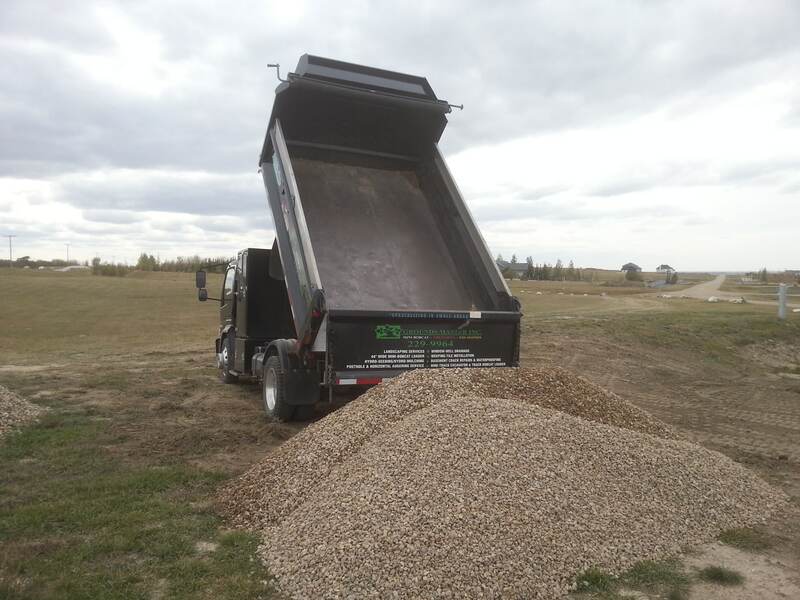 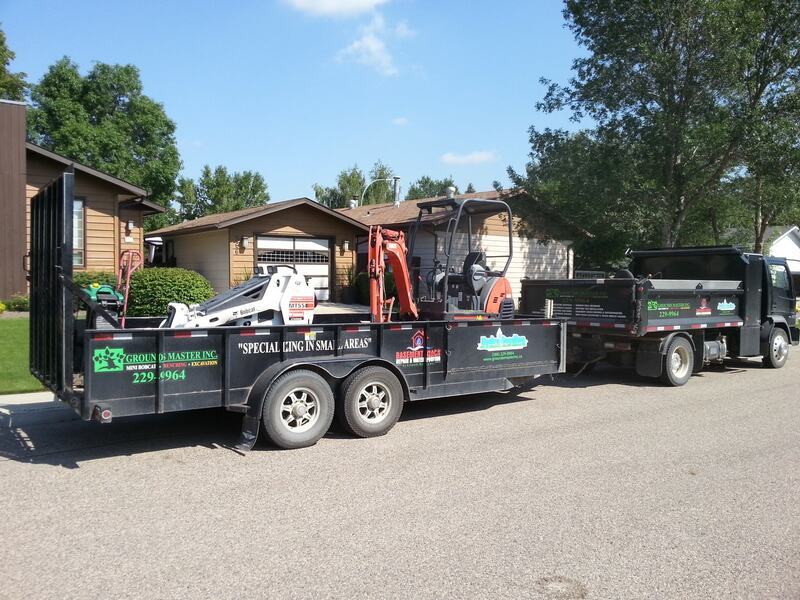 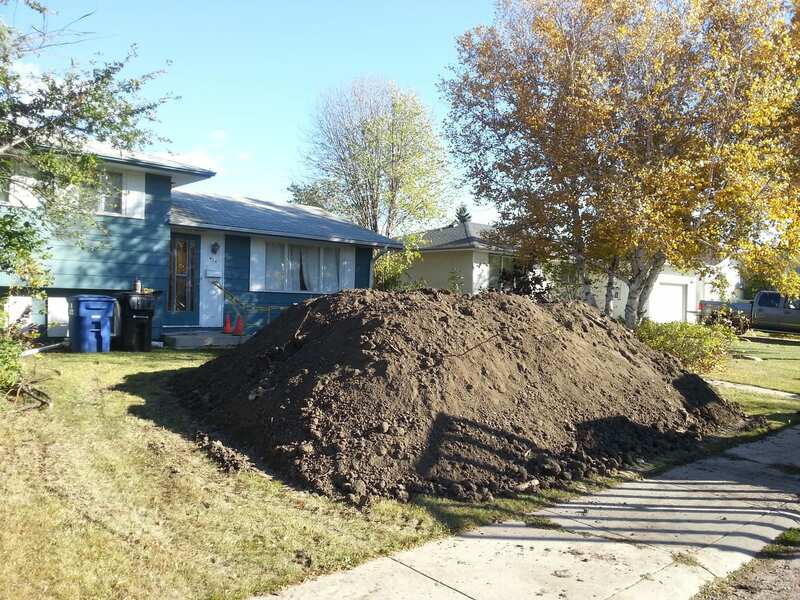 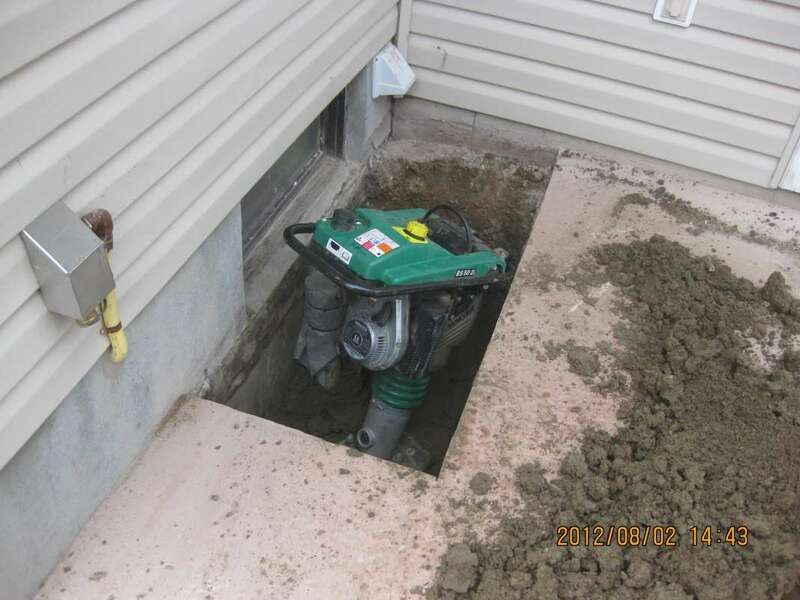 Regardless of what your basement foundation issues are, Grounds Master Inc. will have solution(s) for you to consider. 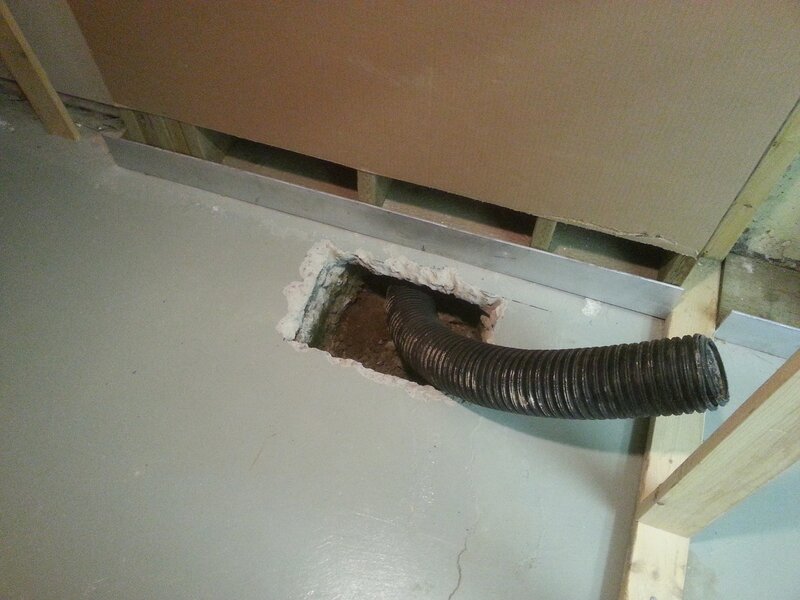 Why Do Basements Start Leaking? 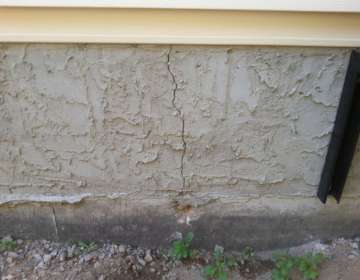 As houses settle, concrete or cinderblock can develop stress cracks that leak water. 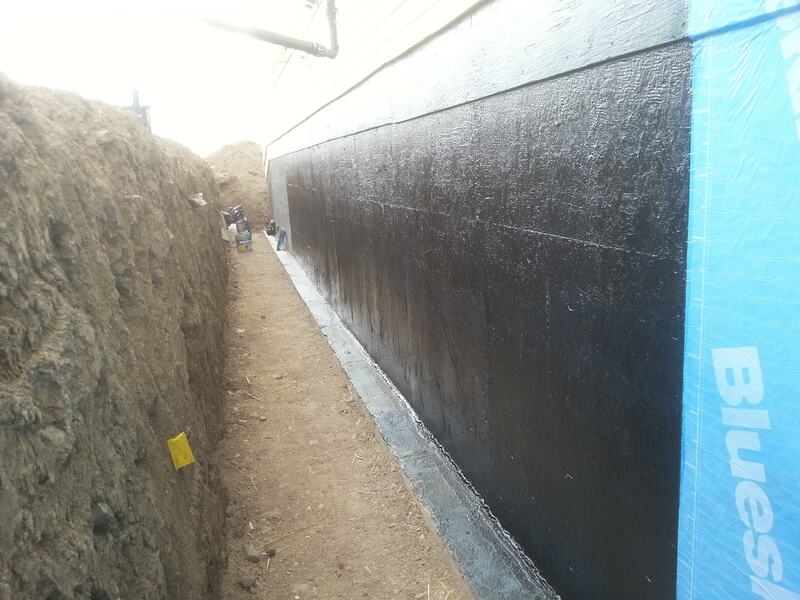 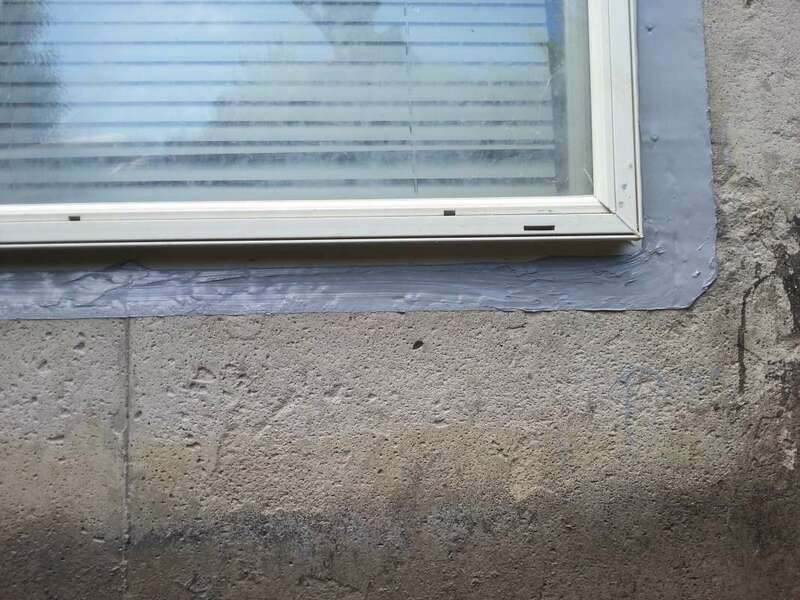 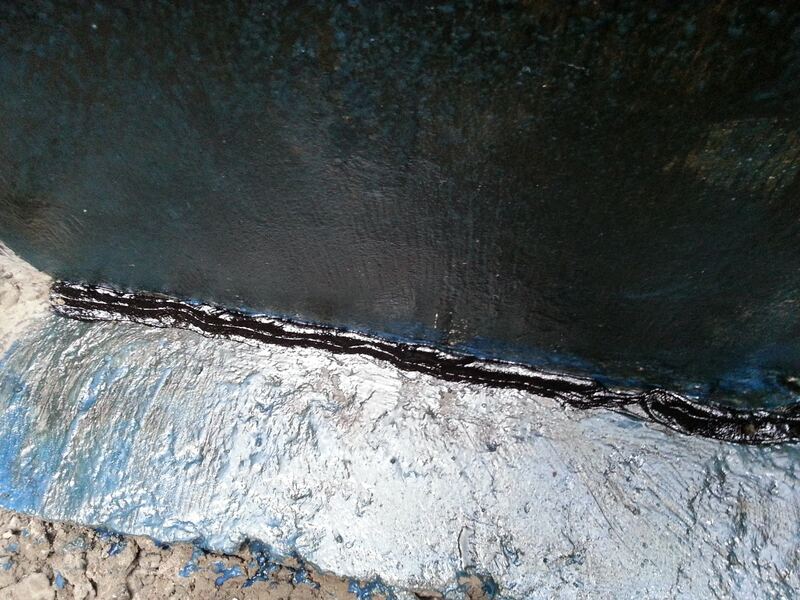 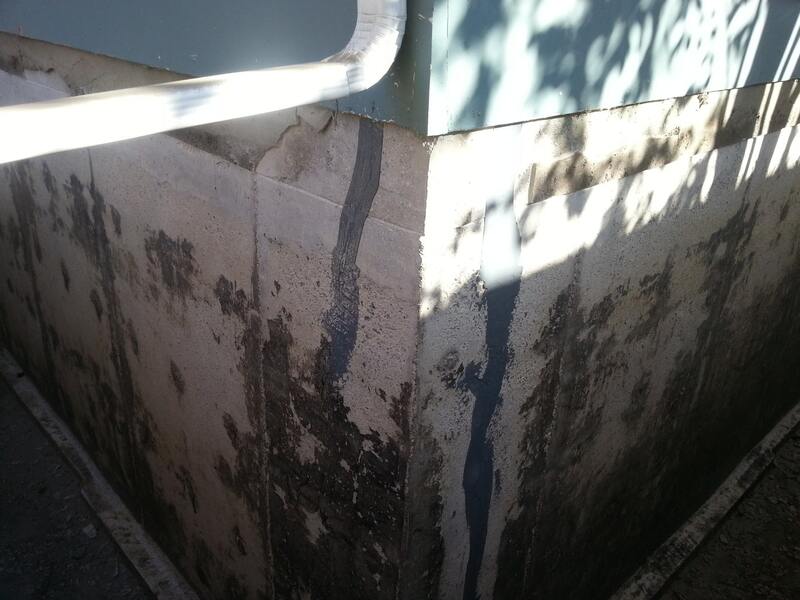 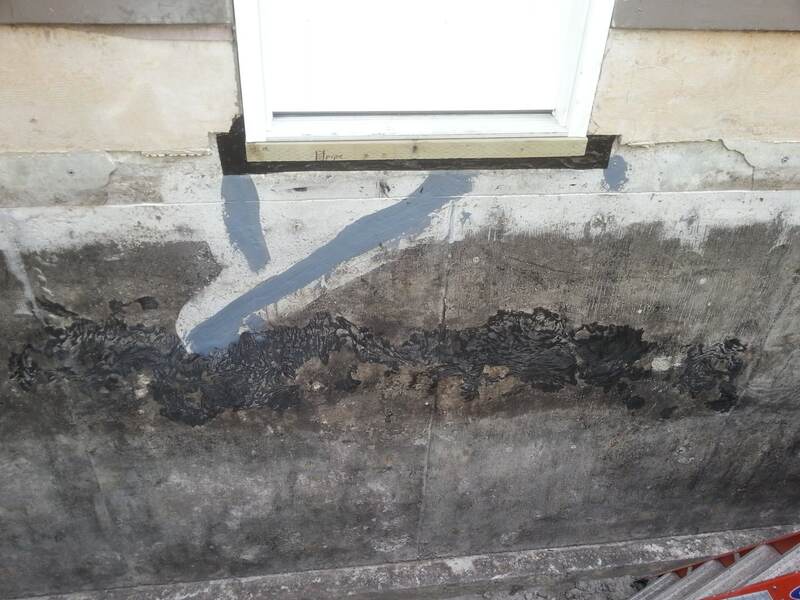 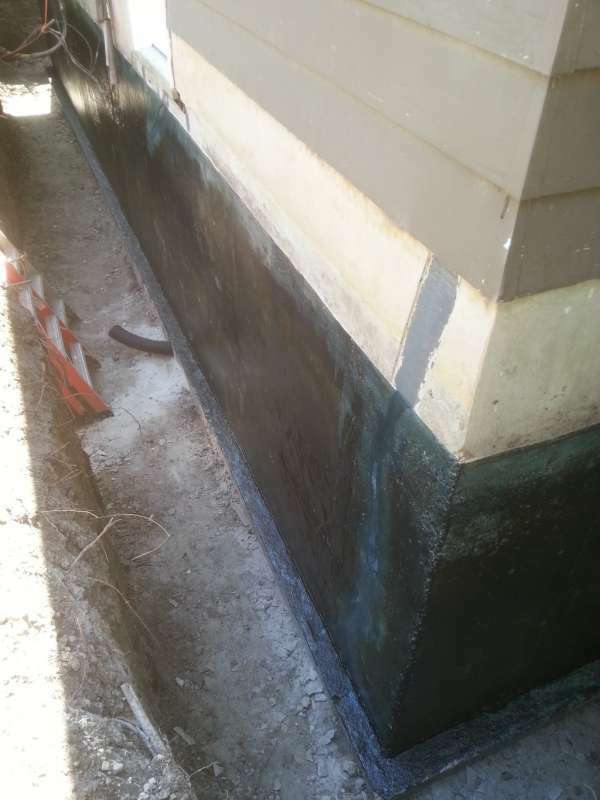 The exterior foundation damp-proofing, or tar, also deteriorates allot sooner than most people realize, leaving the wall surface open to attack from exterior moisture. 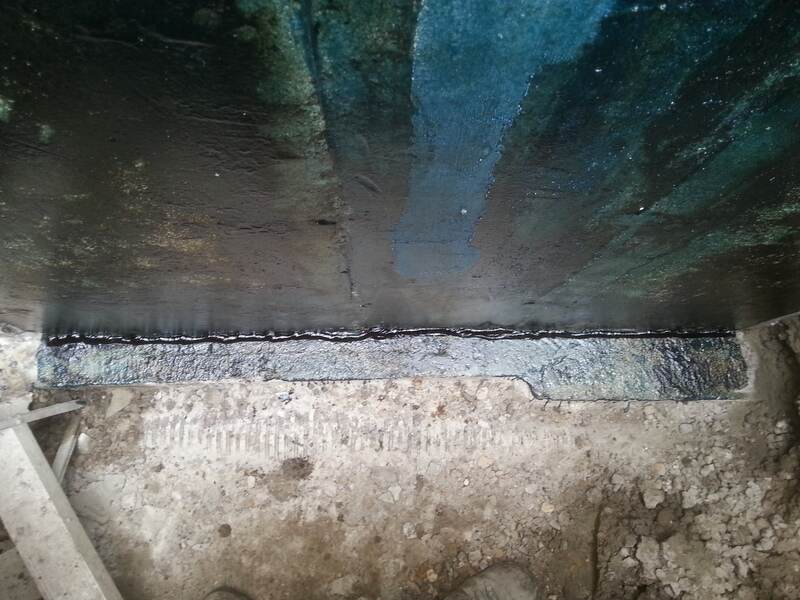 Water also corrodes imbedded steel, which rusts, expands, and can further crack the concrete. A heavy rainstorm or melting snow can temporarily affect the groundwater level. 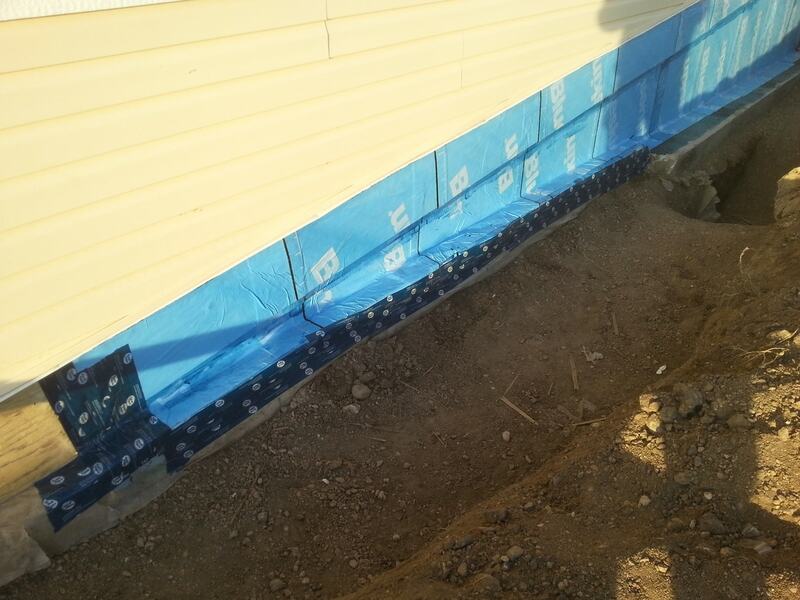 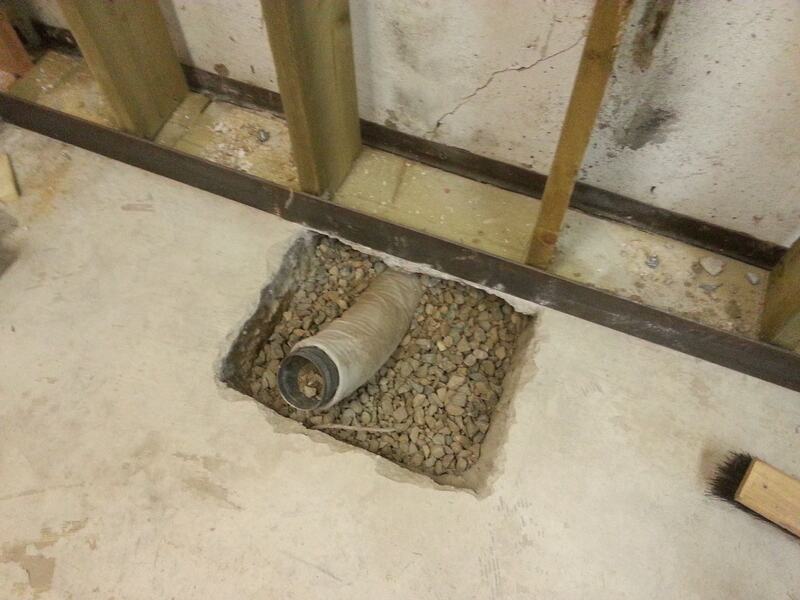 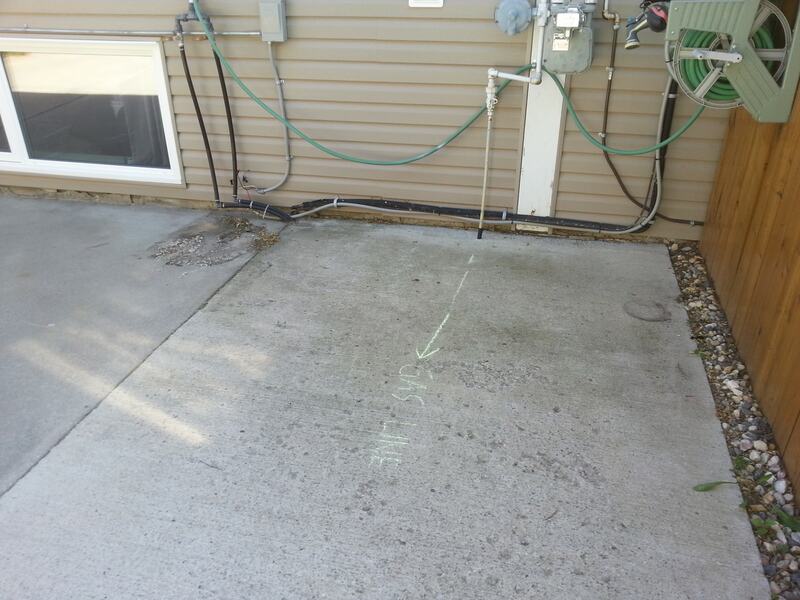 When water accumulates around the foundation, hydrostatic pressure builds up and can cause the basement to leak. 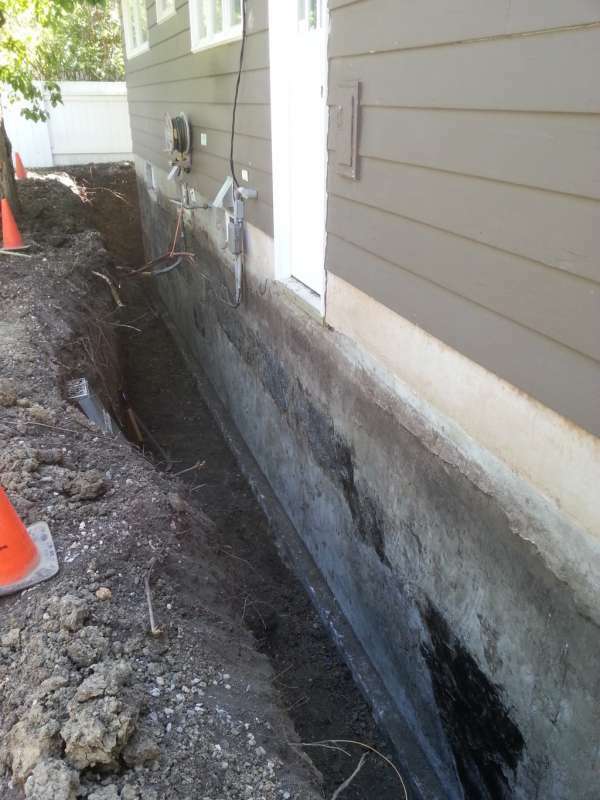 Clay-rich soils do not drain well and hold water right against the foundation walls. 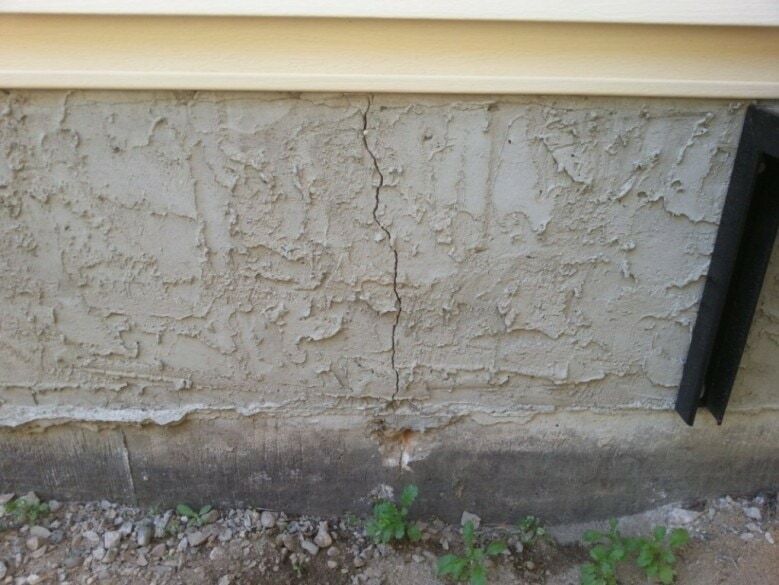 Water pushes its way inside through any cracks, joints, or larger pores in the concrete. Water will always travel along the path of least resistance — and that can be your cracked wall. 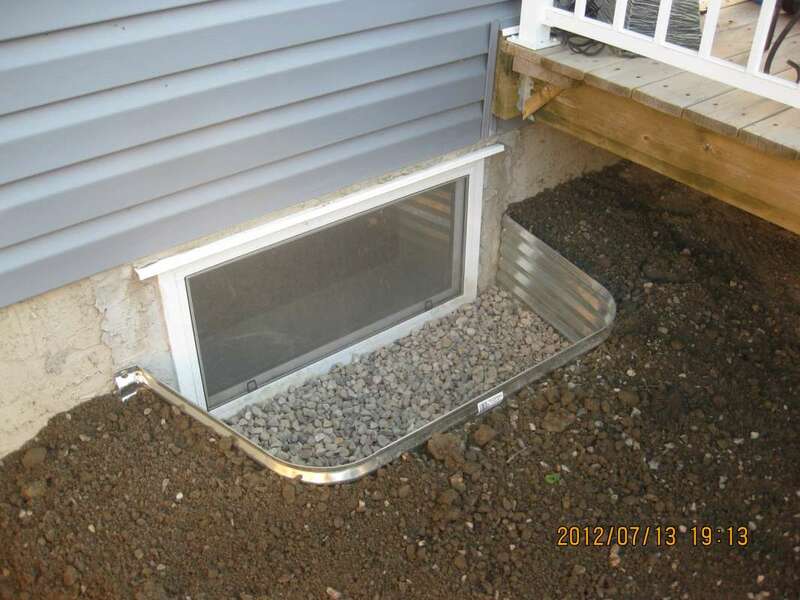 Finally, let’s not forget about window-wells, which can hold pools of water that eventually filter through the basement windows and into the basement itself. 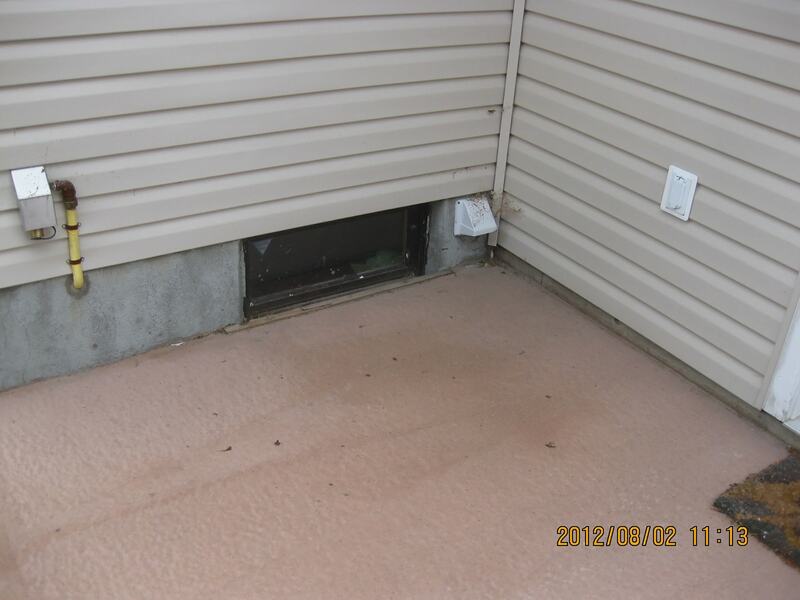 Interior damage resulting by flooded window-wells is an all too common occurrence. 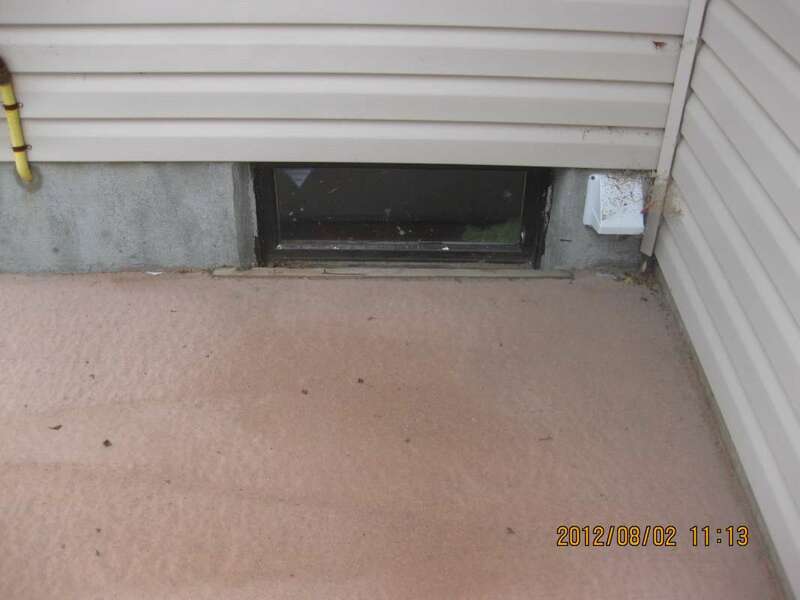 IS THE WATER OR MOISTURE FROM THE INSIDE OR OUTSIDE? Moisture can be leaking into your basement from the outside, or it could be condensed moisture from inside. 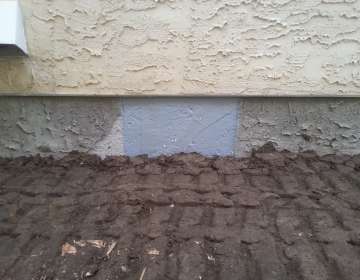 There’s a simple, non-technical method to rule out inside moisture. 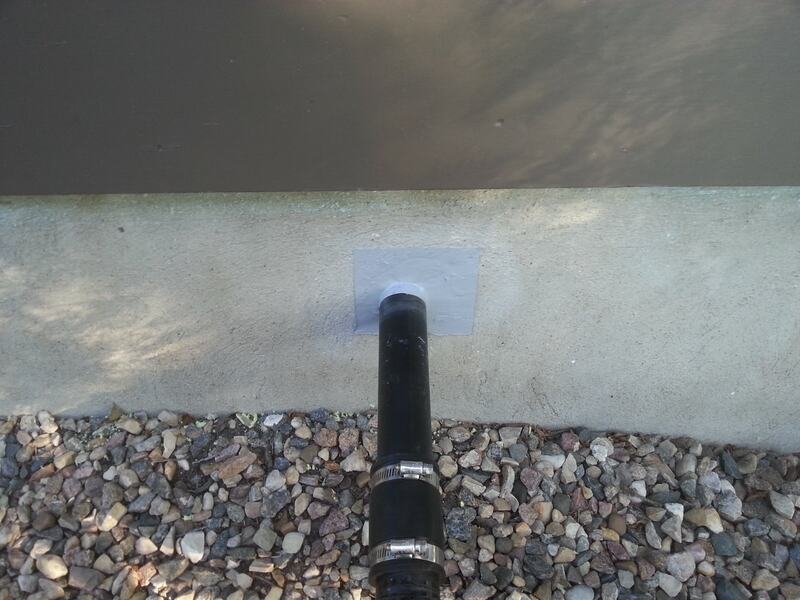 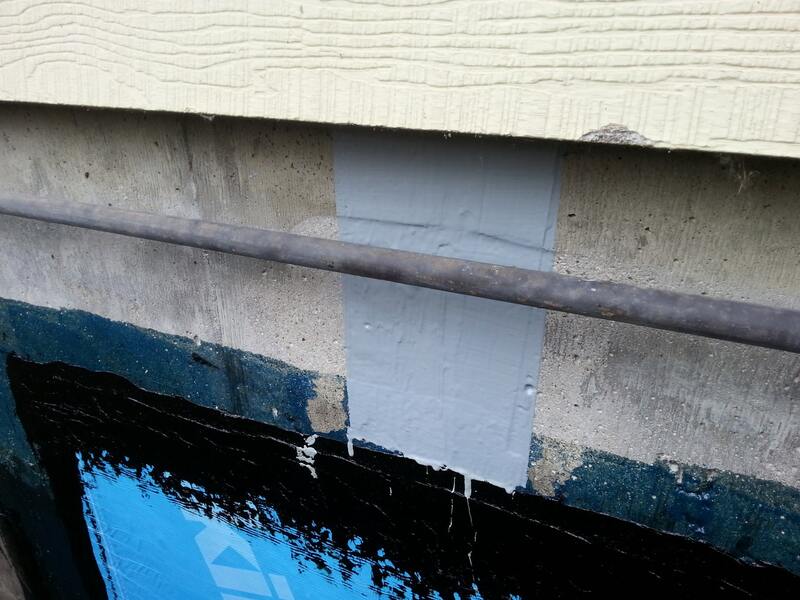 Simply take some tape and put it over the area of the foundation wall where water is collecting. Check back in a day or two to see where the moisture collects. 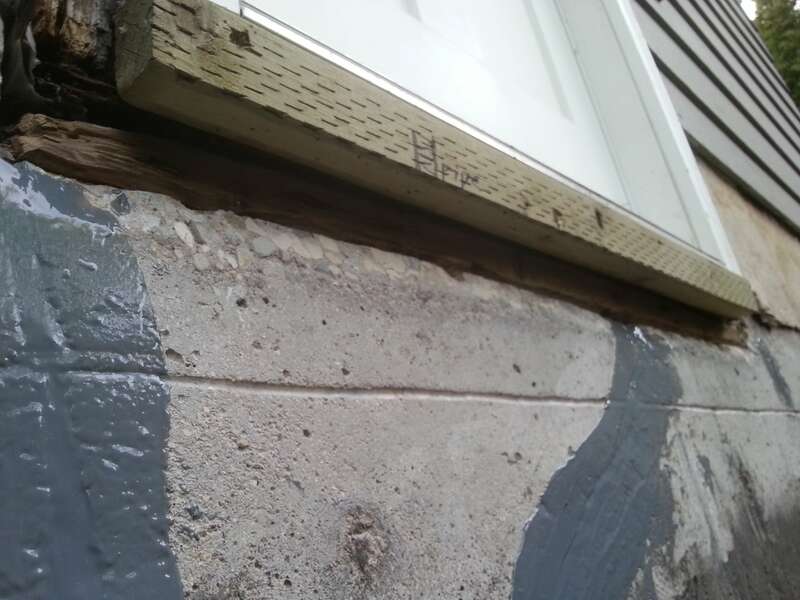 If the moisture is trapped between the tape and the wall, it’s coming from outside! 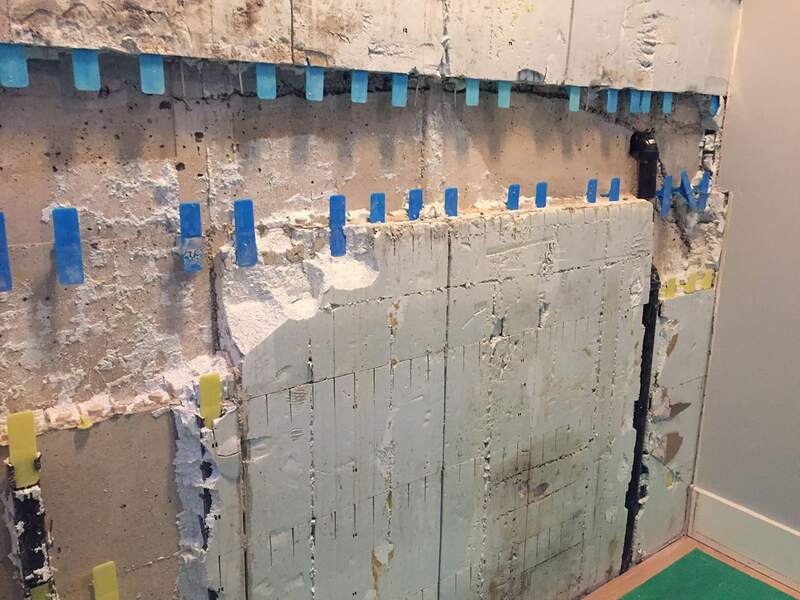 Technical advancements now allow the construction industry to view or scan accumulated moisture or temperature variances without disturbing the finished interior wall. 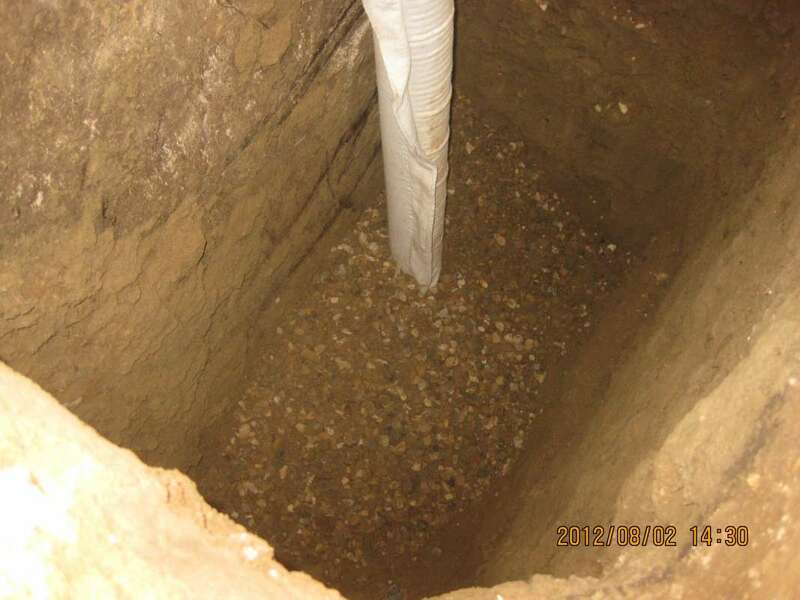 Though this technology is available, it can be costly and the results over emphasized. 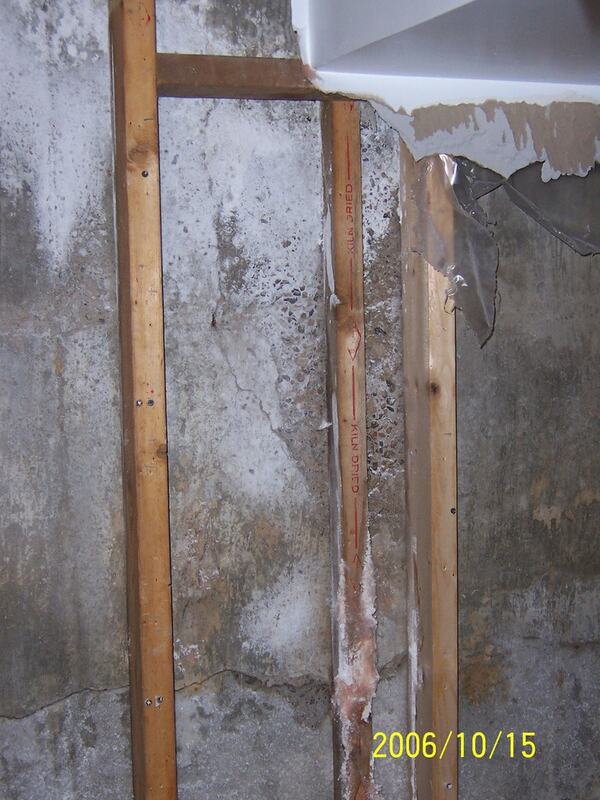 These very precise scanned readings will show moisture or temperature differences, but moisture in the wall does not always imply a cracked or leaky wall. 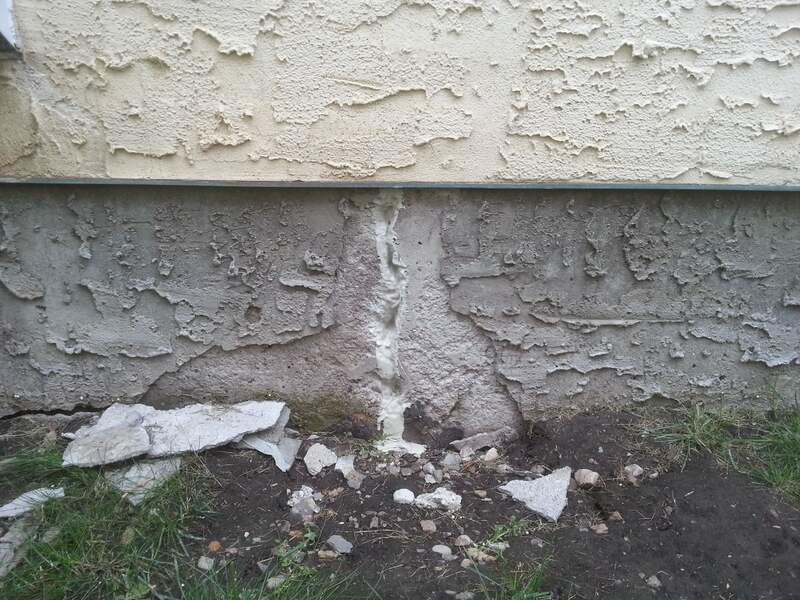 Moisture can accumulate in a concrete wall for a multitude or reasons. 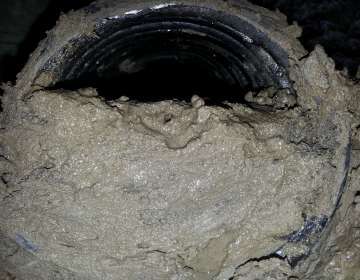 The challenge then focuses on investigating what those causes might be. 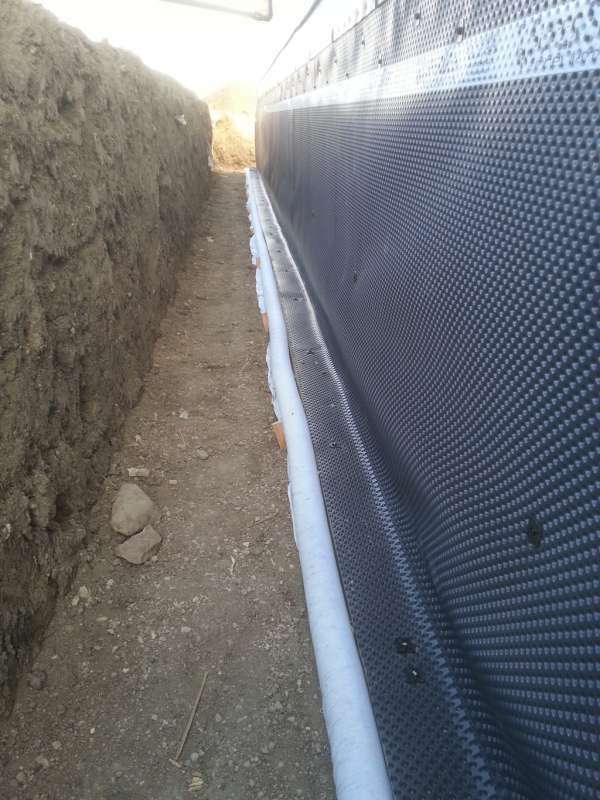 Is it the construction of the building, or is it environmental influences – or both? 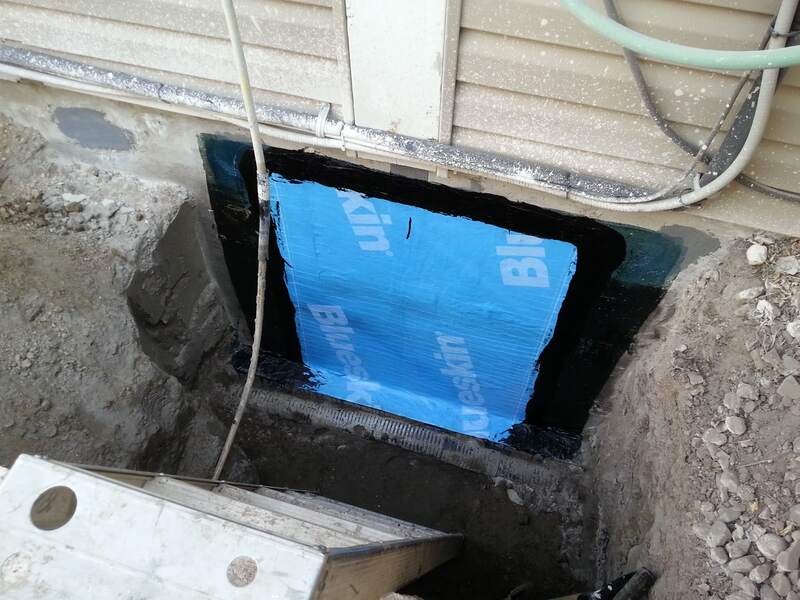 The investigation into what is causing the leak is as important as repairing the problem. 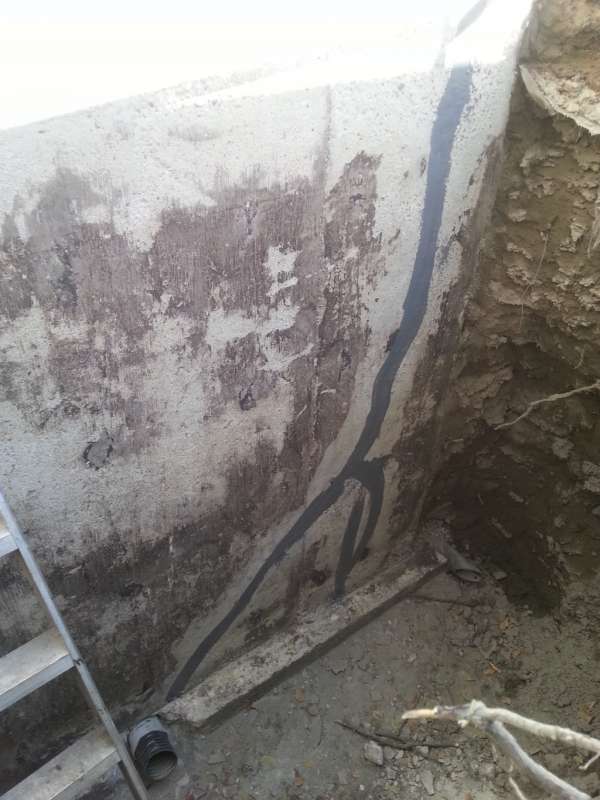 It is always best to conduct the investigation when the problem presents itself – not after the fact when the moisture has dried up. 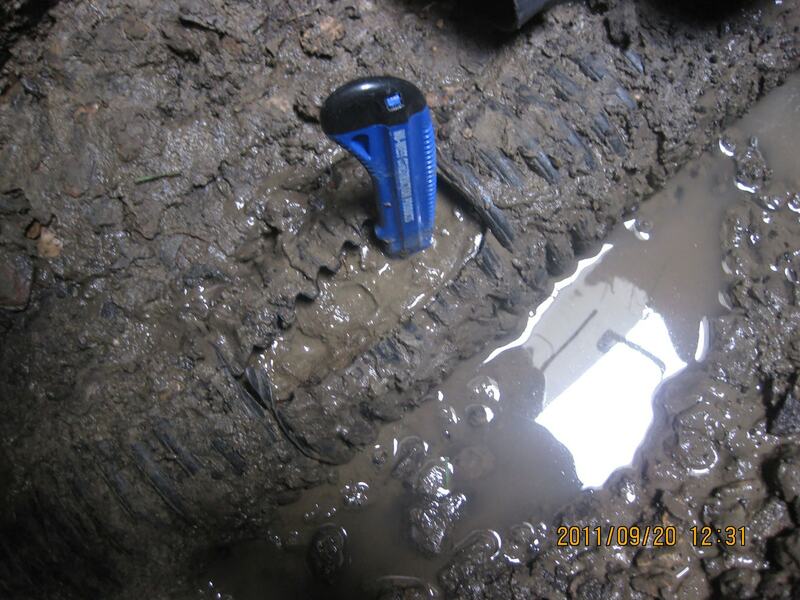 One type of “non-destructive” investigative tool is thermal imaging. 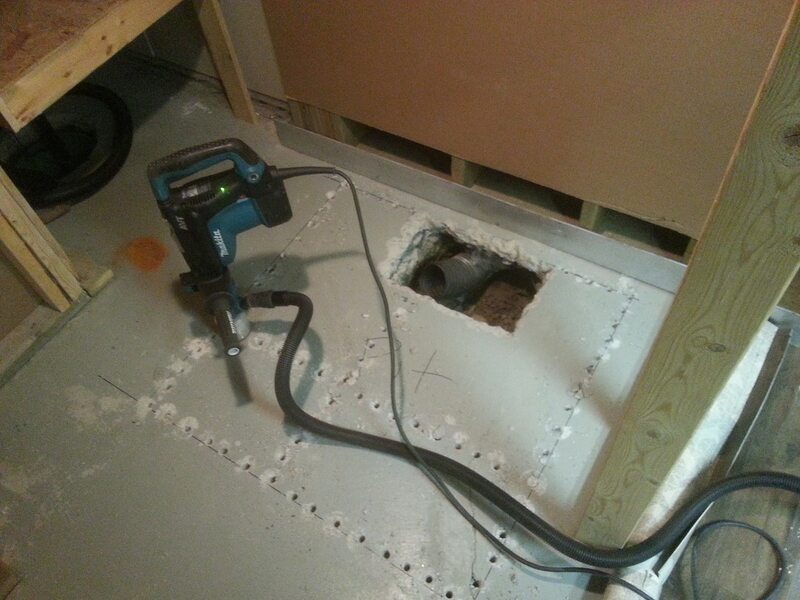 When the basement has water leaking into it, a thermal imaging scan can pin-point the area where the water is entering, thus helping both the homeowner and contractor focus on a specific wall or floor area to expose instead of the whole basement. 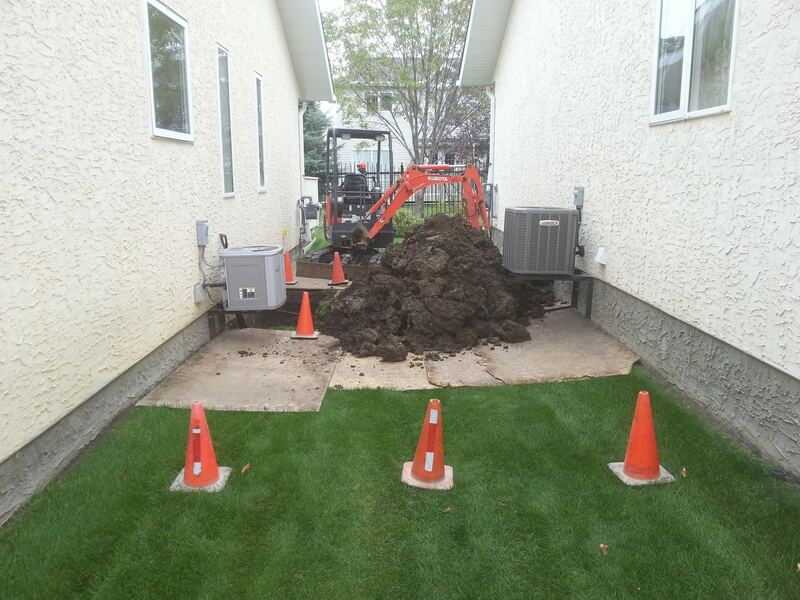 This translates into a cost savings for the customer. 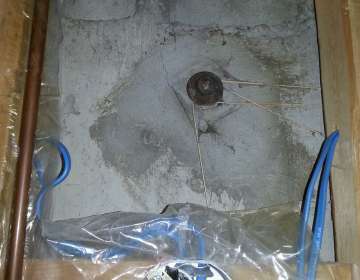 Concrete and wood moisture meters can also provide some insight as well. 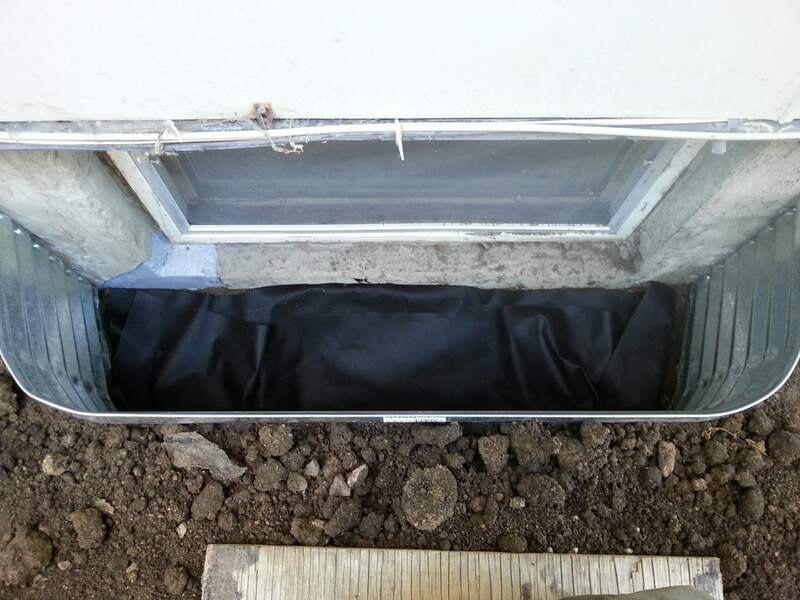 However, neither thermal imaging, nor moisture meter readings alone, can determine what is causing the water to gain entry. 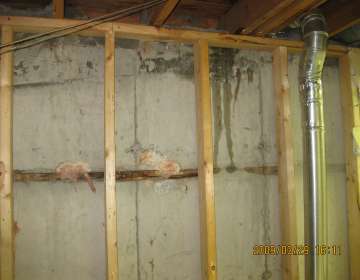 For this final investigative step to happen, the affected wall or floor area must be exposed for viewing. 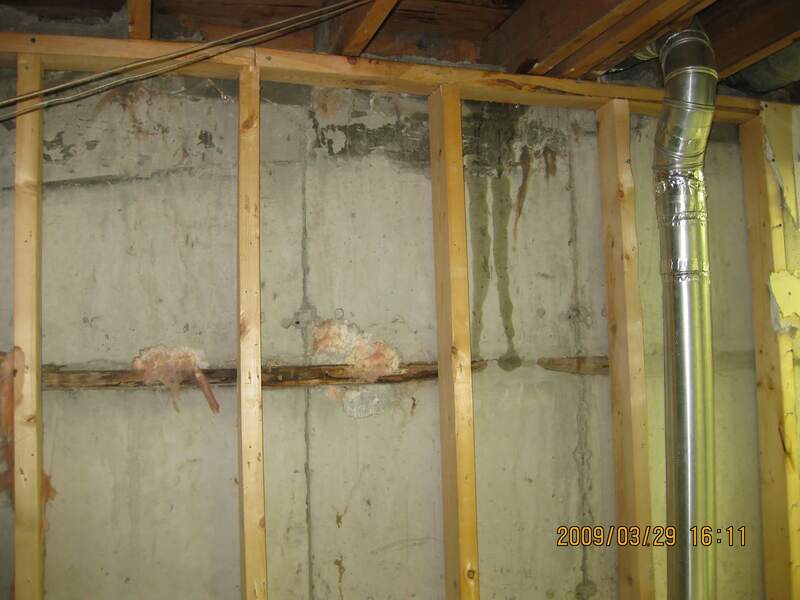 When investigating the causes of a leaky basement, many homeowners fail to understand the importance of opening up the wall or floor for viewing. 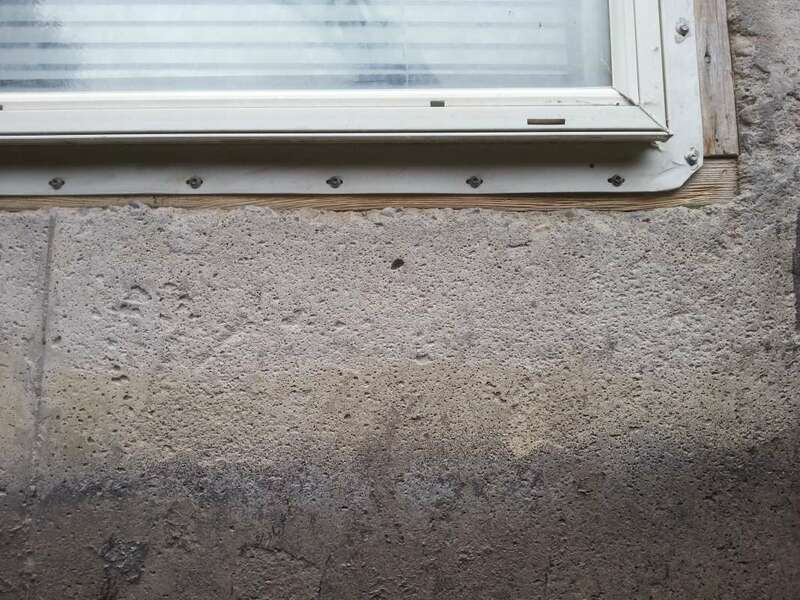 Aside from it being the only way to determine the cause for water entering the living space, it is also the only way to dry-out, clean-up and prevent mold from developing behind the wall or under the floor covering. 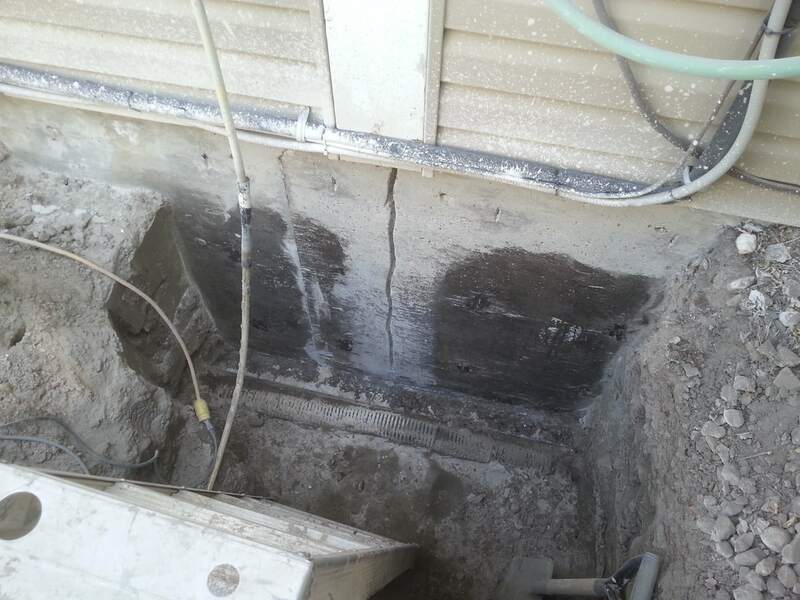 For example, seeing a leaky crack on the interior basement wall and then pinpointing its exterior location within a few inches for excavation and repair is less costly than randomly excavating along a basement wall in hope of finding the problem area. 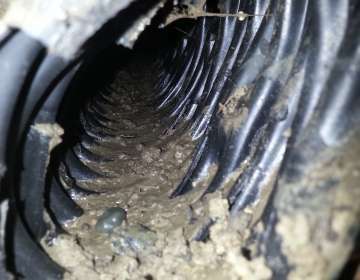 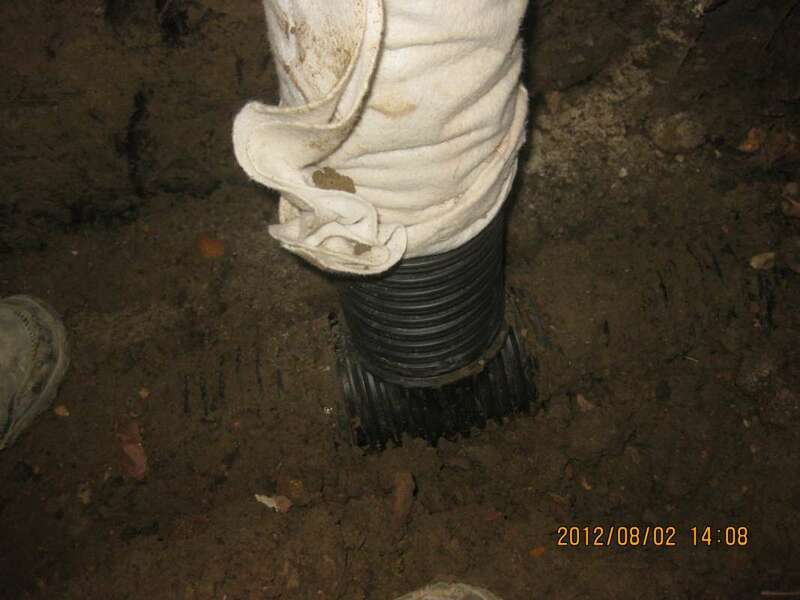 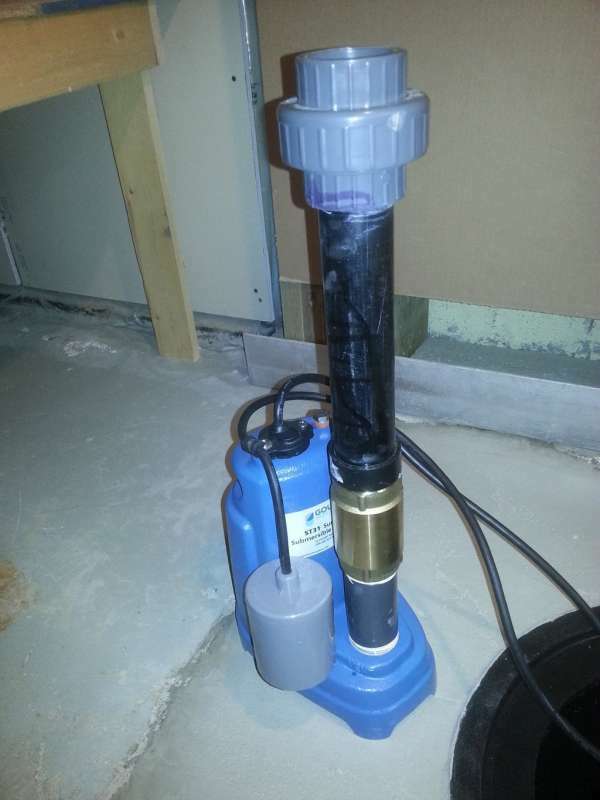 See the Portfolio below for more images to help you trouble shoot your basement leak! IS A CRACK SUSPECTED TO BE THE CULPRIT OF YOUR WATER LEAKAGE? 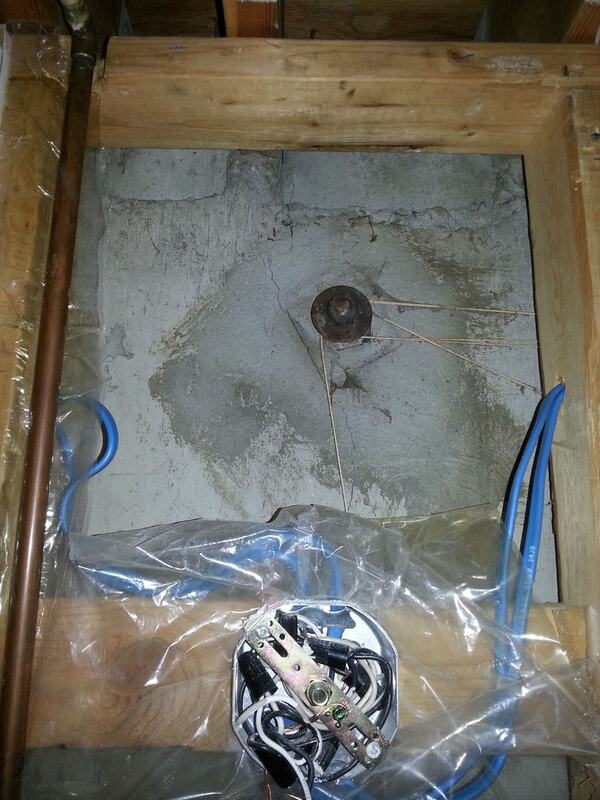 If a crack is suspected to be the culprit of your water leakage, you should always inspect the inside wall first. 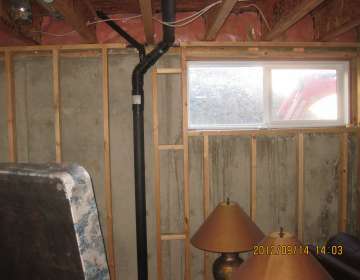 This will require the removal of any drywall or wall board in the area of the accumulated moisture. 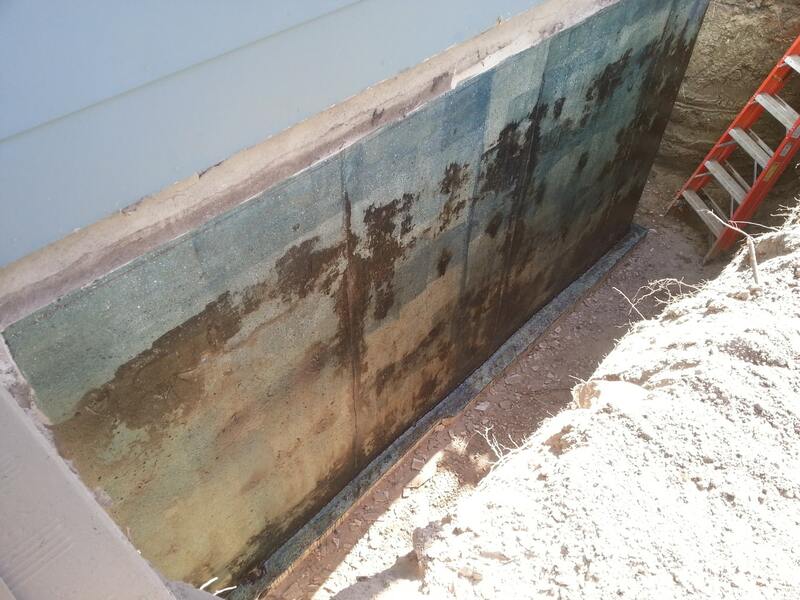 The insulation, wall studs, and interior foundation wall itself should be visually inspected for moisture, cracks, or large pores in the concrete, plus any signs of mold. 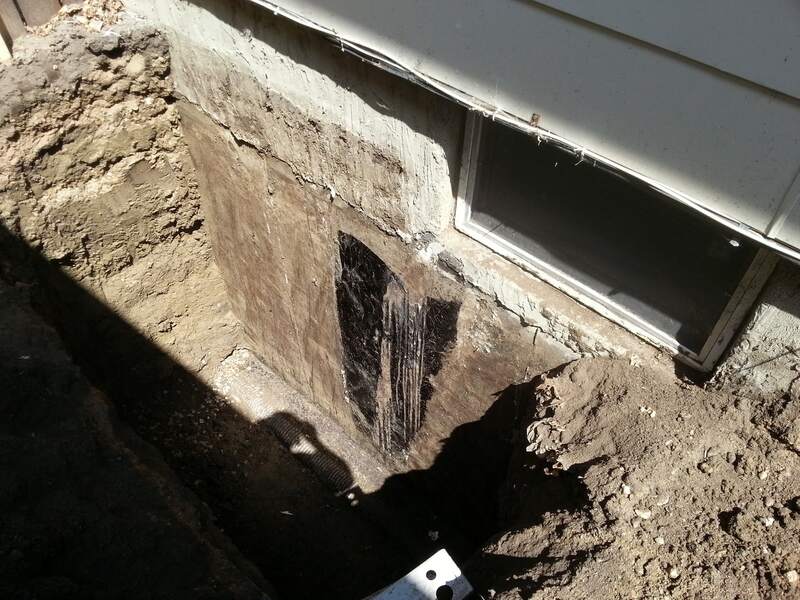 If your house foundation was constructed using cinder block or treated wood, the method of trouble shooting remains the same. 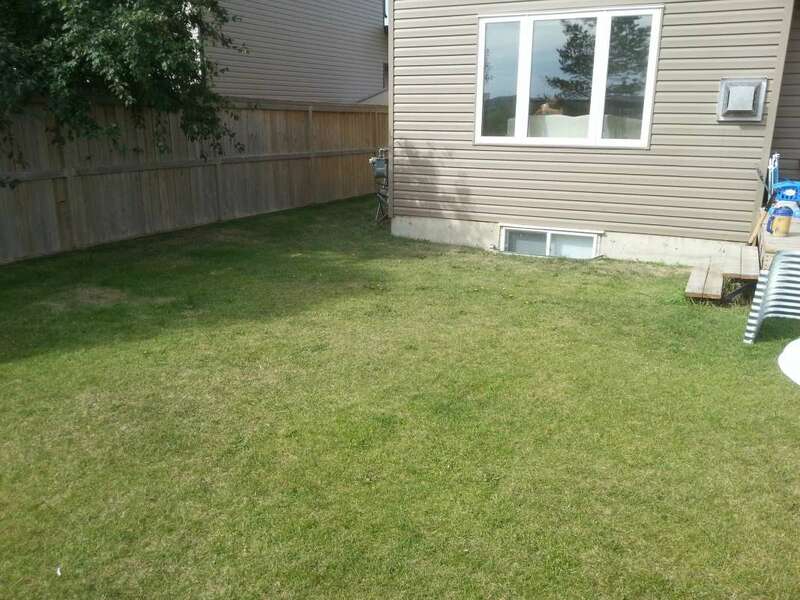 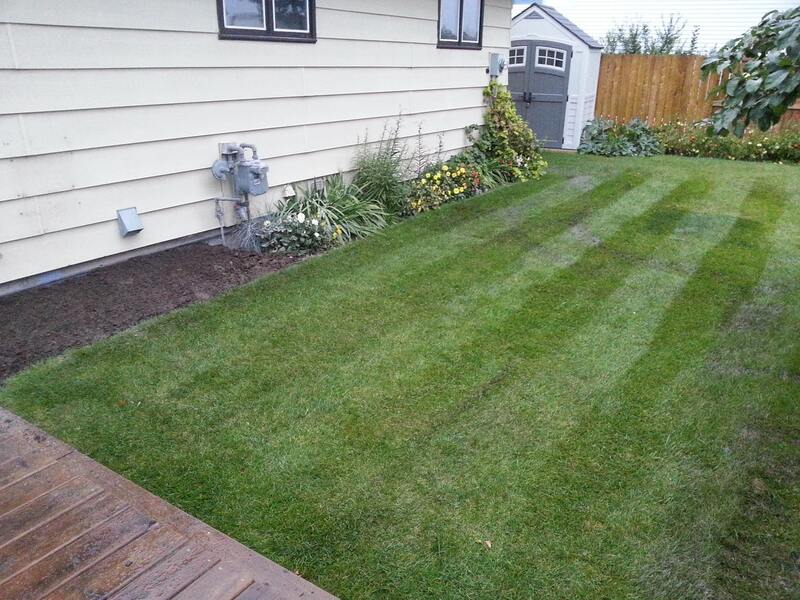 HOW IS THE GRADE OR LANDSCAPE OF YOUR YARD? 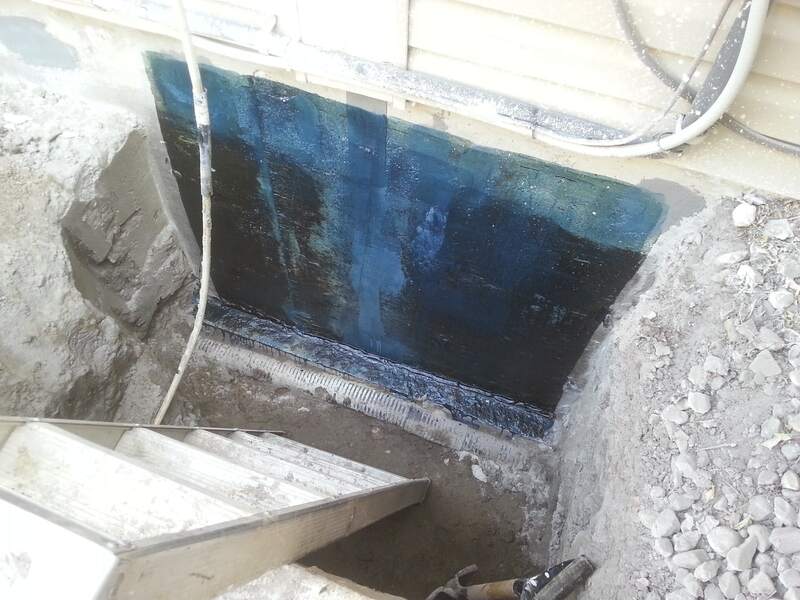 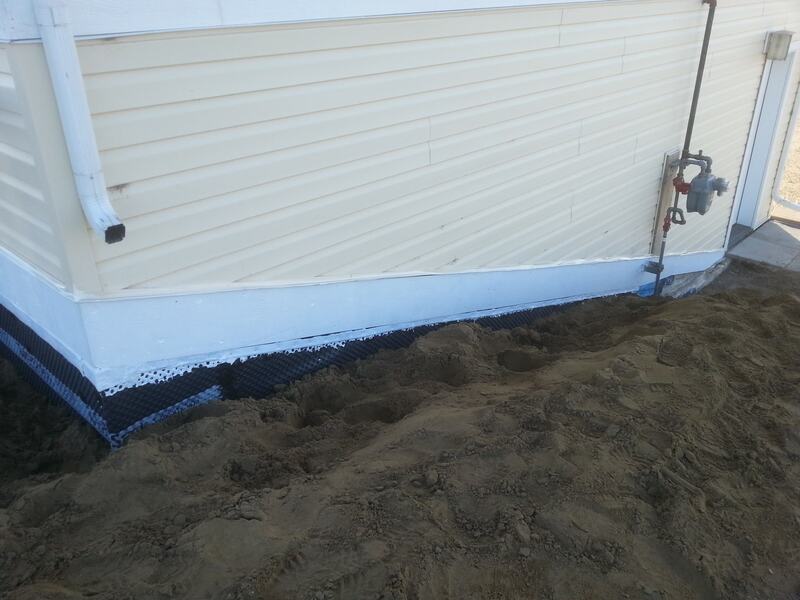 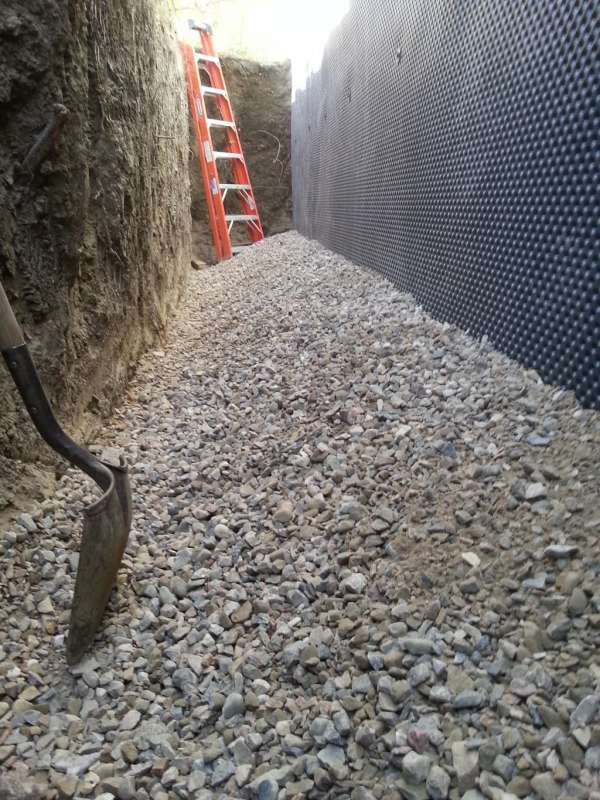 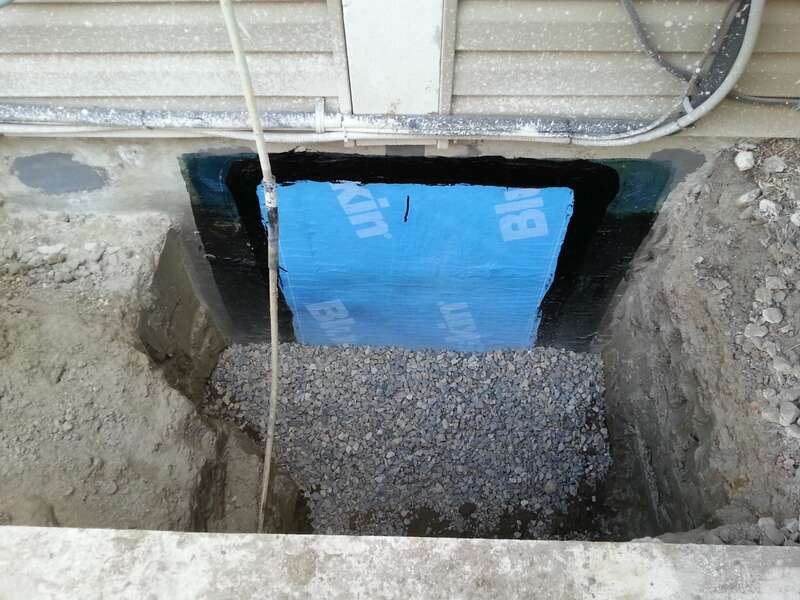 Even though the best repair method is to seal up a leaky basement by exterior waterproofing, homeowners must always consider that easy preventative maintenance will come from a properly sloped or graded yard. 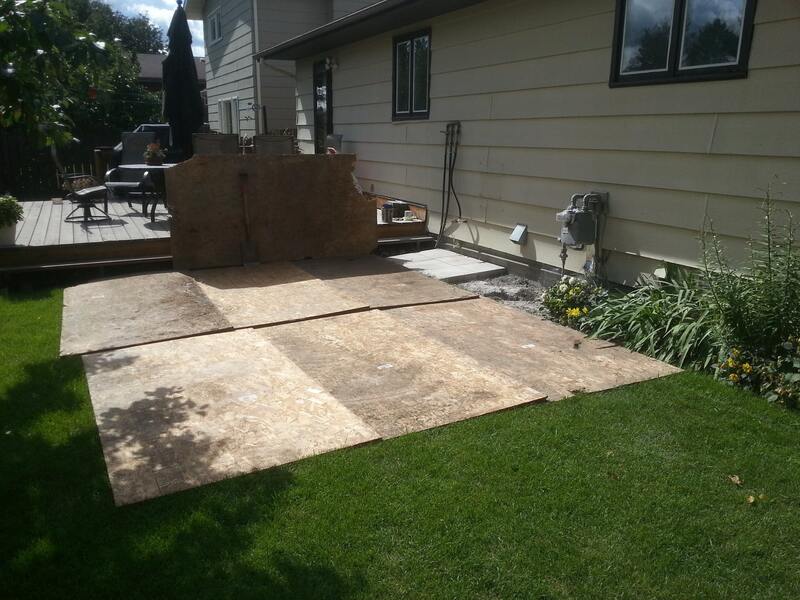 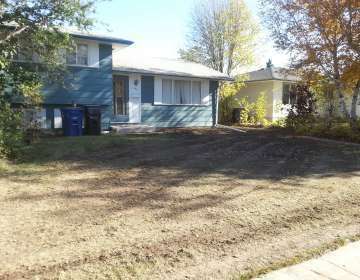 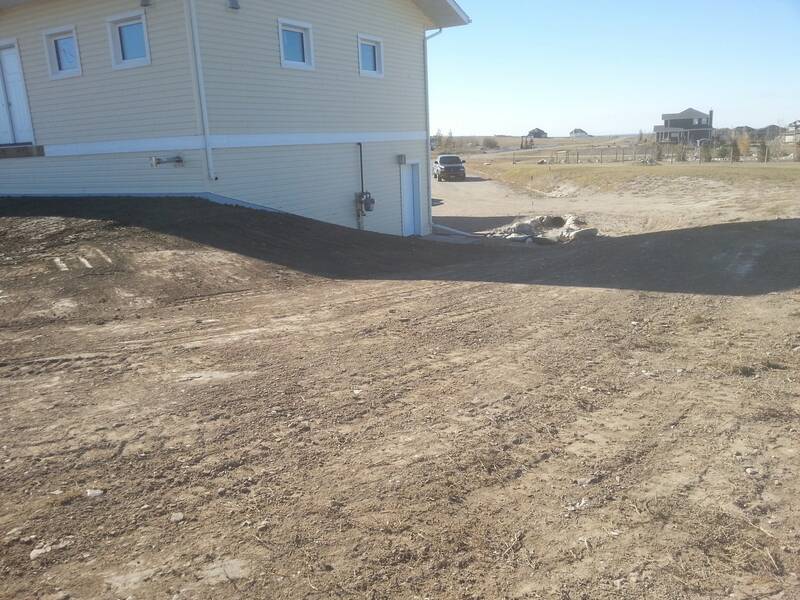 Proper landscape methods will assist in allowing water to roll off and away from the house foundation. 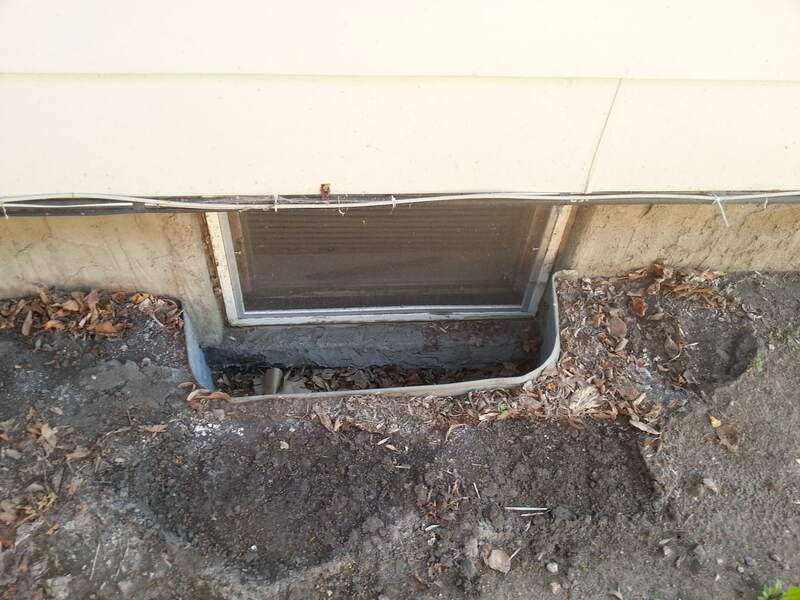 Additionally, homeowners with water logged window-wells may also be able to drain water away with properly installed window-well drainage systems. 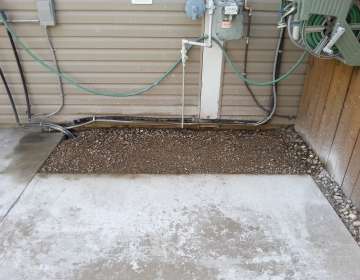 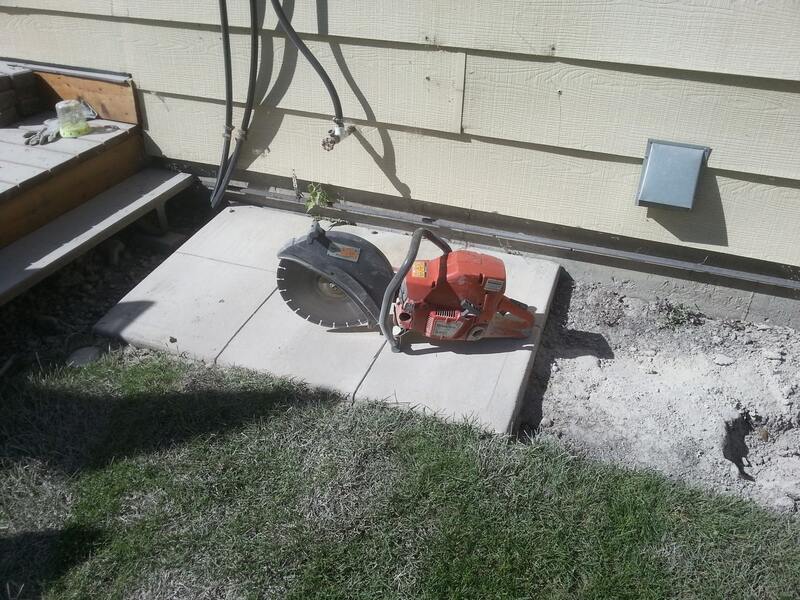 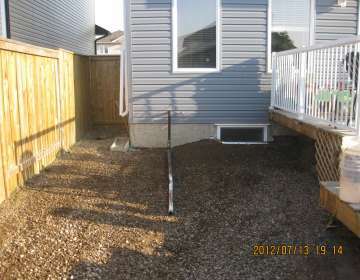 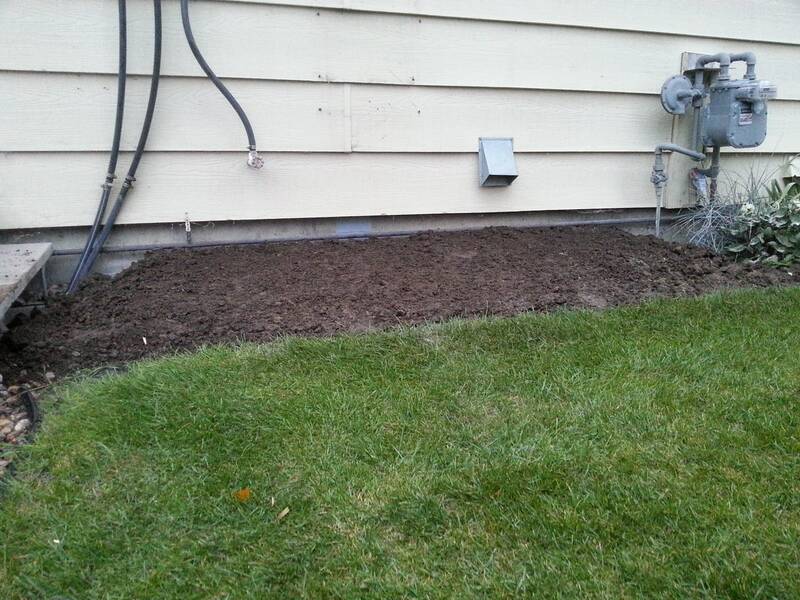 It is important to remember that proper grade or landscaping will not fix a leaky basement. 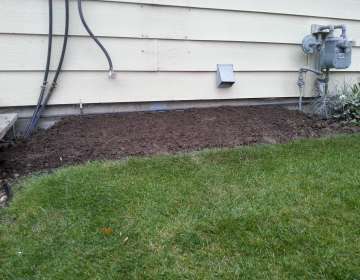 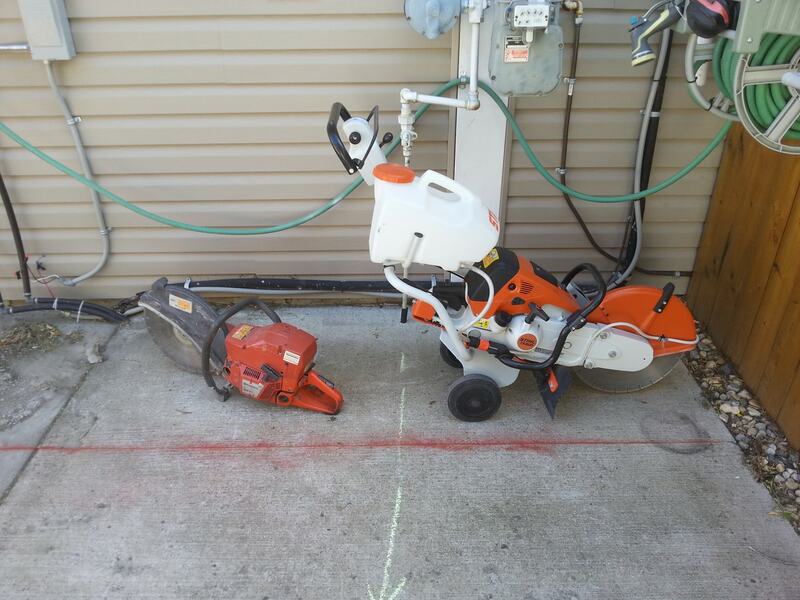 It does represent the preventative maintenance that is needed for the house and yard. 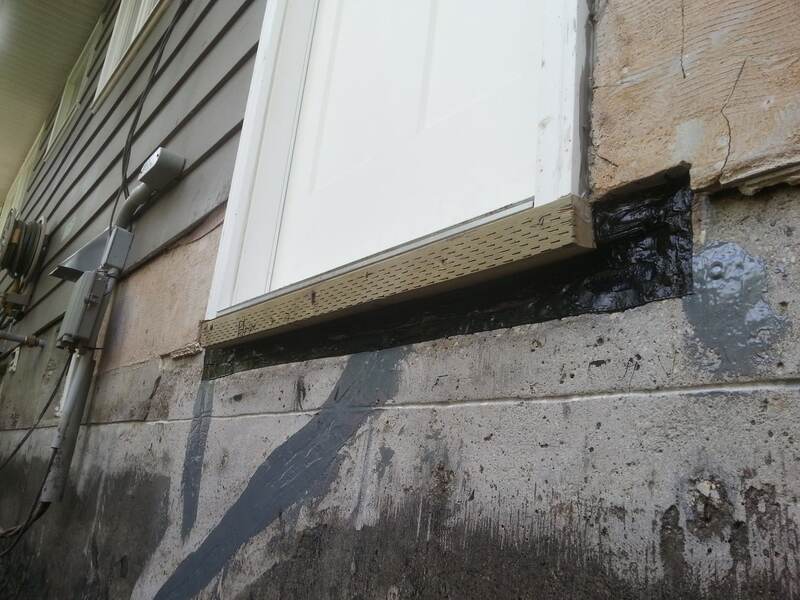 At the right time of year, and under the right weather conditions, water can still find its way into the affected basement area if things don’t get repaired properly. 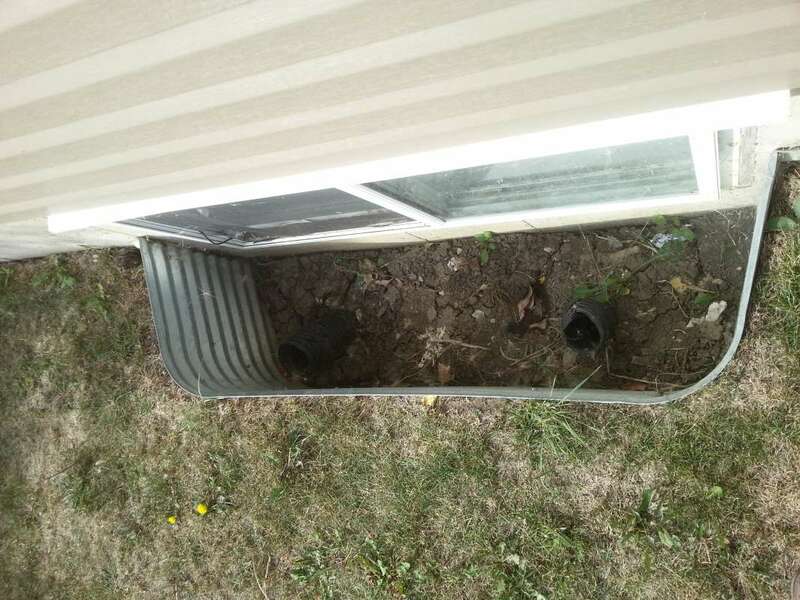 COULD IT BE THE EAVESTROUGH AND DOWNSPOUTS? 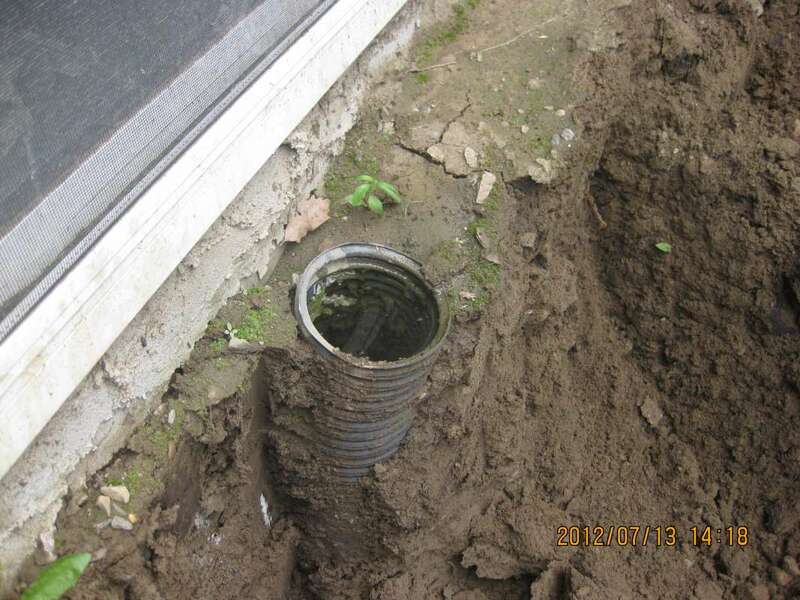 Your house may still have a crack that needs waterproofing, but the efficiency and placement of your eavestrough and downspout can make the difference between getting some moisture in your basement, or getting gallons of water in your basement. 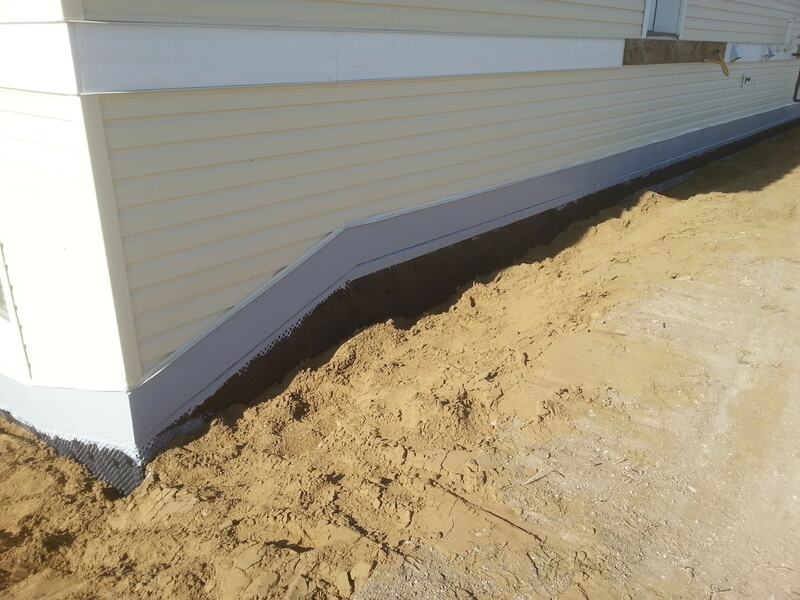 If you don’t have eavestroughs, then get them. 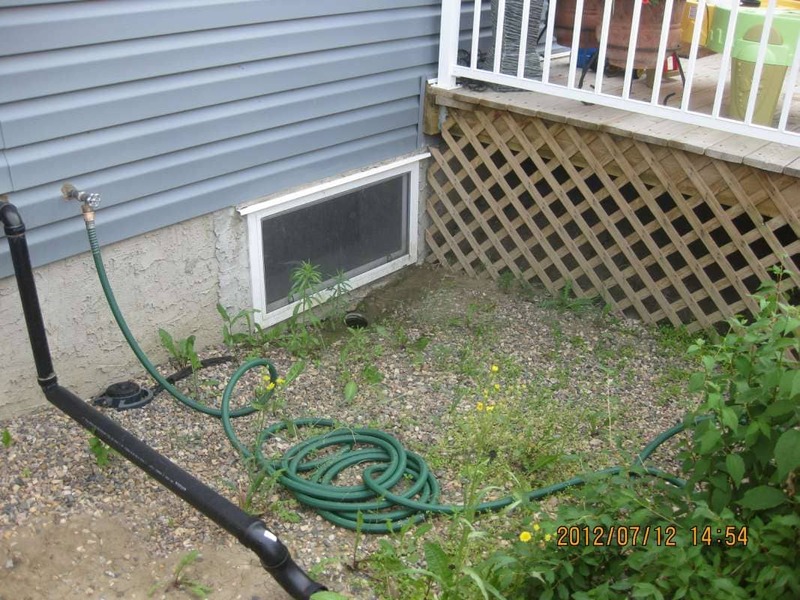 Make sure that the system isn’t plugged up with seasonal debris such as leaves and branches. 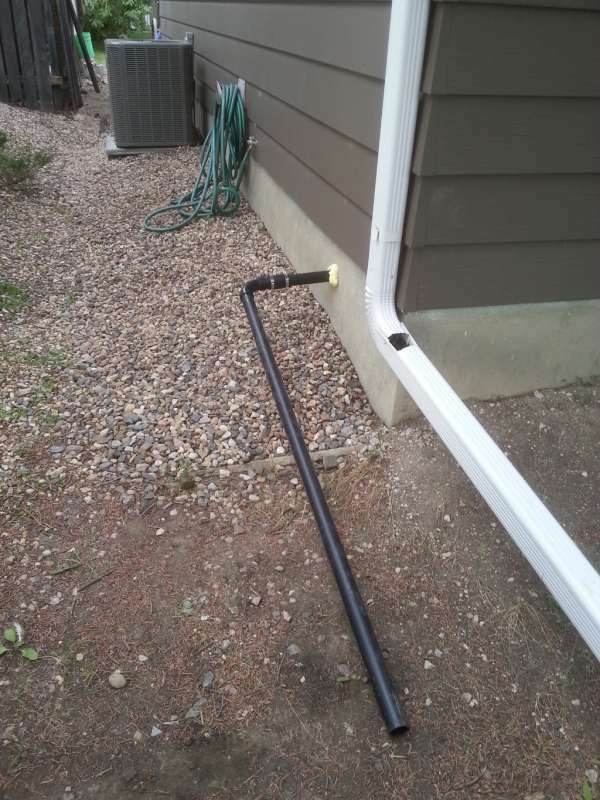 Make sure that the water can flow. 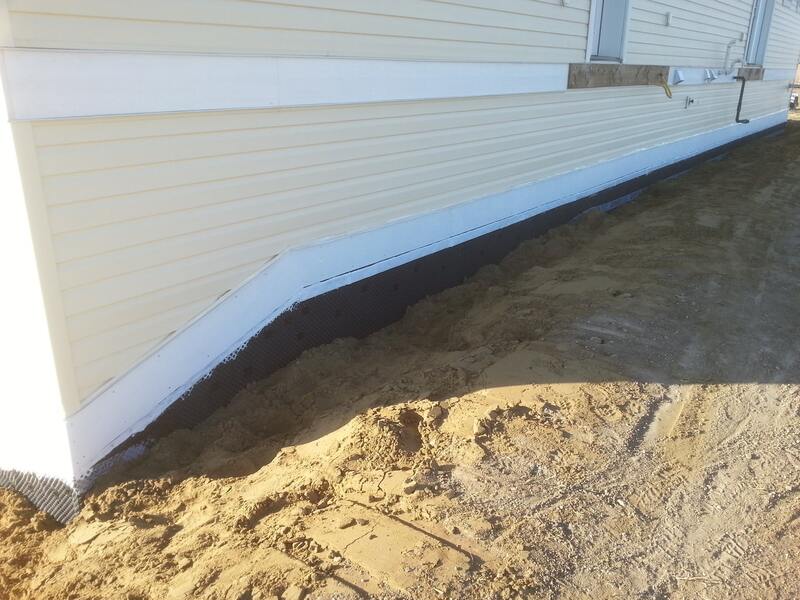 Finally, ensure that the water flowing out of the eavestrough and through the downspout, is travelling well away from the house foundation. 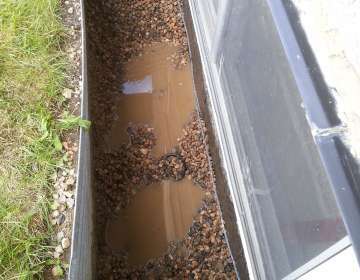 Rainwater off a roof translates into allot of gallons. 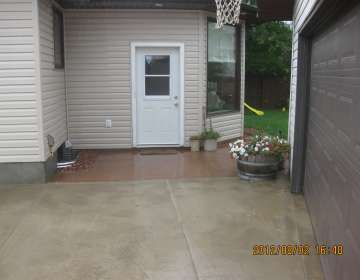 For example, a 1500 sq/ft. 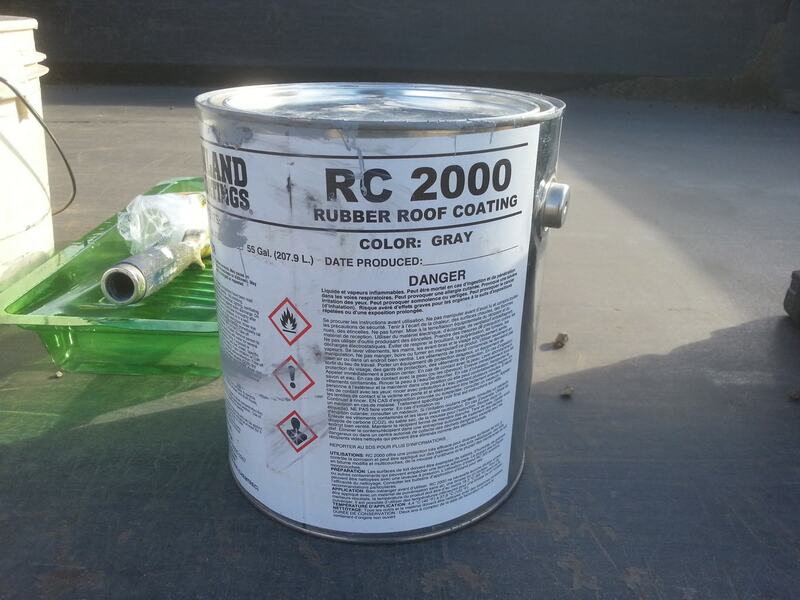 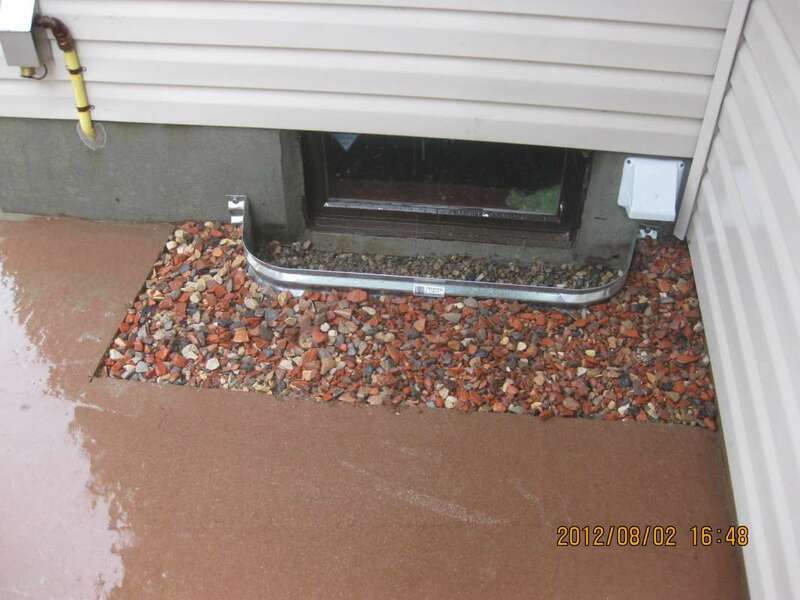 roof can shed almost 1000 plus gallons of water during a heavy rain. 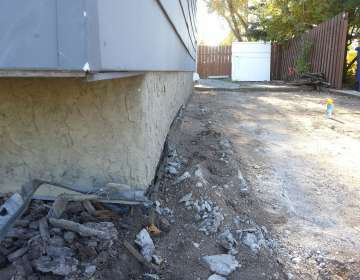 The house foundation and weeping tile (if installed) can only handle so much water before it too will fail. 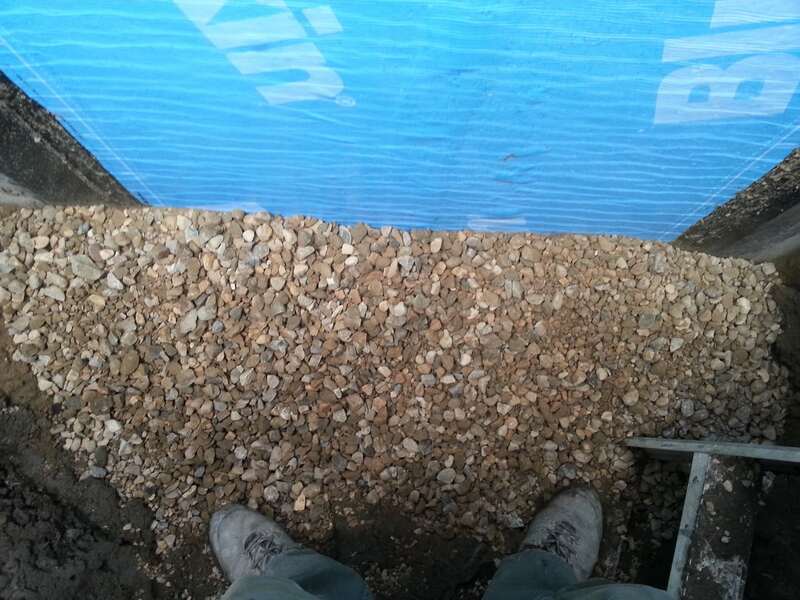 Everything has a limit. 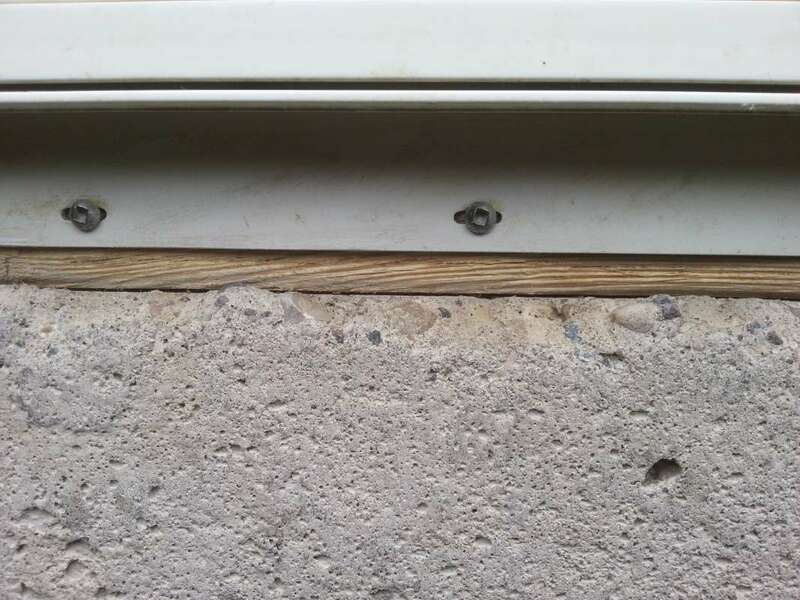 Through cold-joints in the concrete. 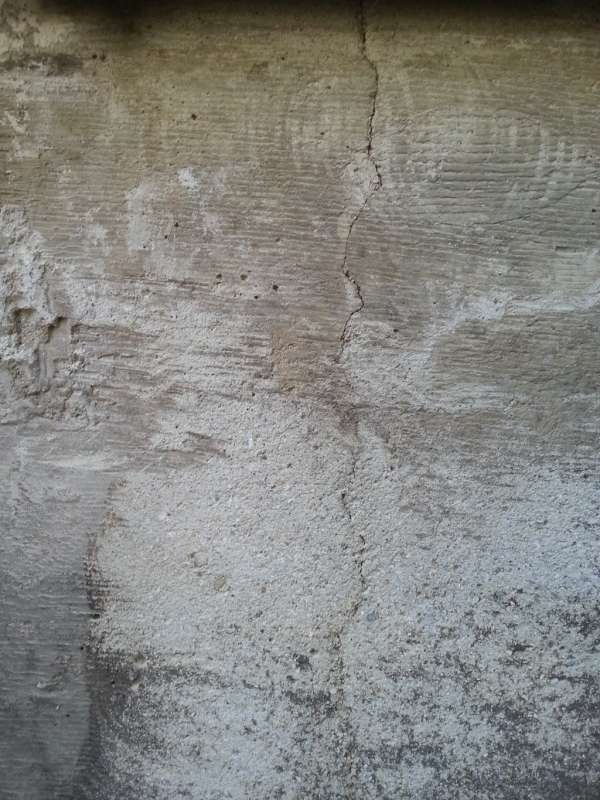 These are essentially areas where concrete was poured at two different times and never formed a bond. 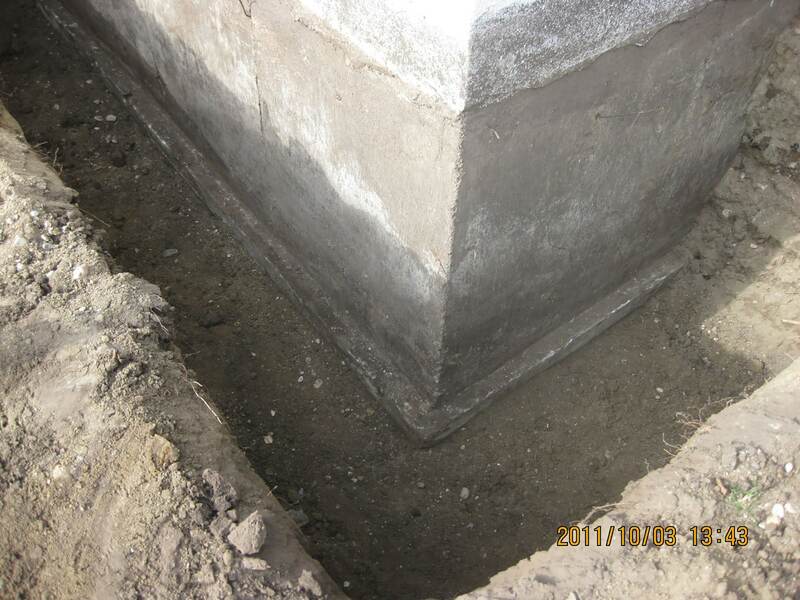 One common cold-joint is the area between the foundation wall where it sits on the footing. 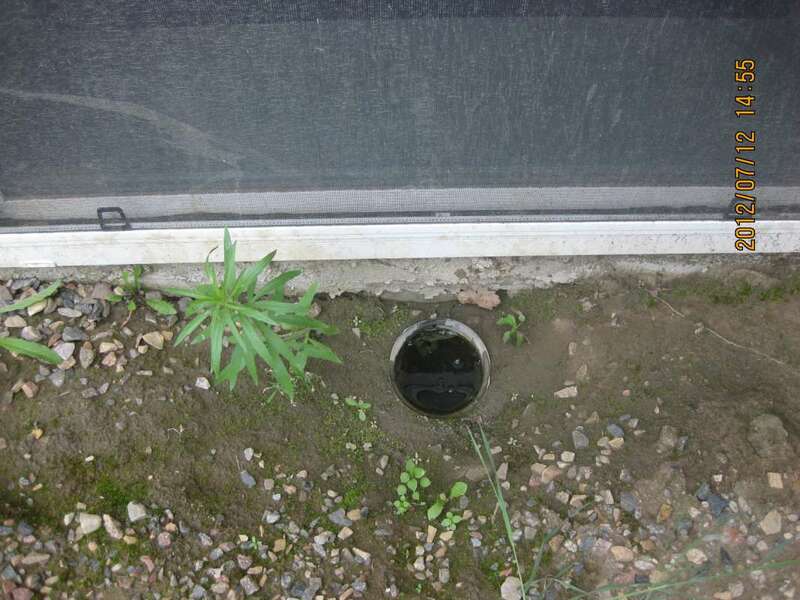 This area is primarily protected from water by the weeping-tile, but for those homes not equipped with weeping-tile, the environmental stressors a house face can become damaging. 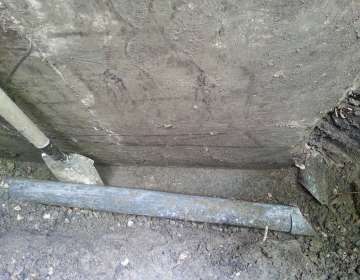 Where ever exposed metal in the concrete has rusted out and allowed a pathway for the water to enter. 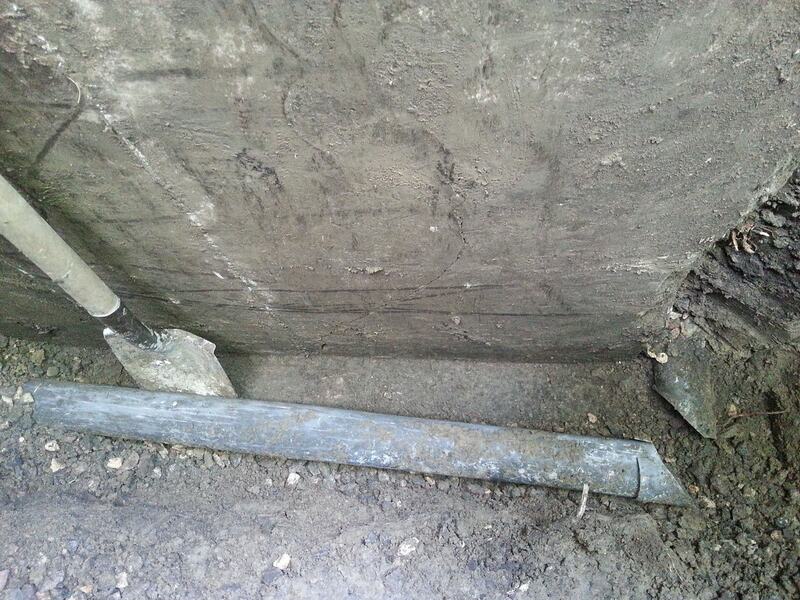 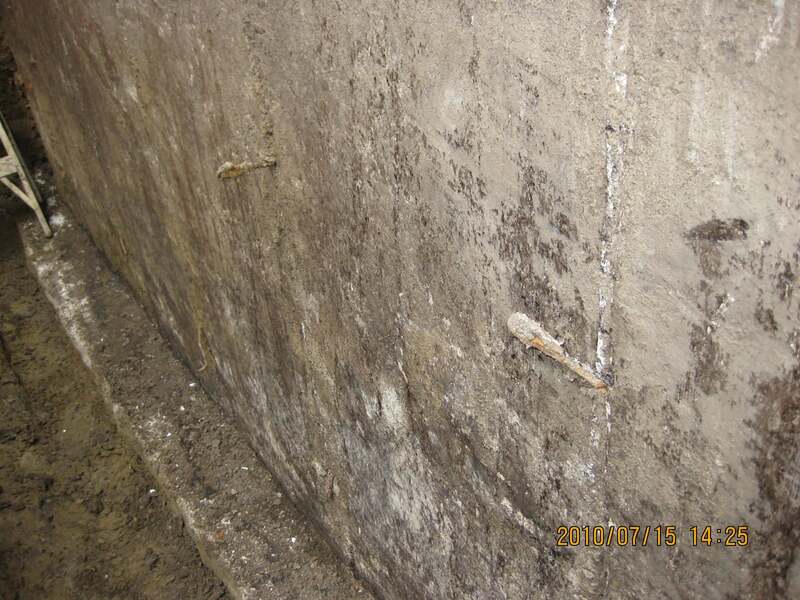 Rebar and tie marks are common culprits, as are the support hangers for precast concrete stairs. 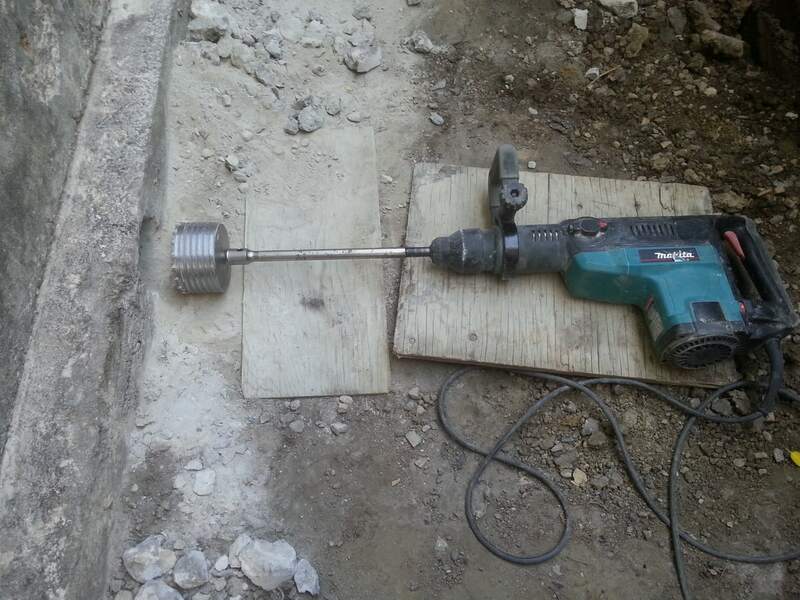 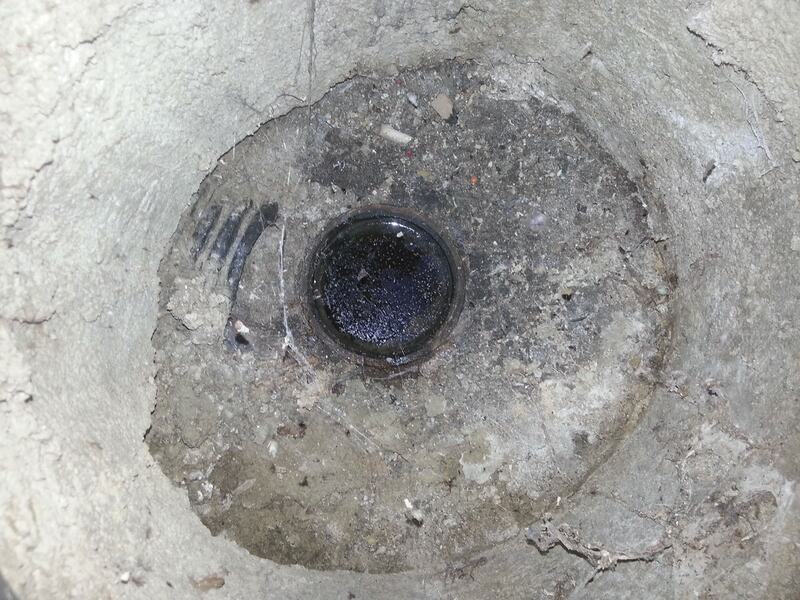 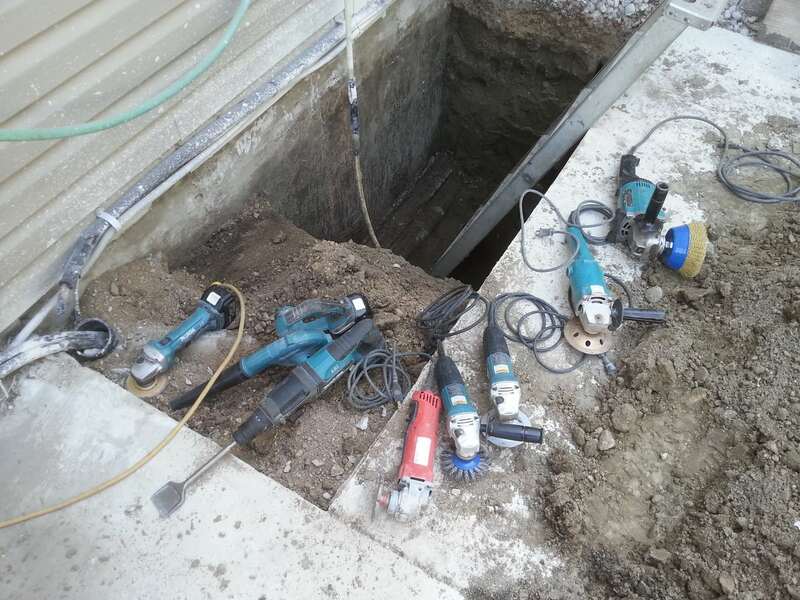 Holes drilled in the concrete foundation for utilities which are below grade. 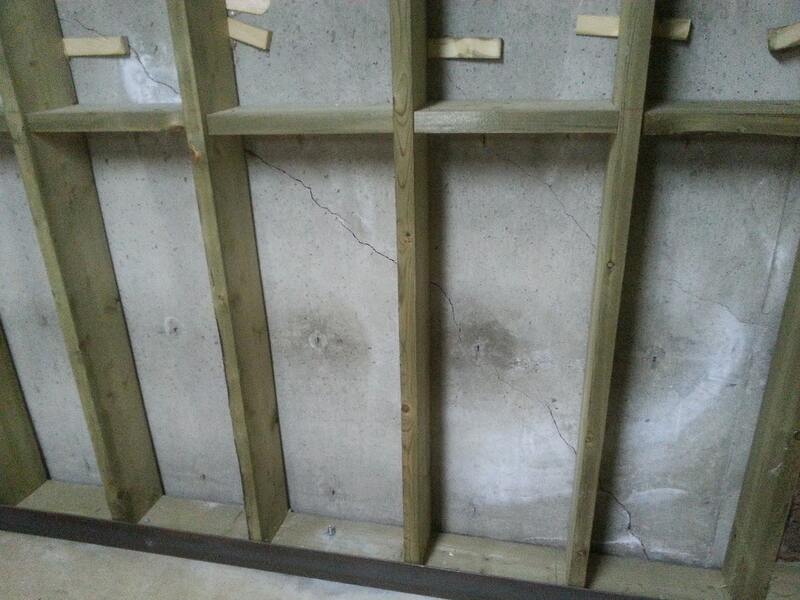 Structurally damaged walls, The walls have flexed or bowed under the environmental stressors. 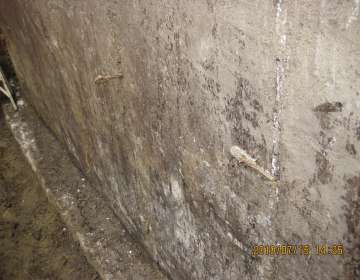 Concrete that is pitted or has voids within the wall. 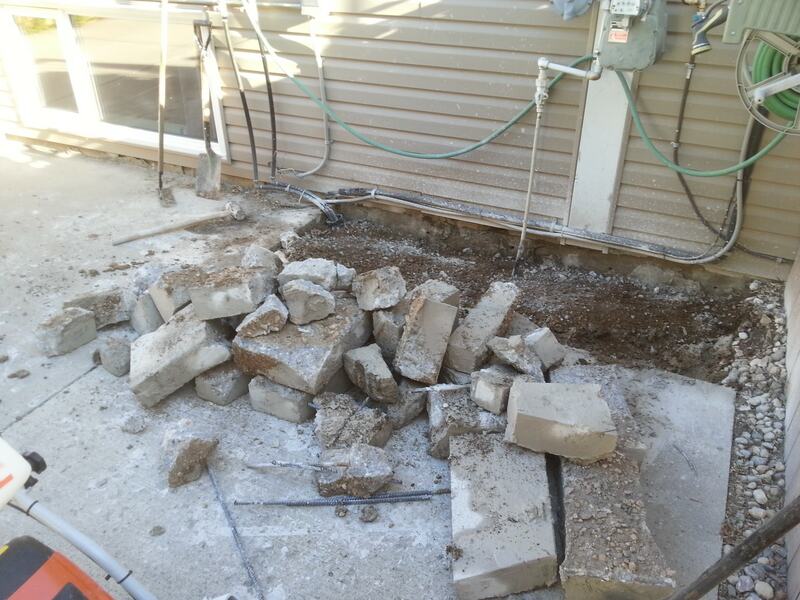 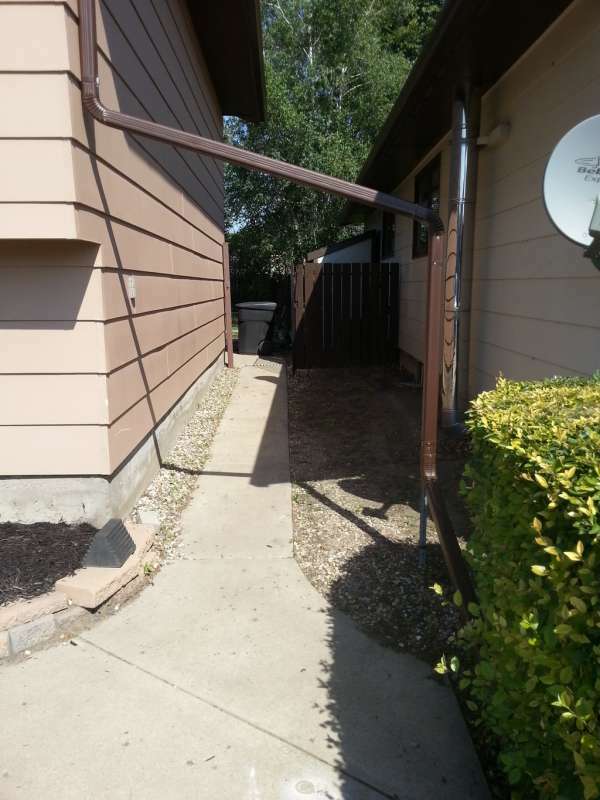 These often occur during construction, but the effects of poor workmanship won’t show up until much later. 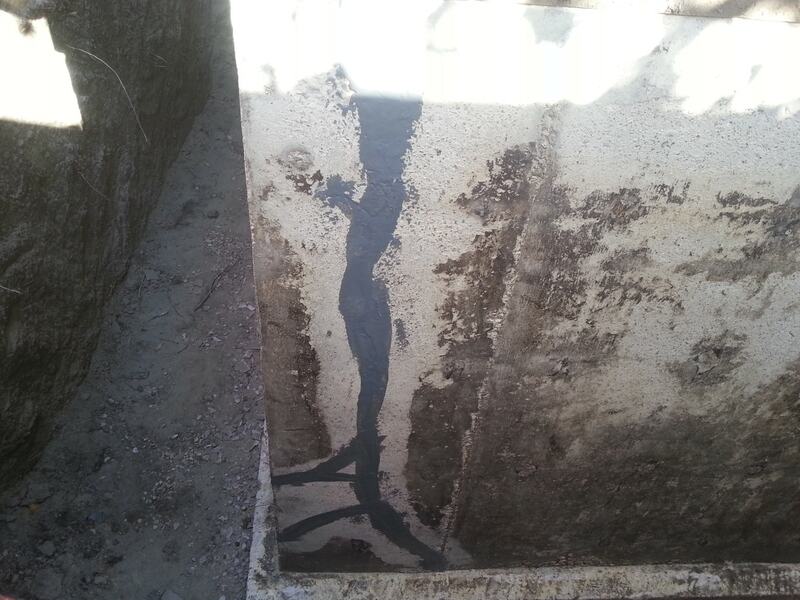 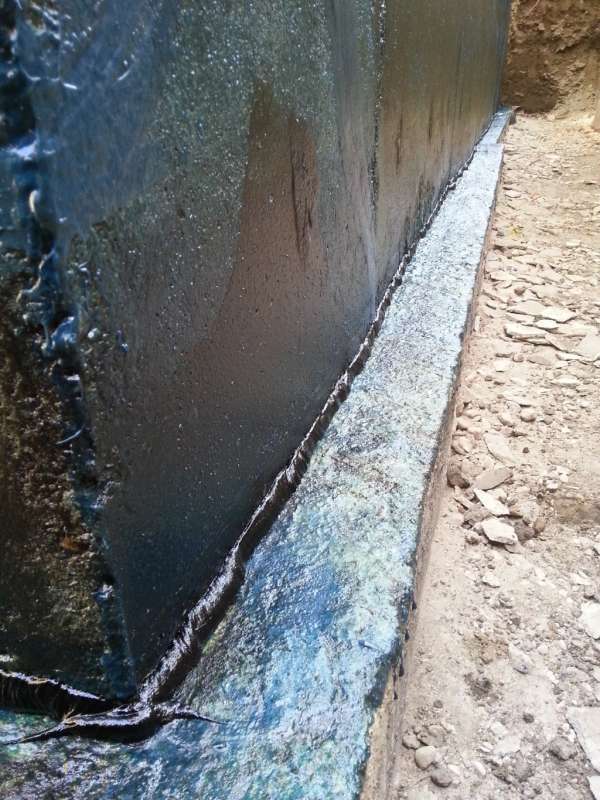 One such example is seen in low quality concrete pours in ICF foundation construction. 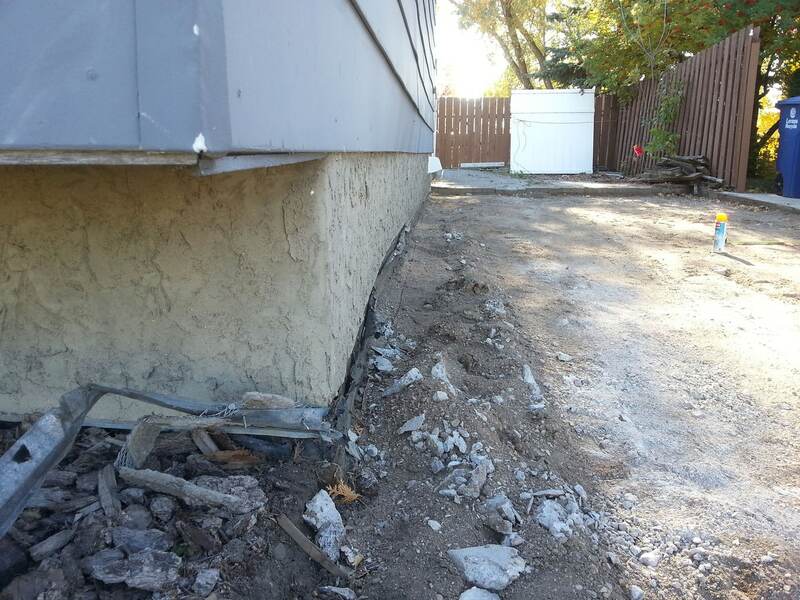 This style of foundation may offer home owners a higher insulation rating, but it never reveals the quality of the concrete pour for inspection purposes. 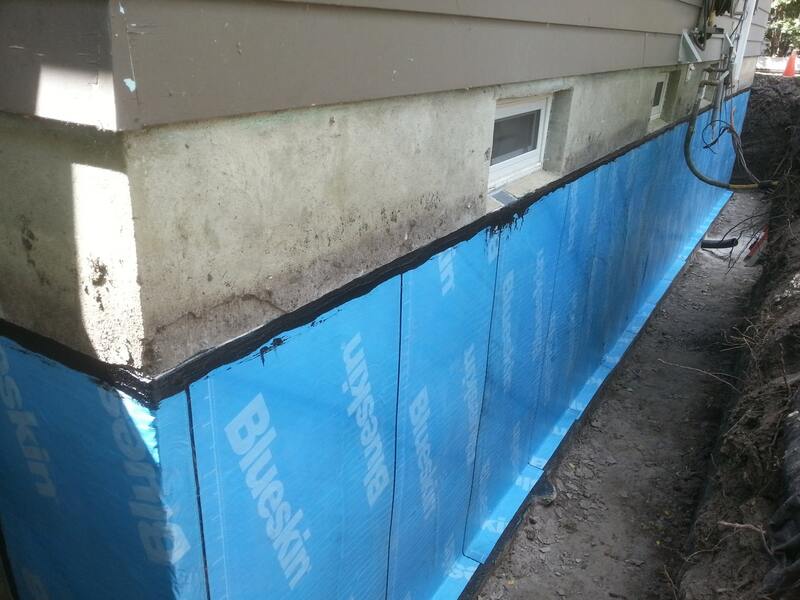 The attached insulation on both sides of the concrete always conceals any flaws that may exist in the concrete, and contrary to popular perception, the foam insulation is not a waterproofing product. This style of foam-insulated concrete wall also rejects many of the “non-destructive” leaky basement investigative methods, such as thermal imaging. 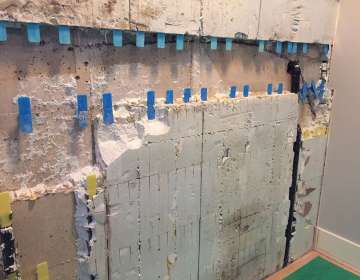 The only way to properly inspect the affected wall is through removing everything that is concealing the actual concrete. 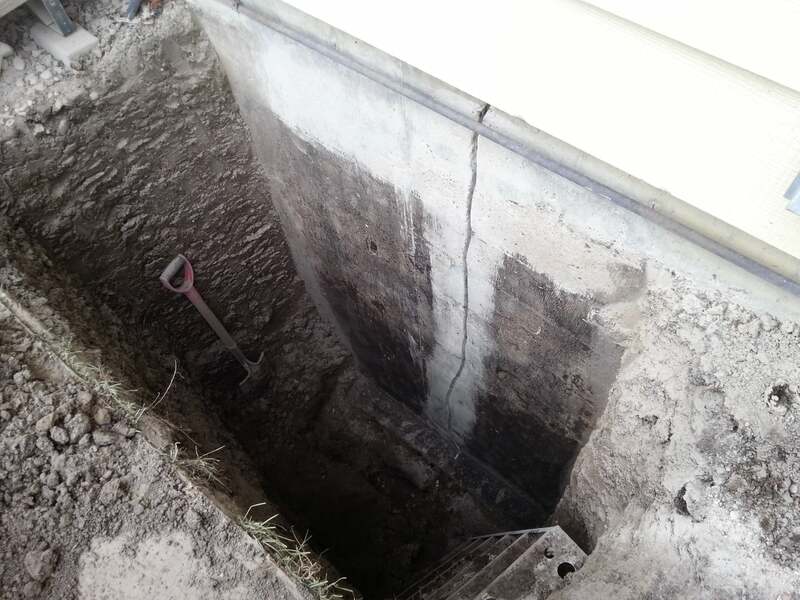 Cinderblock foundations can take on water through a crack or through any of the many mortar joints that make up the wall structure. 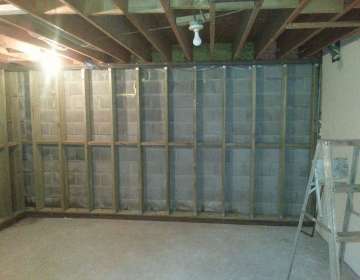 Based on the method of construction, the cinderblock wall is sometimes mostly hollow and can collect water much like a tank. 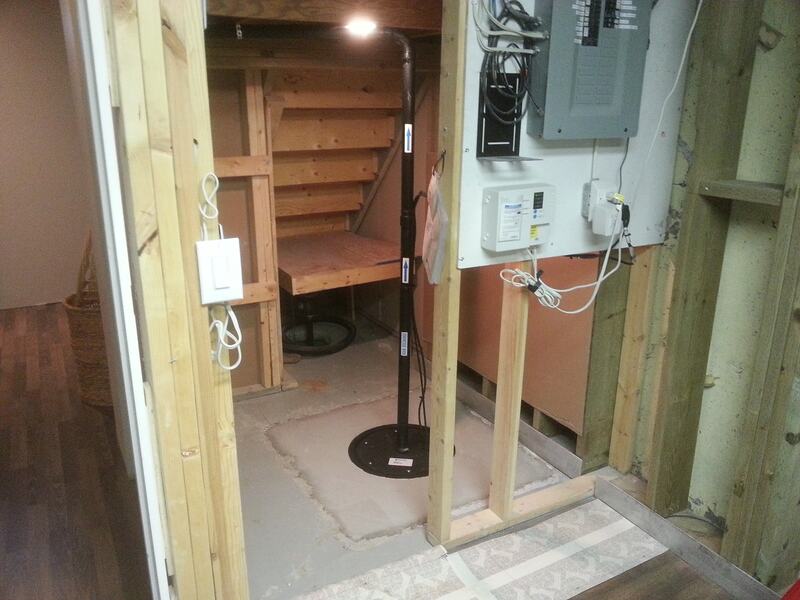 Eventually the water gets out – into the basement living space. 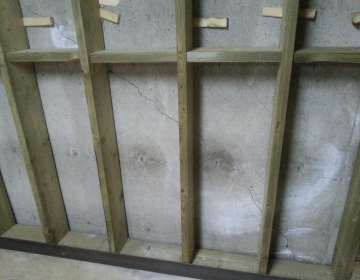 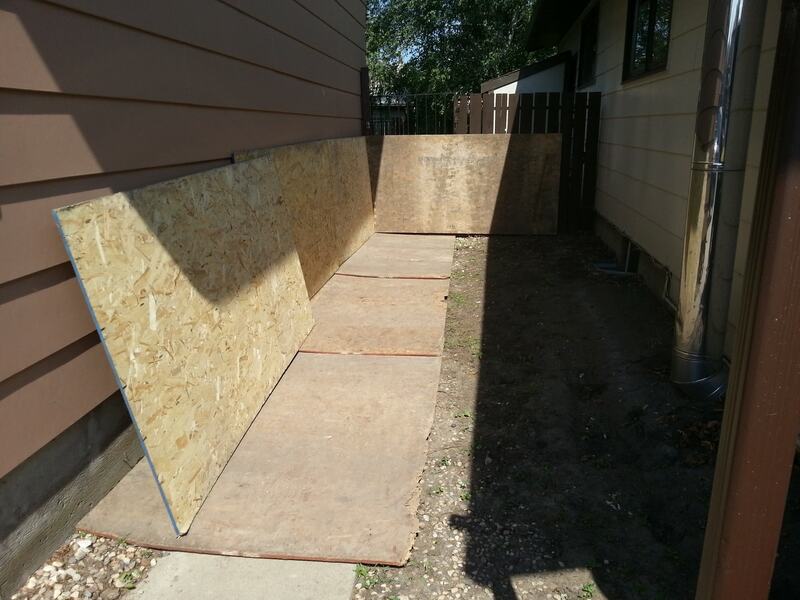 Wood foundations can leak through the plywood itself, or the joint between sheets of plywood. 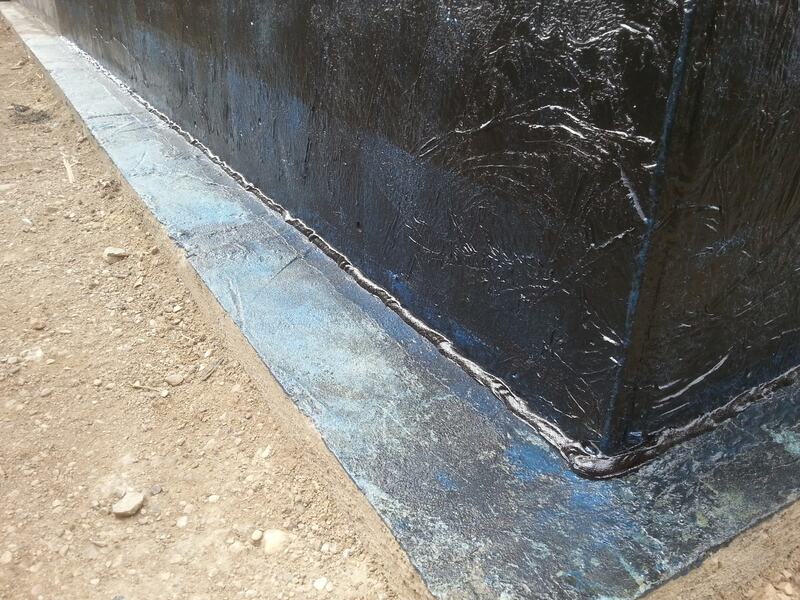 Many of these foundations were waterproofed with a plastic poly wrap (vapour barrier plastic). 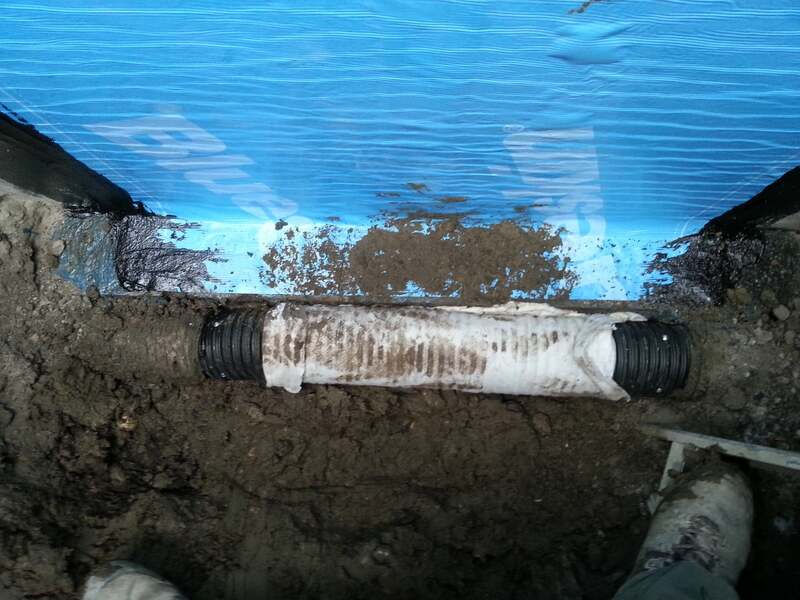 It takes very little to tear into this plastic and allow a pathway for water to flow. 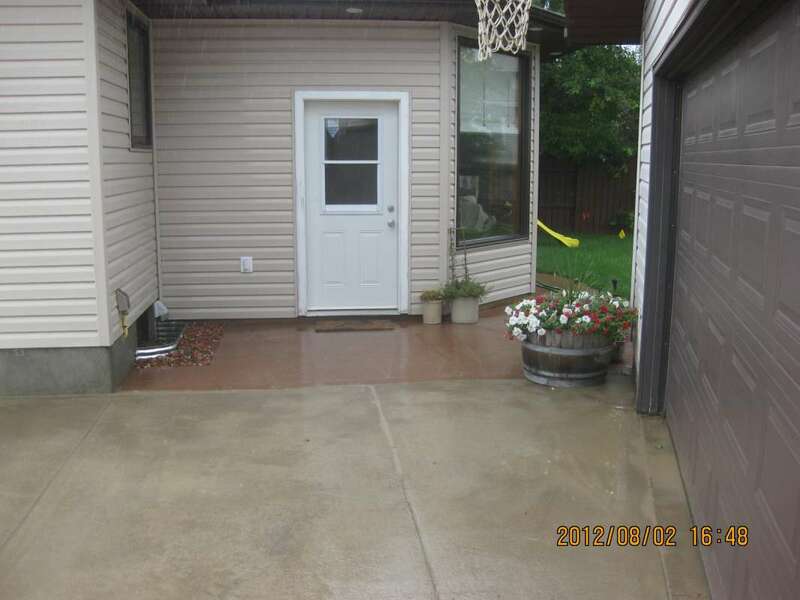 The “water-fall” effect. 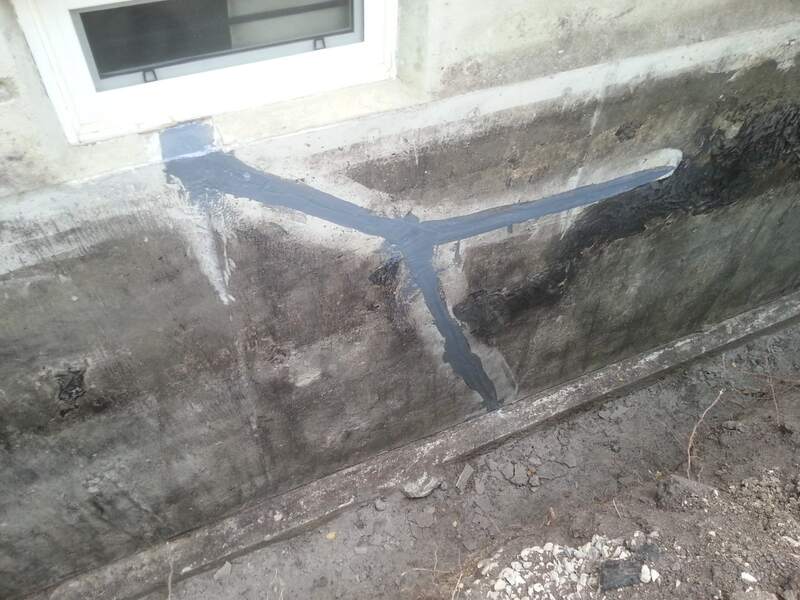 This is a simple yet complicated problem to fix. 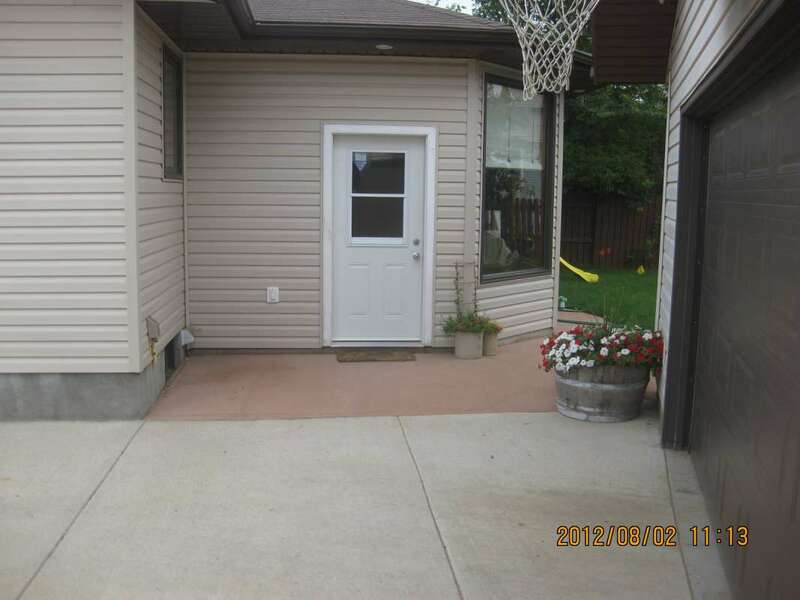 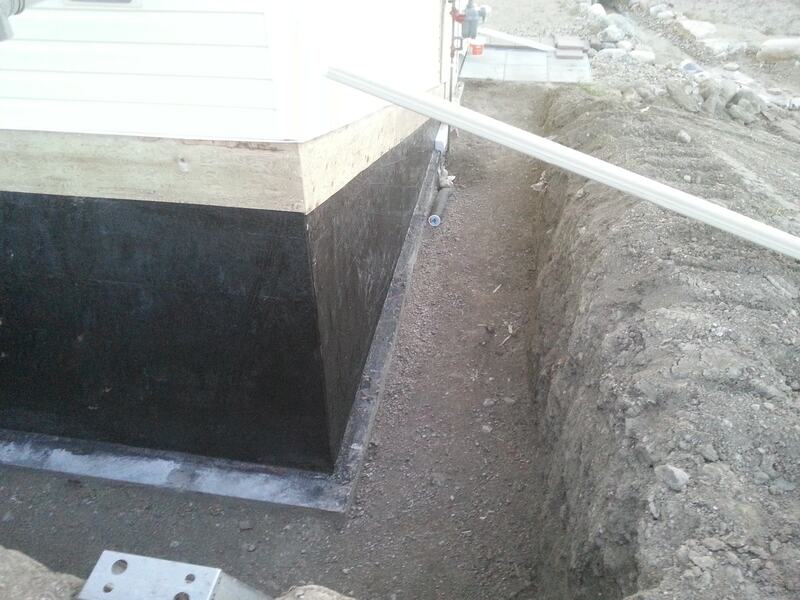 In this example, the basement foundation wall is in good shape, but it is the grade or landscaping that is too high. 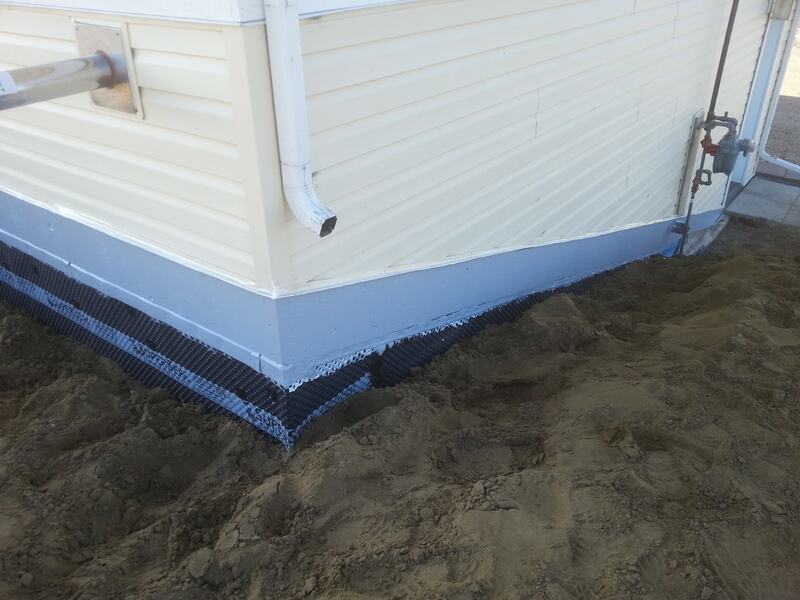 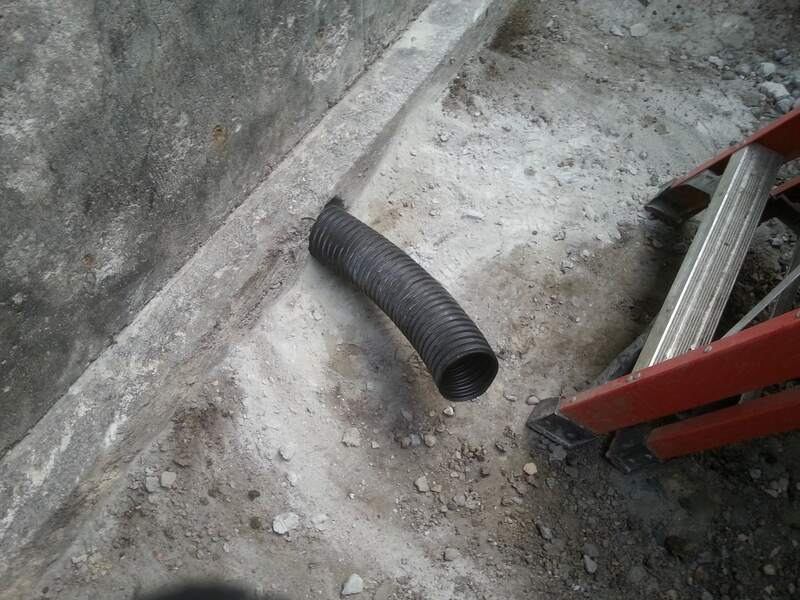 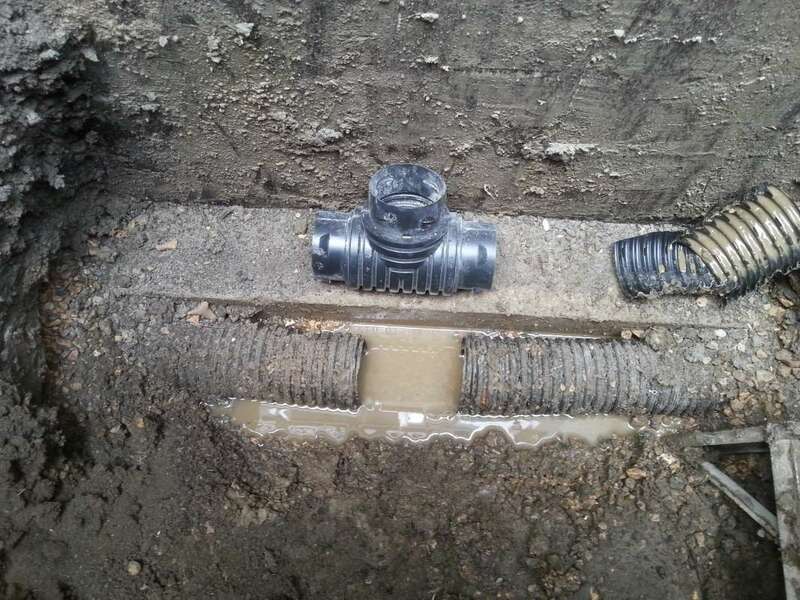 It is not uncommon to have a building construction project fail to consider the surrounding drainage issues that the developing area will face. 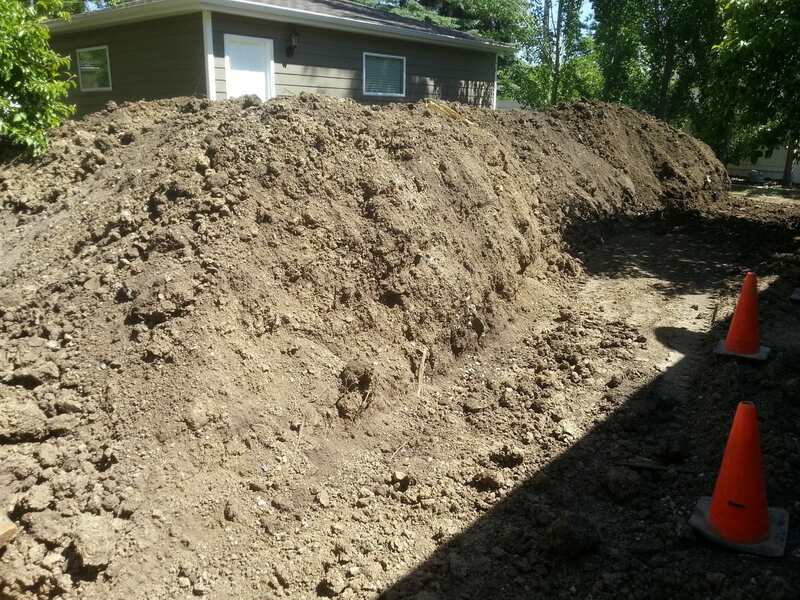 In the end, homeowners compete to ward off the flowing water from their property and their neighbors by building up their land with topsoil. 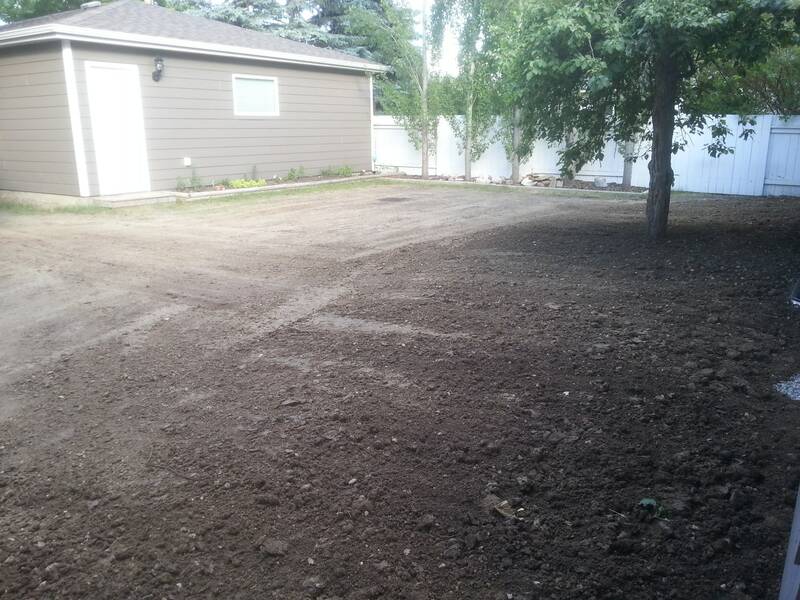 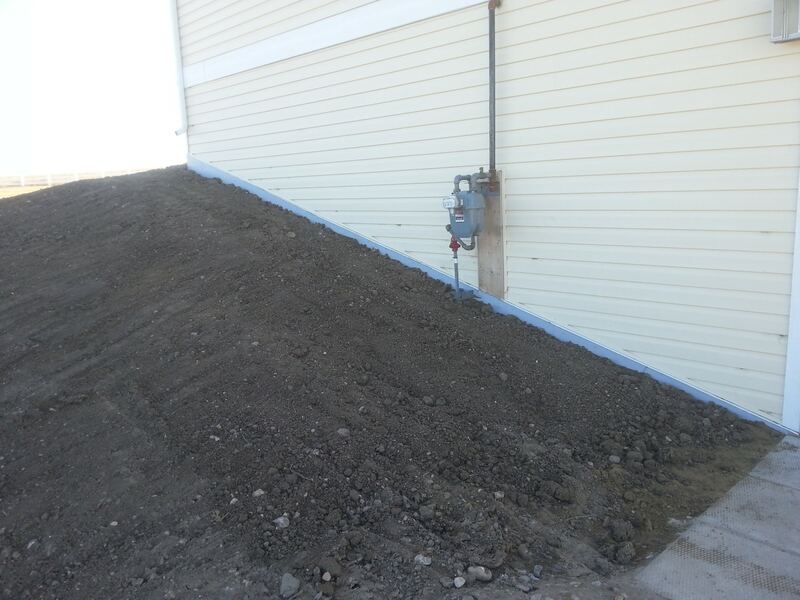 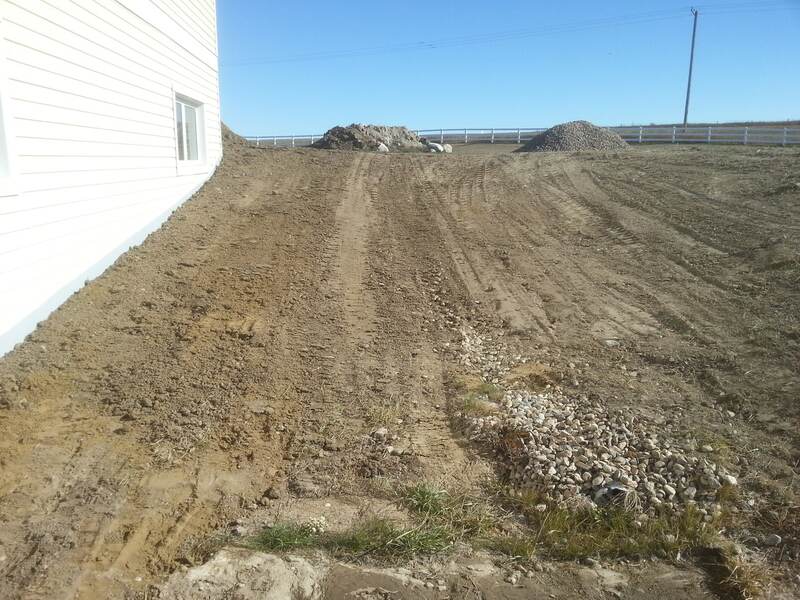 The soil level – or grade – surpasses the upper level of the foundation. 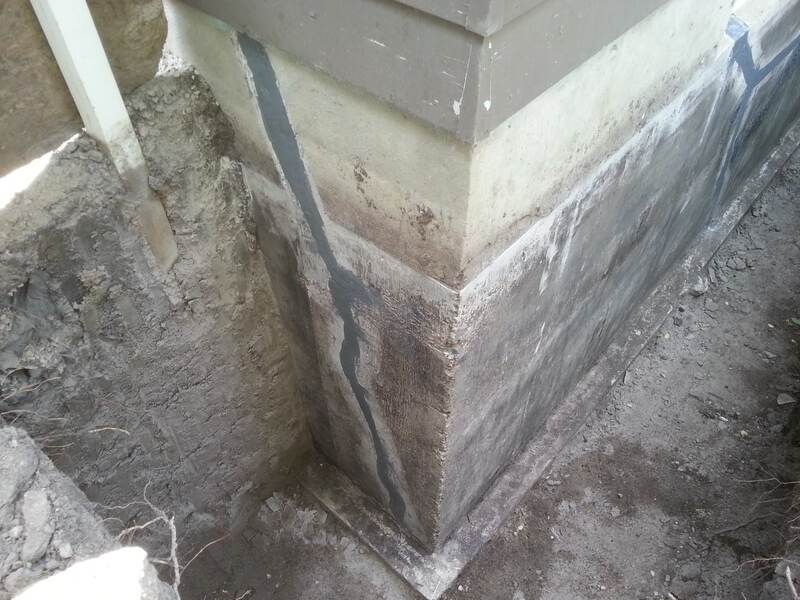 When the grade becomes as high or higher than the top of the concrete foundation, where the concrete ends and the upper wood structure begins, water simply seeps through the wood barrier and flows over-top of the foundation, much like a “water-fall”. 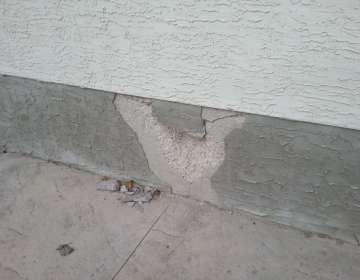 There are a multitude of remedies or “quick-fixes” for this type of problem, but none that will stand the test of time. 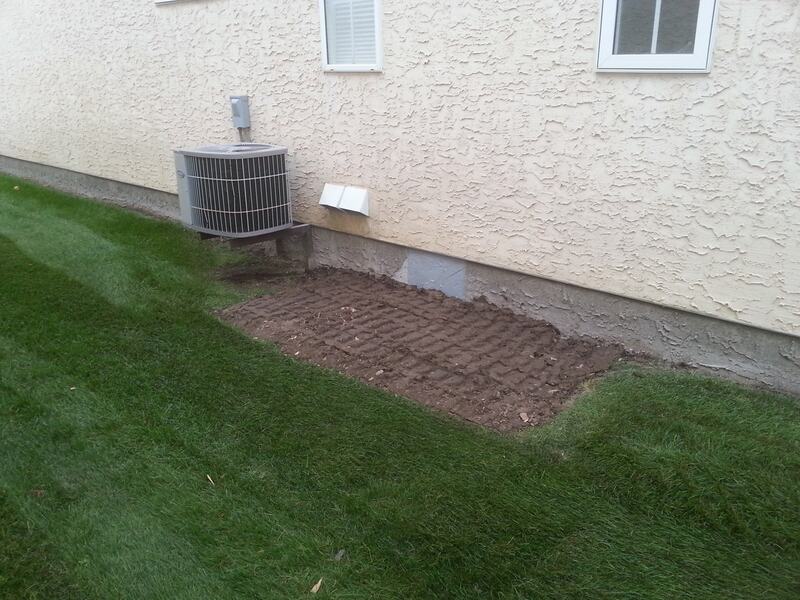 The solution is in the landscaping. 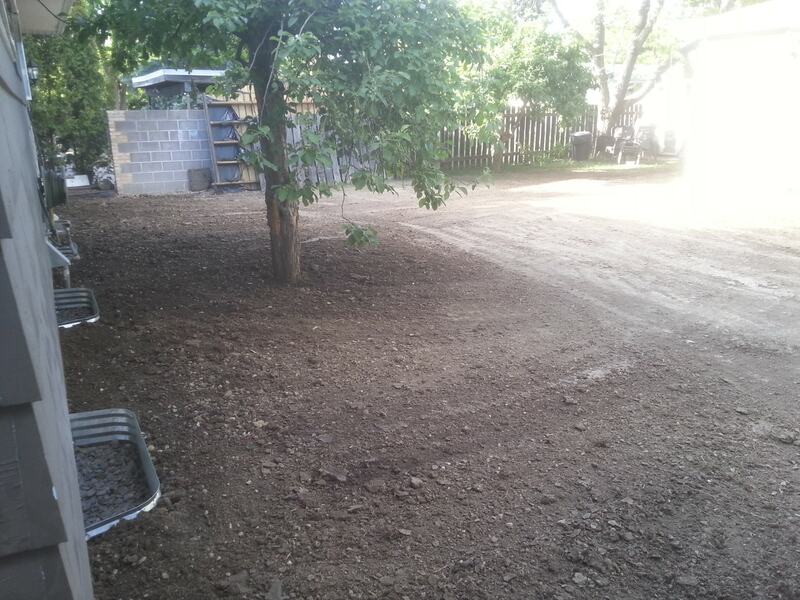 The yard must come down! 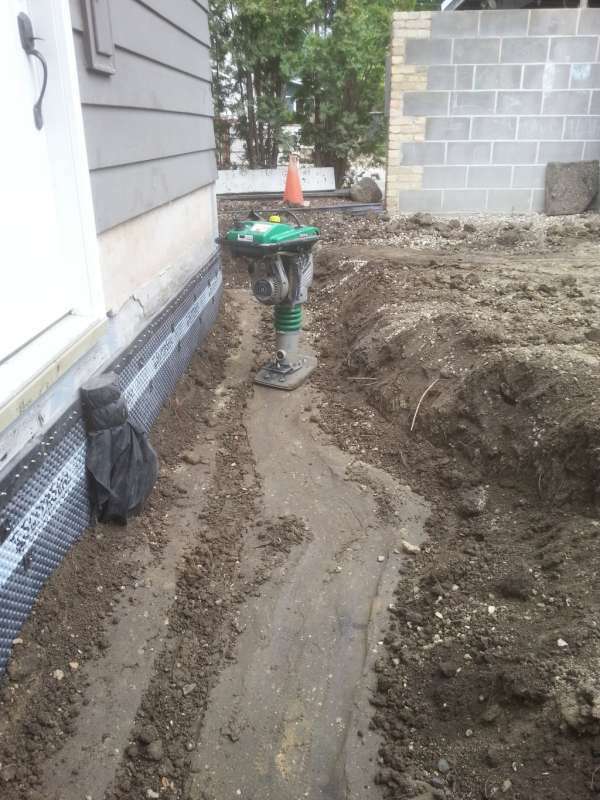 Once the volume of landscaping material has been reduced around the house, with a positive grade away from the foundation, only then can you focus on strategies to manage water drainage while redeveloping the yard. 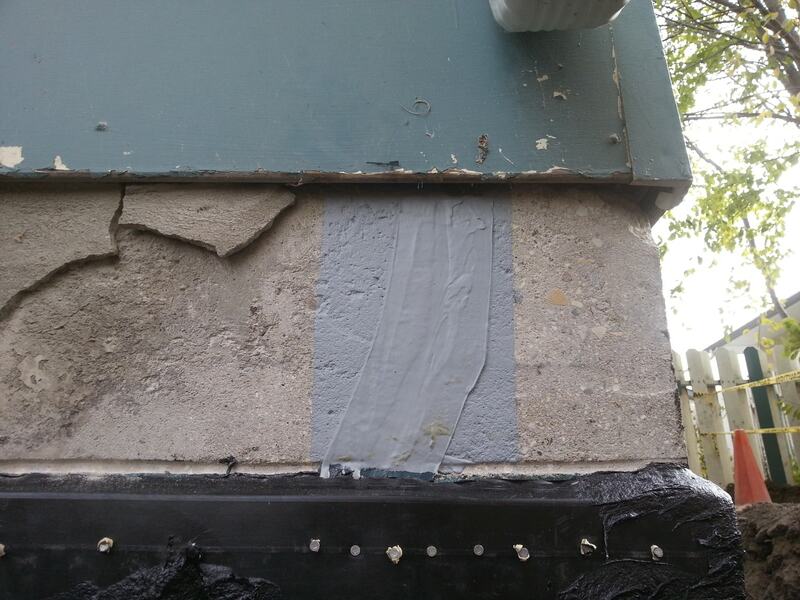 Interior Frost Build-up: This can be a difficult situation to detect, let alone diagnose. 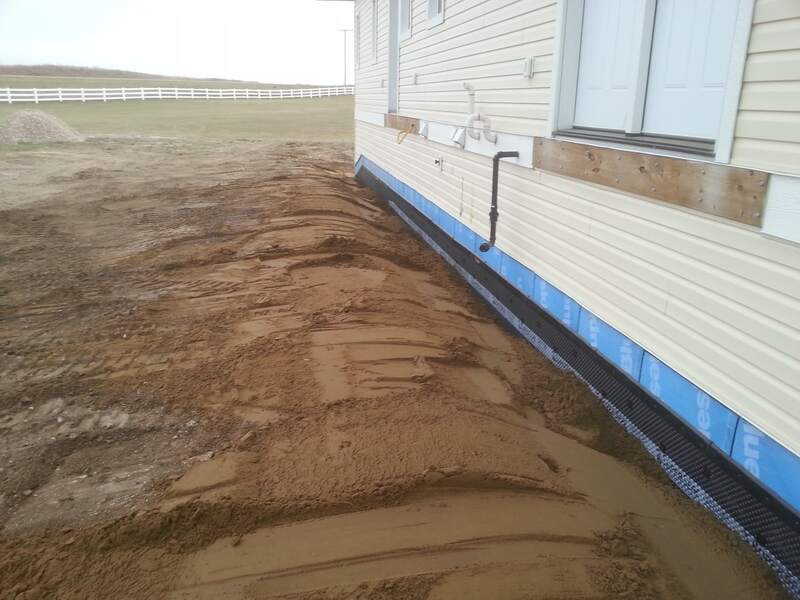 The build-up of frost is more common than most realize, especially in the regions like the Canadian Prairie Provinces where the winter frost environment is more cold and the ground frost settles in at greater depths. 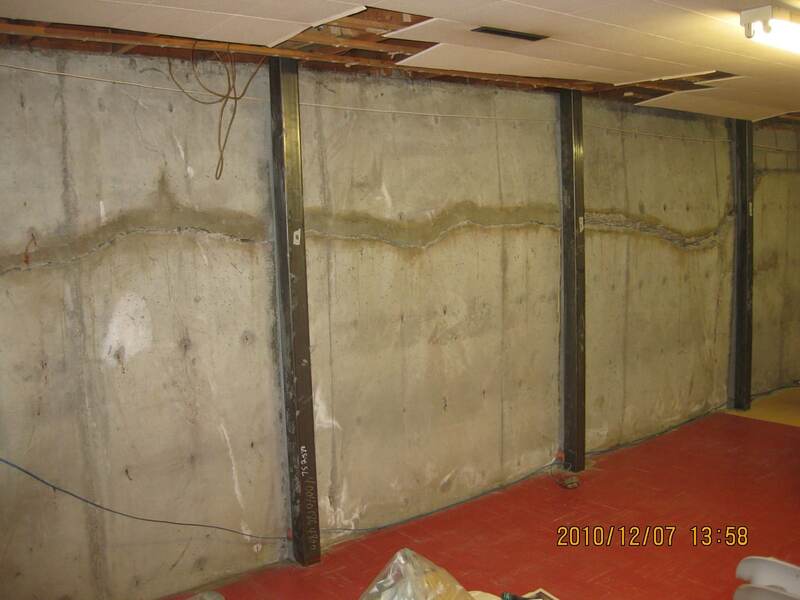 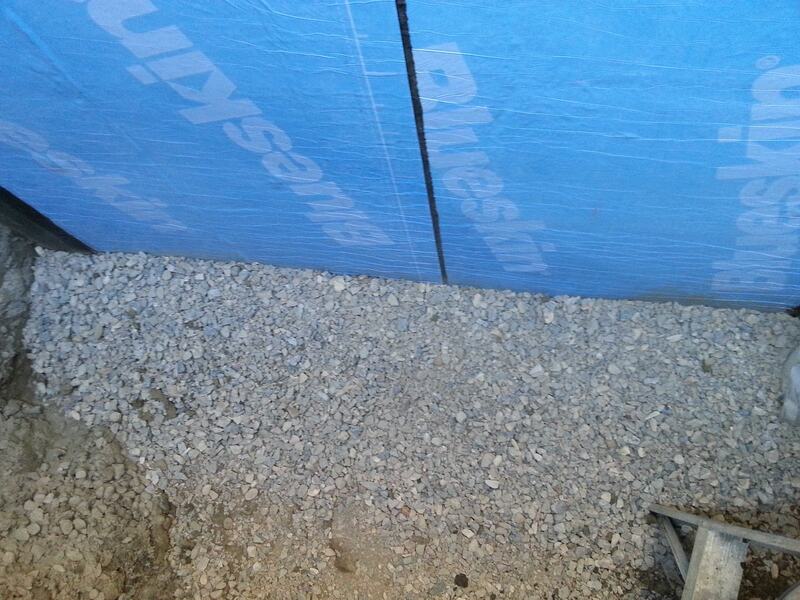 In this example, frost has built up on the interior concrete foundation wall, behind the drywall, vapour barrier and insulation. 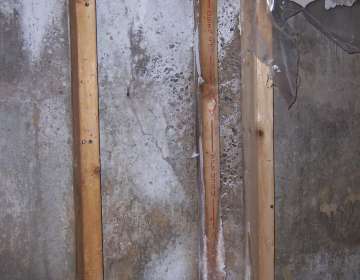 Condensation forms from warmer air getting trapped behind the wall and coming into contact with the cold concrete wall surface. 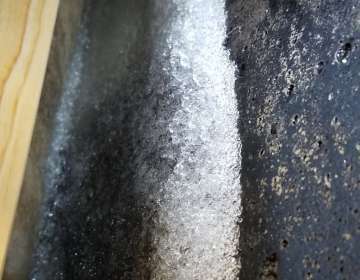 This condensation eventually develops into frost build-up, much the same way that you see frost build-up on your pantry freezer. 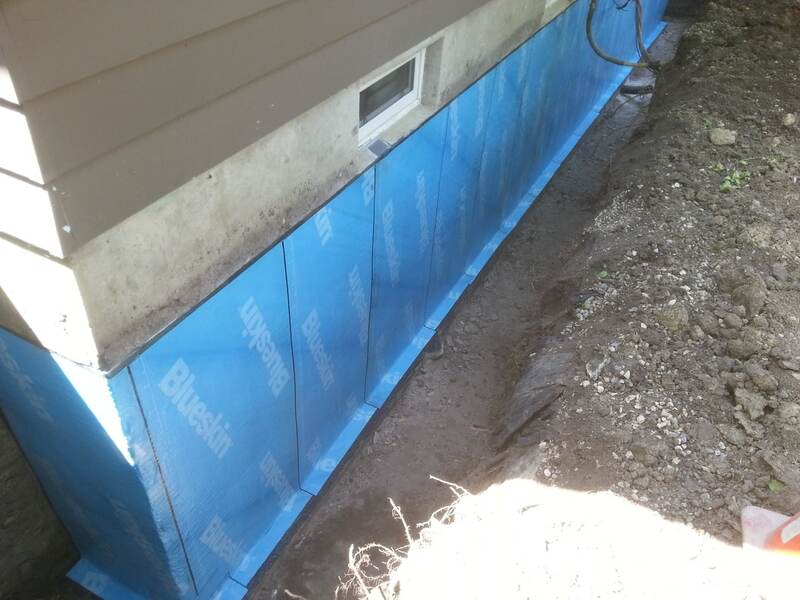 When spring arrives and brings warmer temperatures, the interior concrete wall starts to warm up and the frost slowly melts. 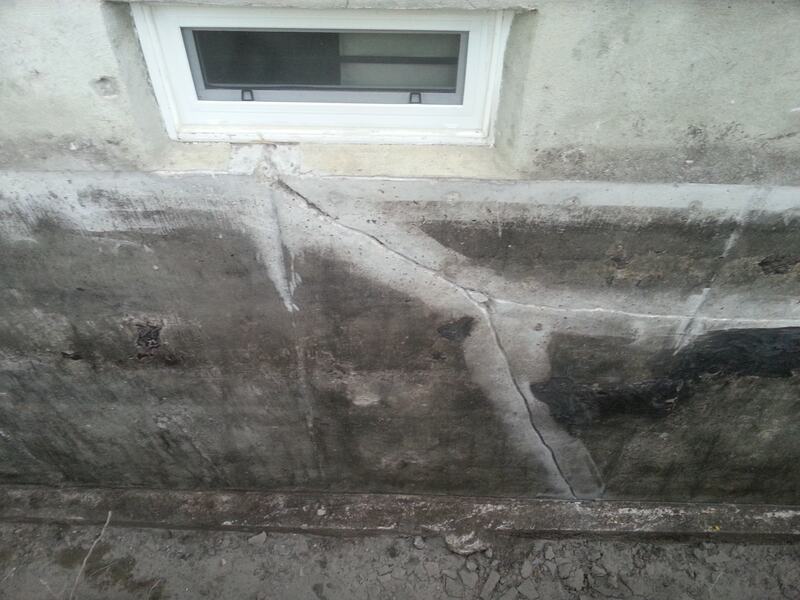 This melting water then drains down the wall and accumulates on the basement floor….just like a leaky wall crack. 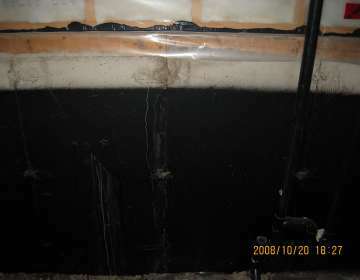 If this situation is not repaired, then the development of mold can occur….just like a leaky wall crack. 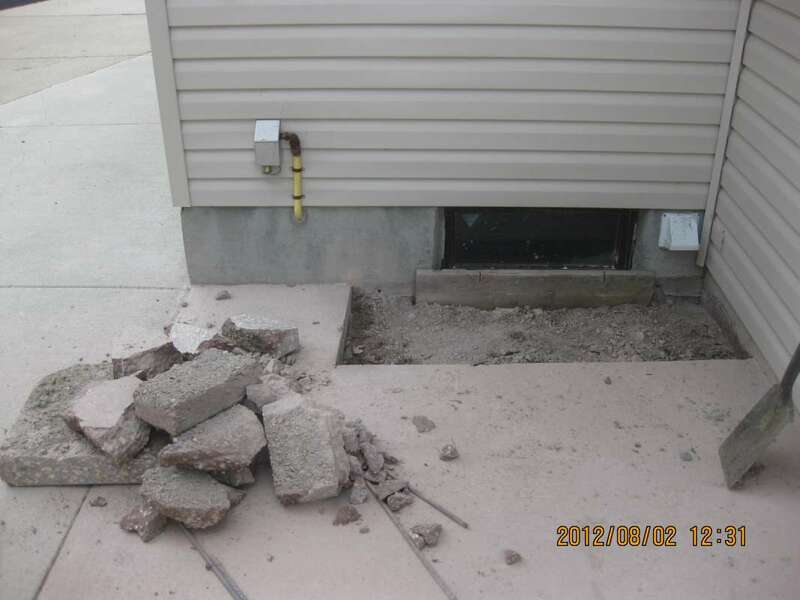 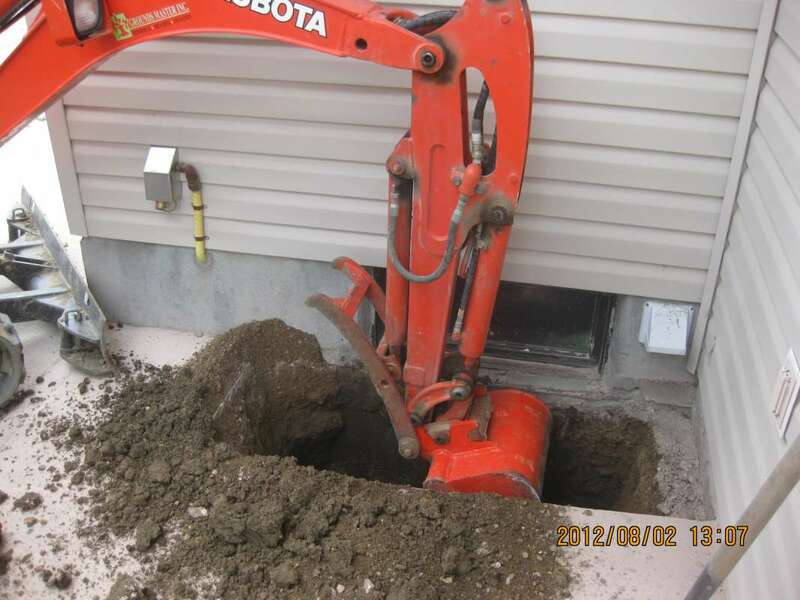 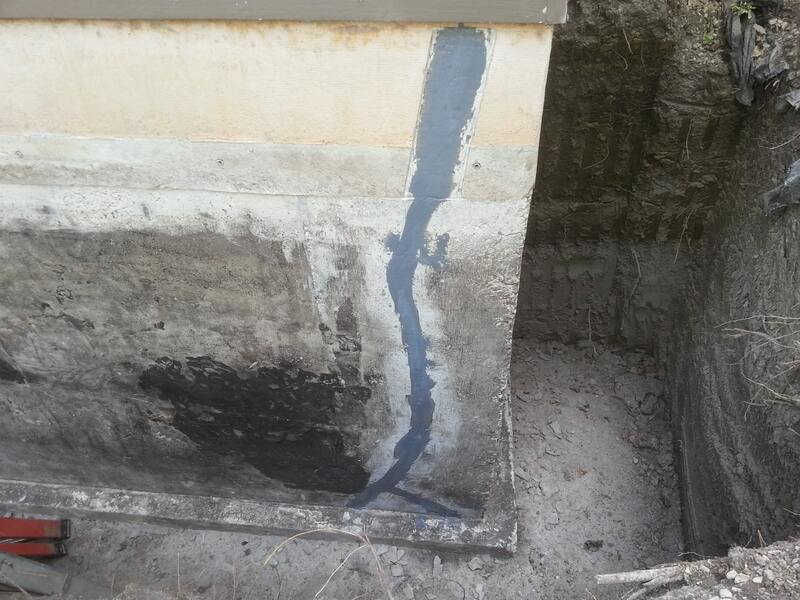 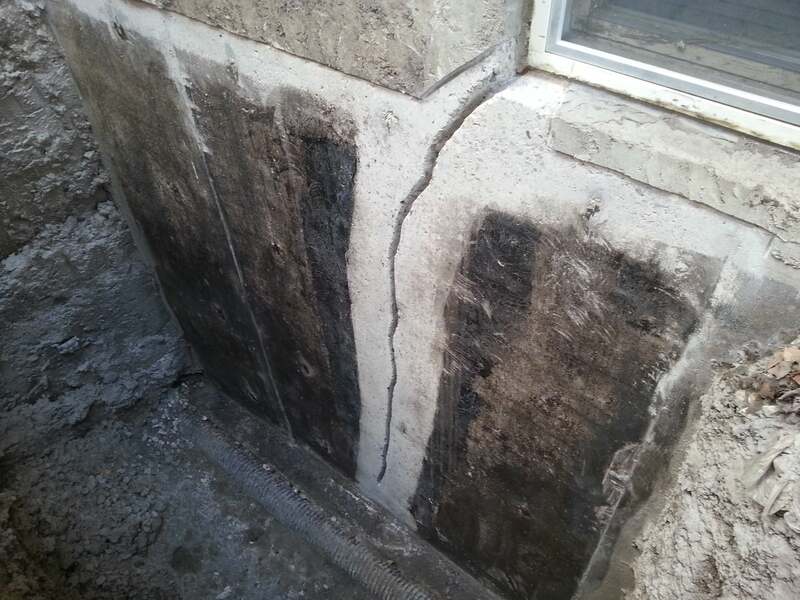 A common vertical crack repair usually involves the excavation of the crack area (approx. 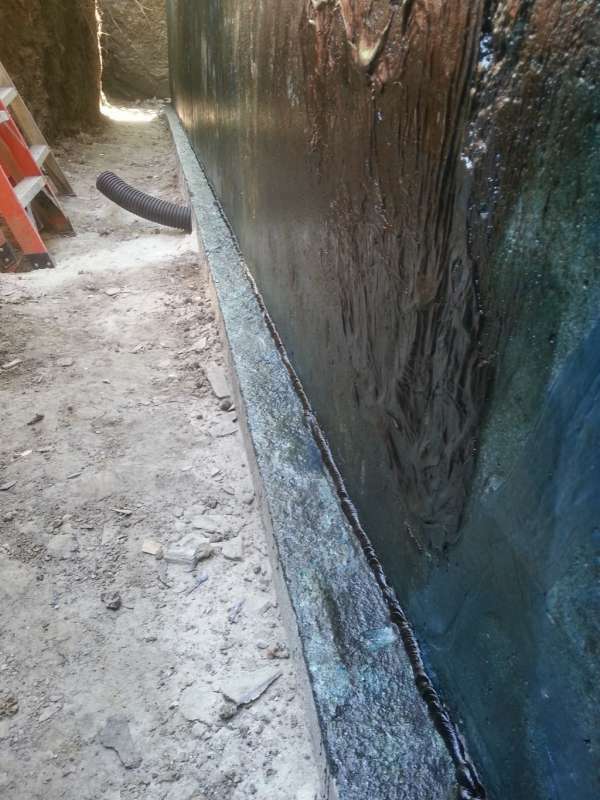 6ft long x 3ft wide, and down to the footing), wall cleaning and preparation of the individual crack, sealing the crack with an epoxy or polyurethane injection, then finally installing a minimum 3ft wide (or greater) waterproof membrane over the entire crack surface area. 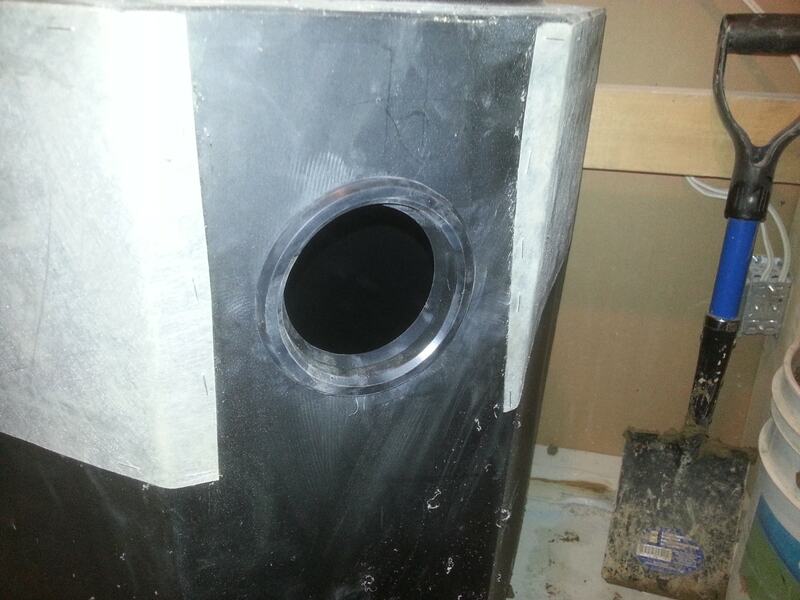 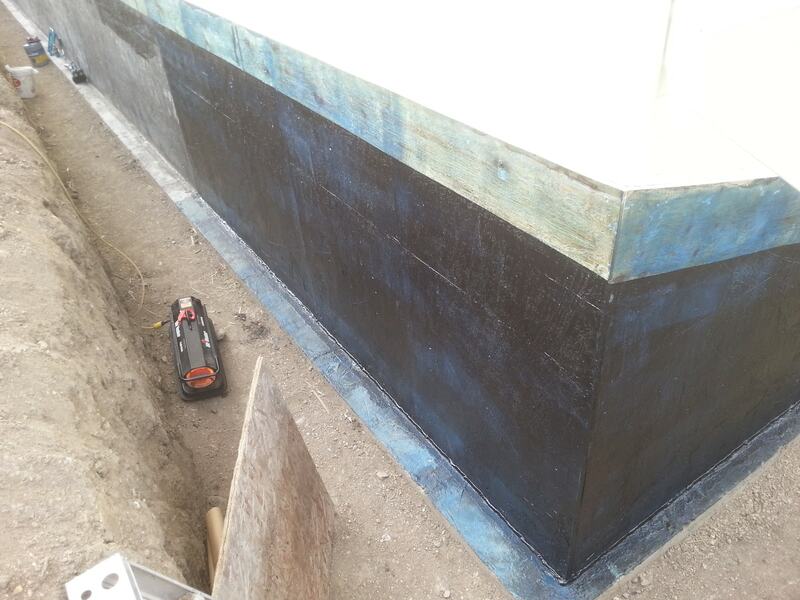 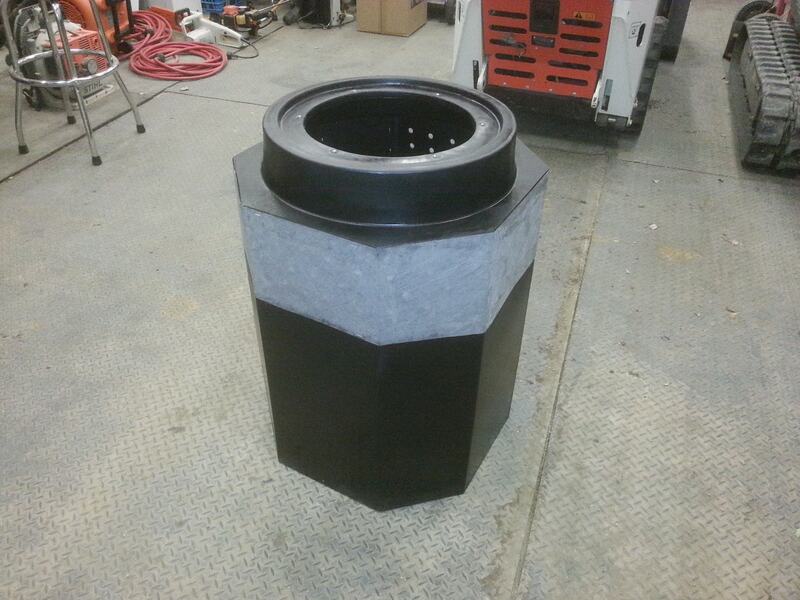 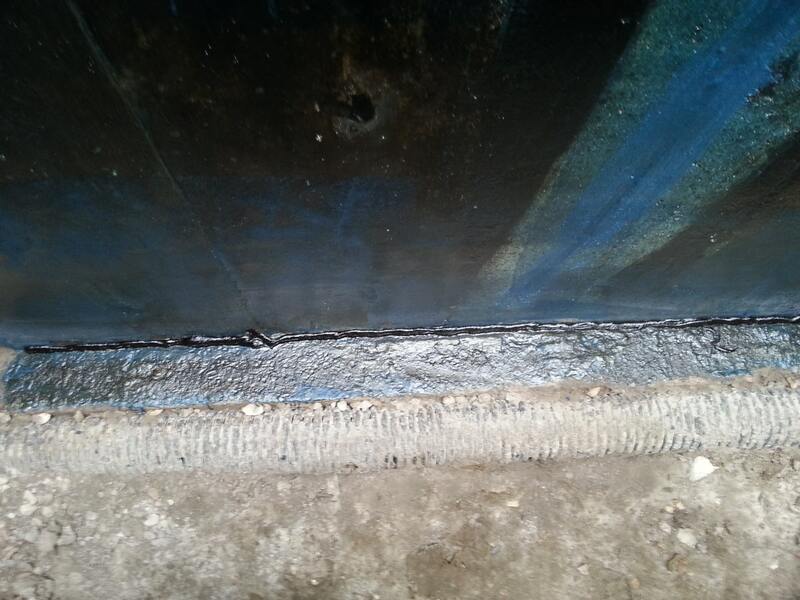 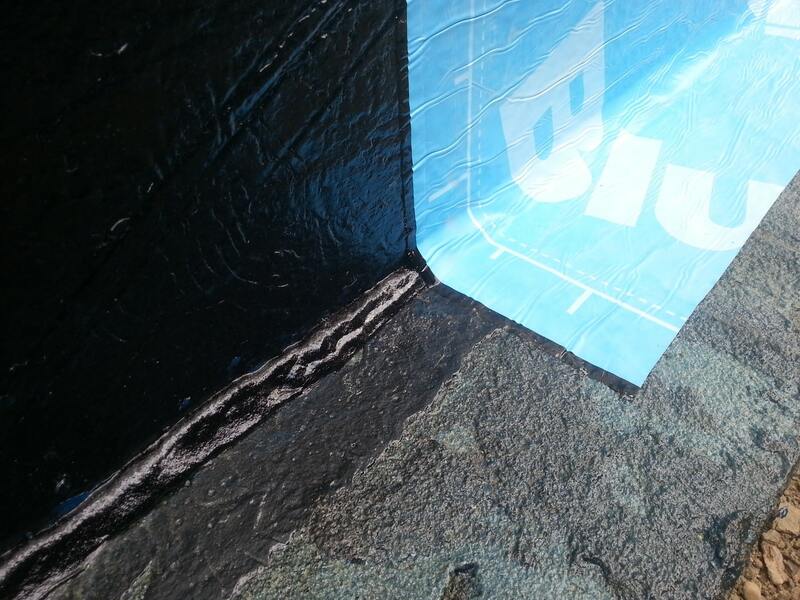 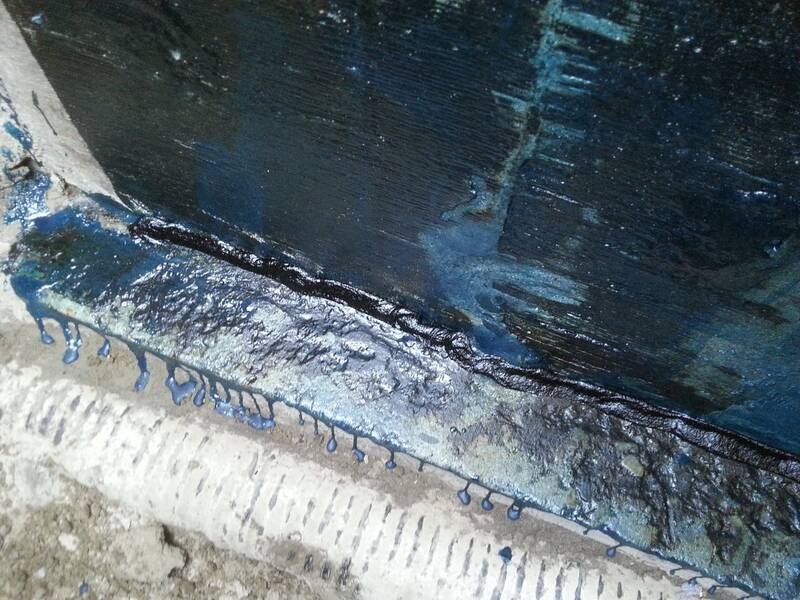 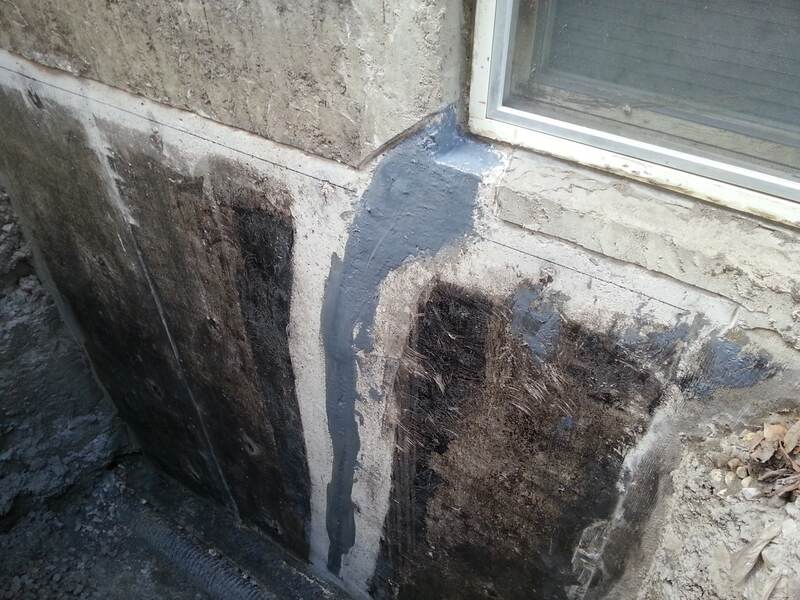 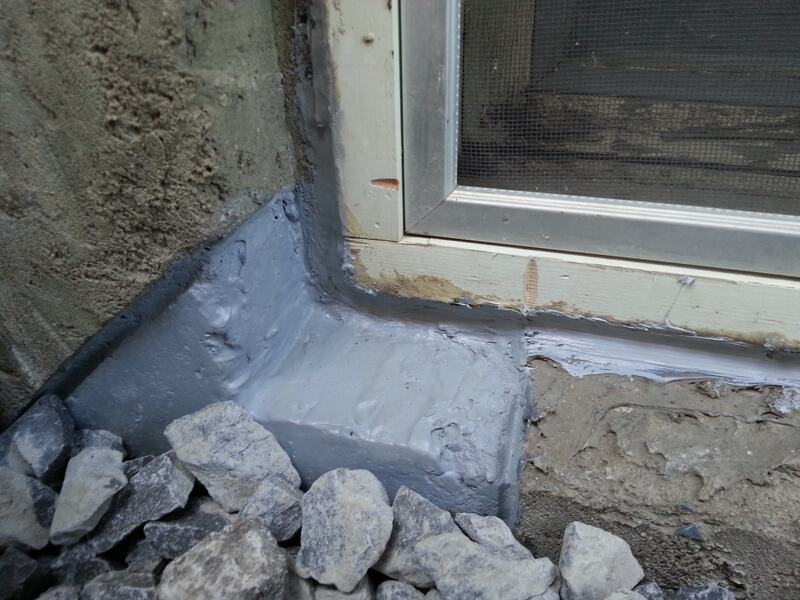 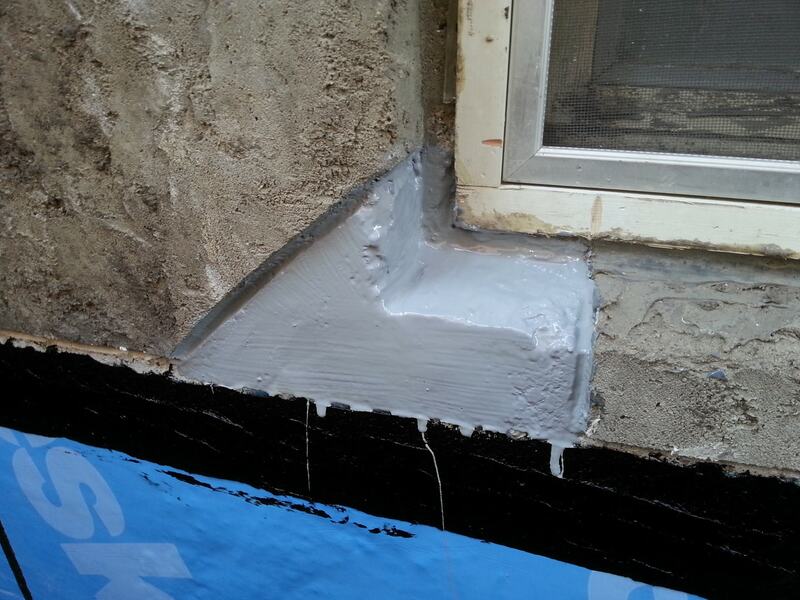 Supportive final sealing products are then used for the exterior of the repaired area. 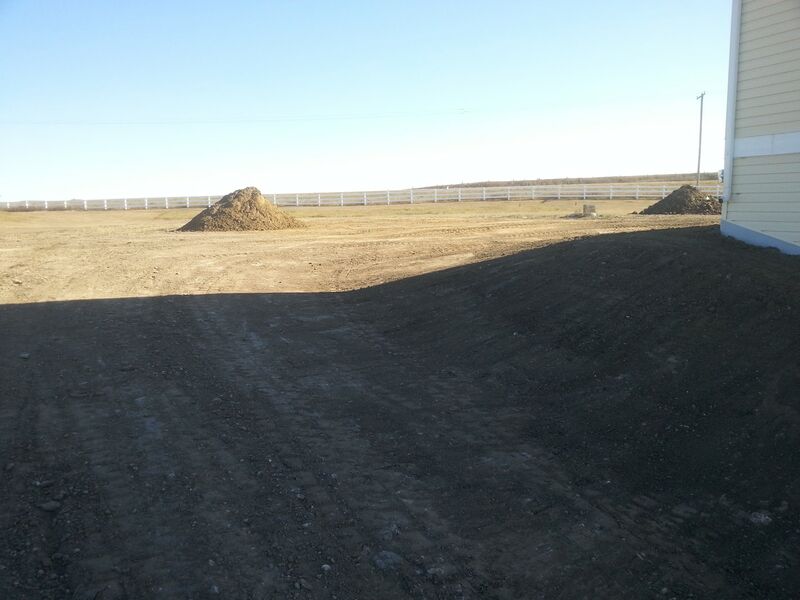 The excavated area is backfilled and first grading completed. 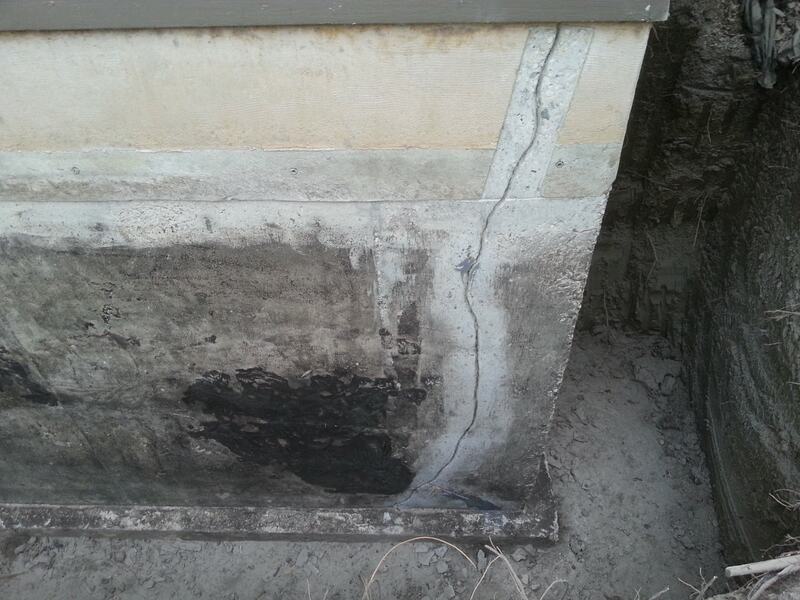 A detailed photo CD of the repair work is supplied to all customers. 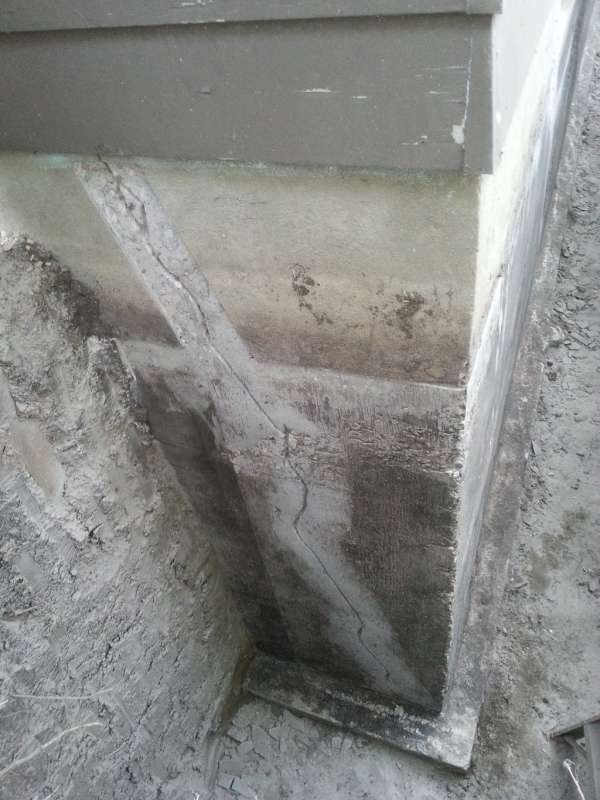 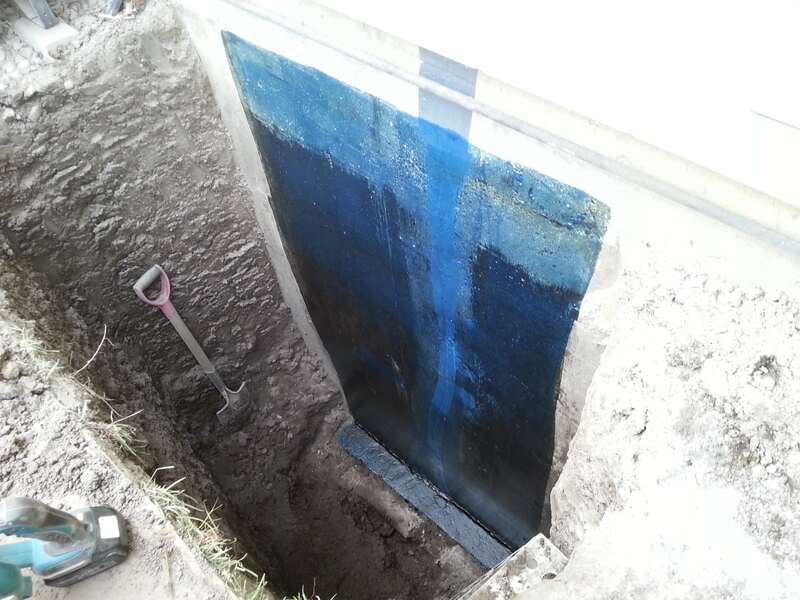 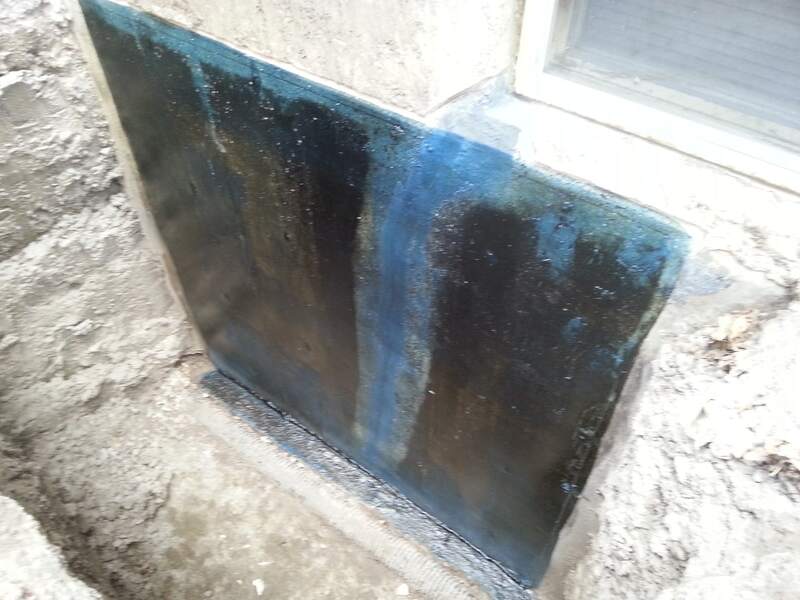 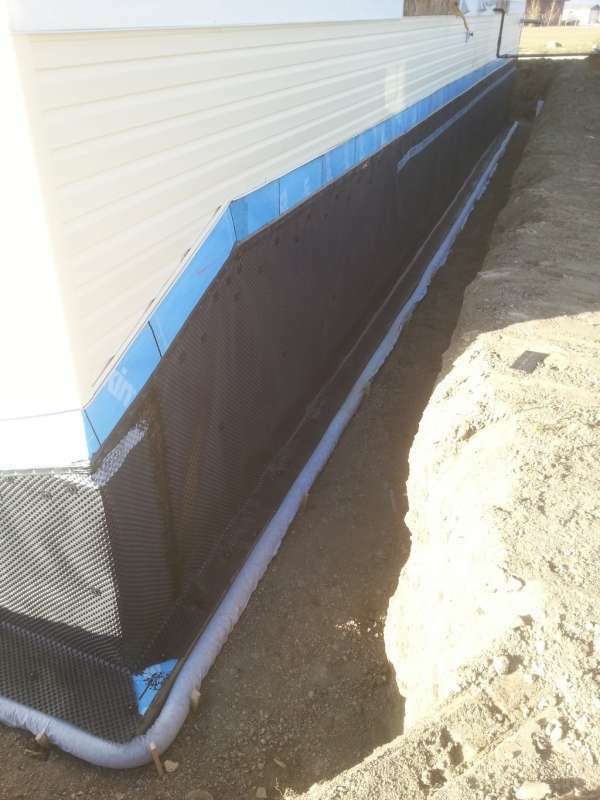 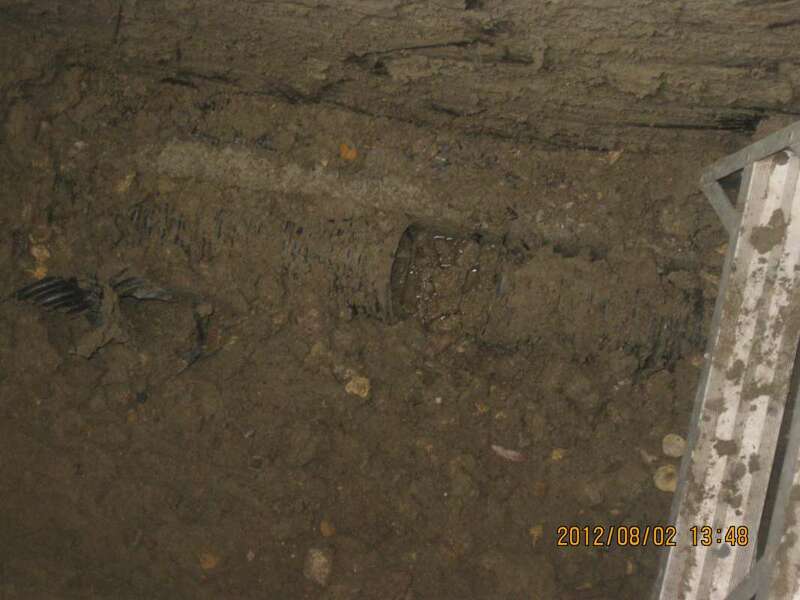 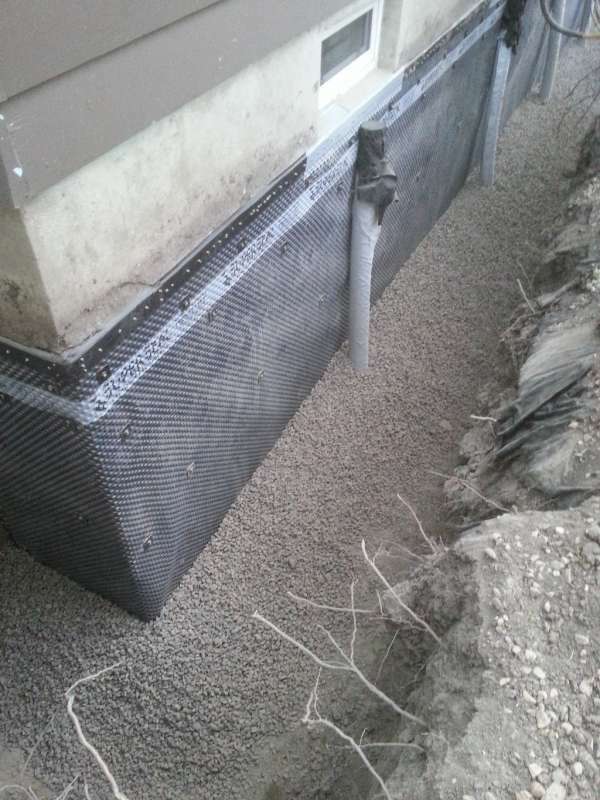 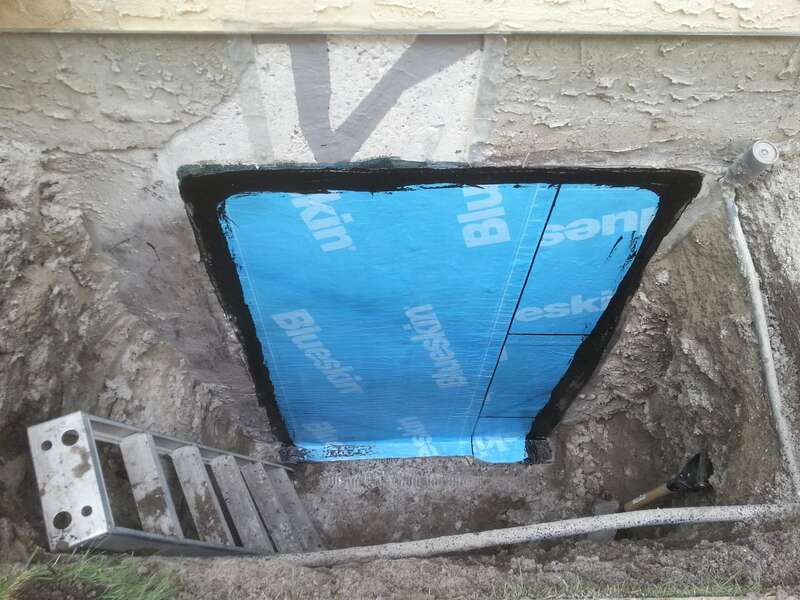 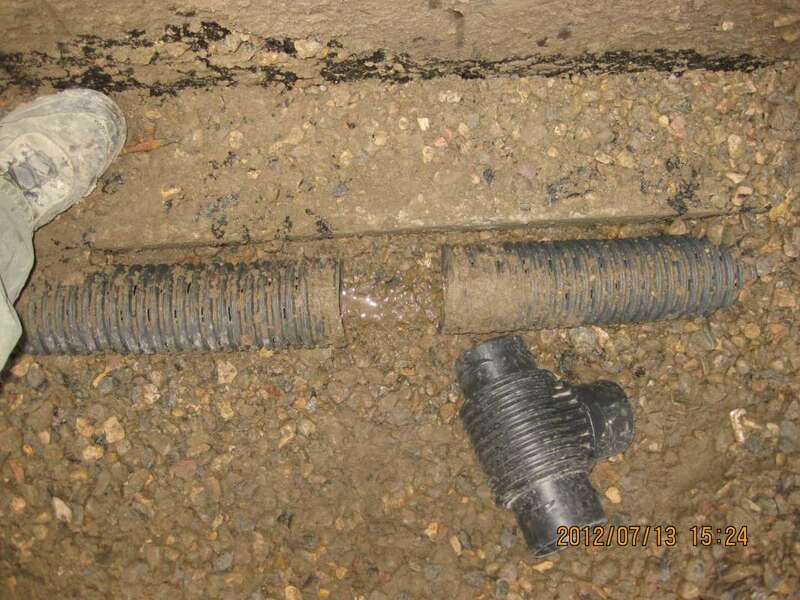 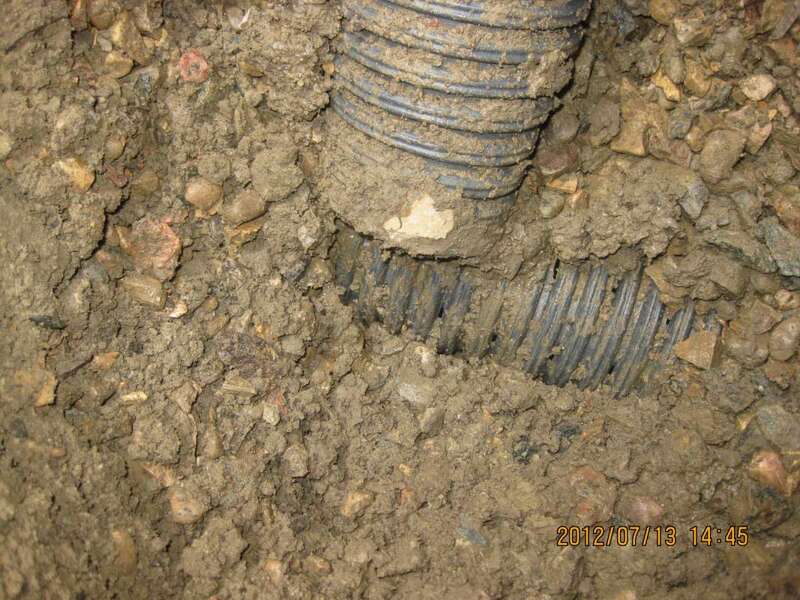 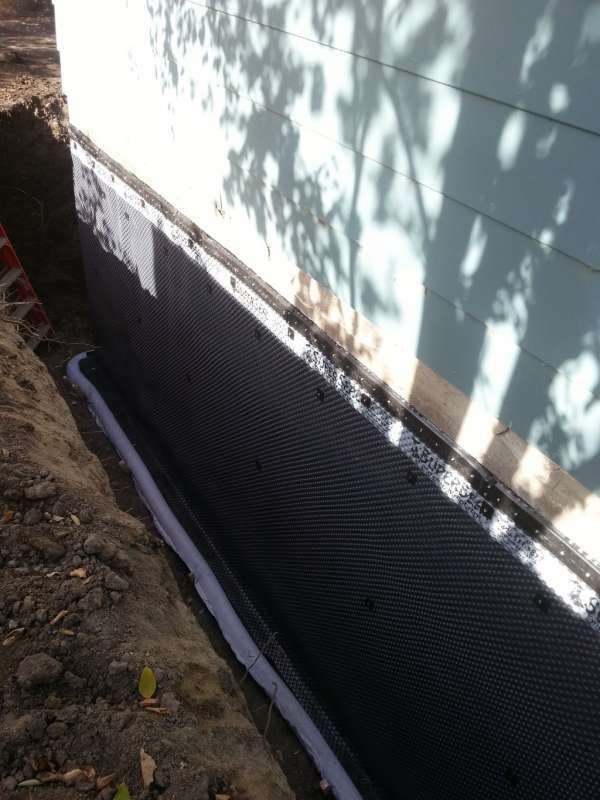 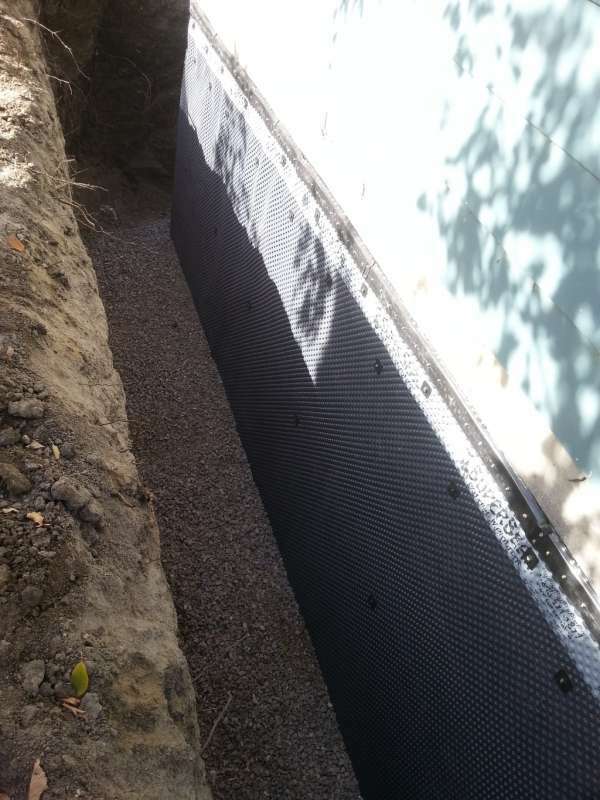 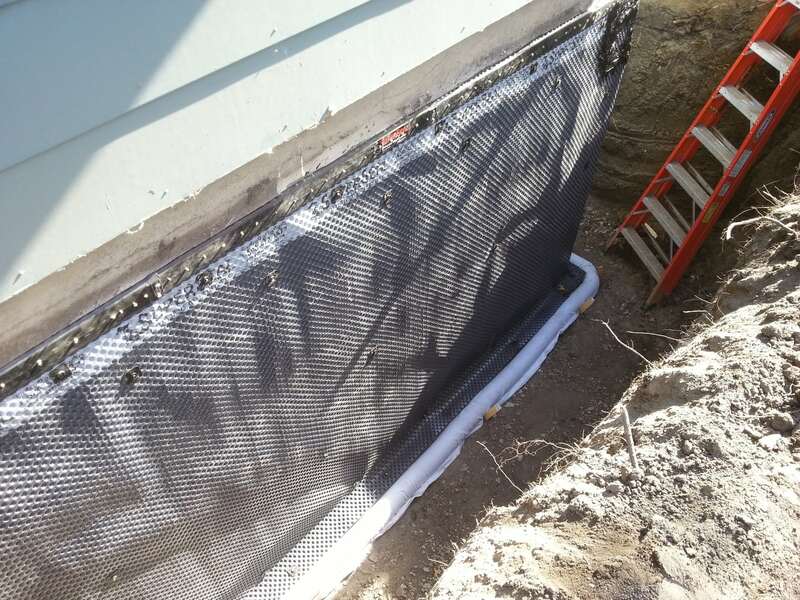 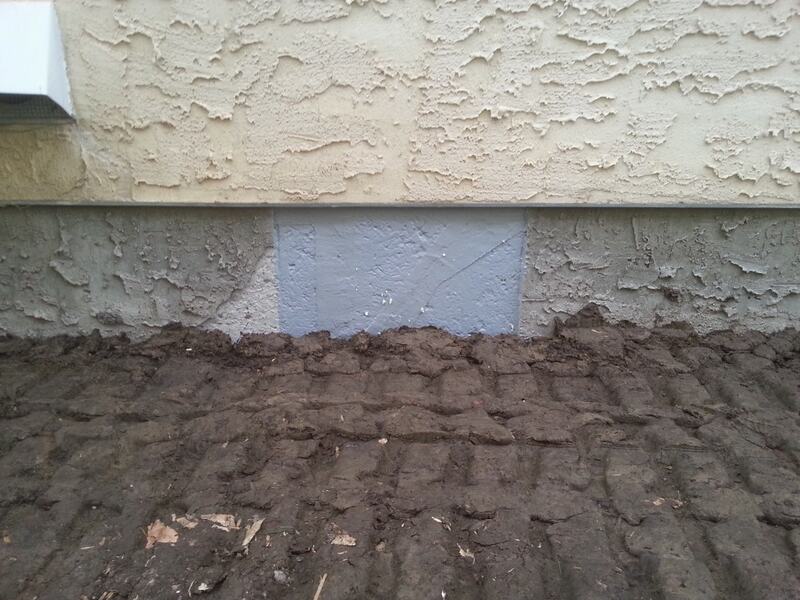 Involves the excavation of a specific exterior foundation wall(s), wall cleaning and preparation of individual cracks, sealing the cracks with an epoxy or polyurethane injection, then the installation of a waterproof membrane over the entire foundation surface, followed by the installation of secondary dimpled membrane or drain board. 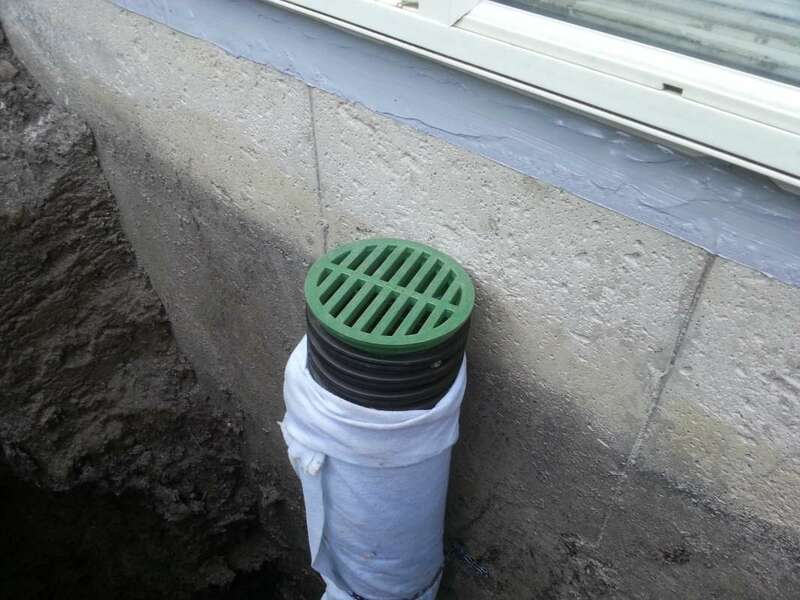 Finally, filter-covered weeping-tile and drain stone are installed or replaced depending on the situation of the structure. 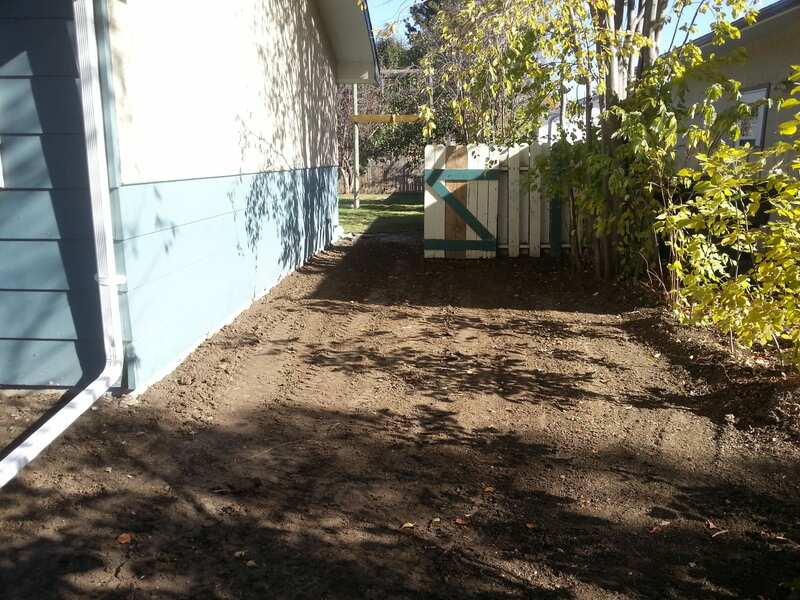 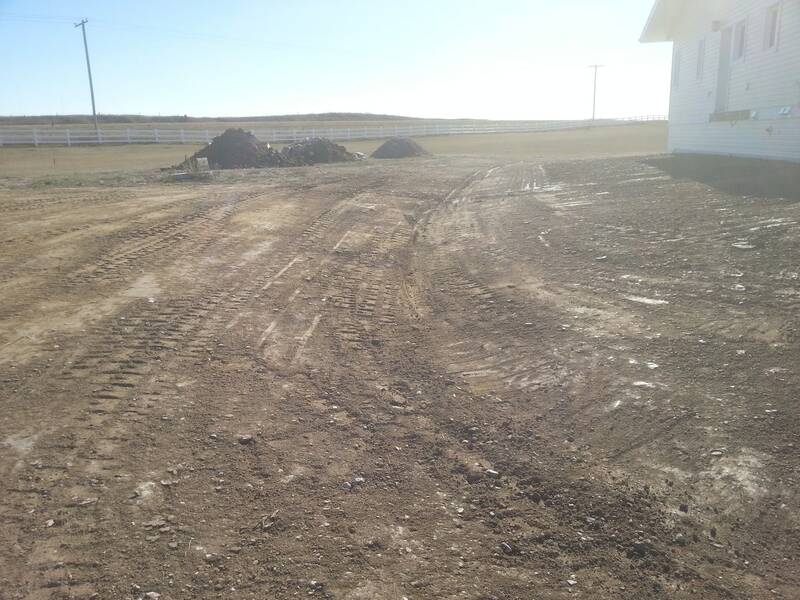 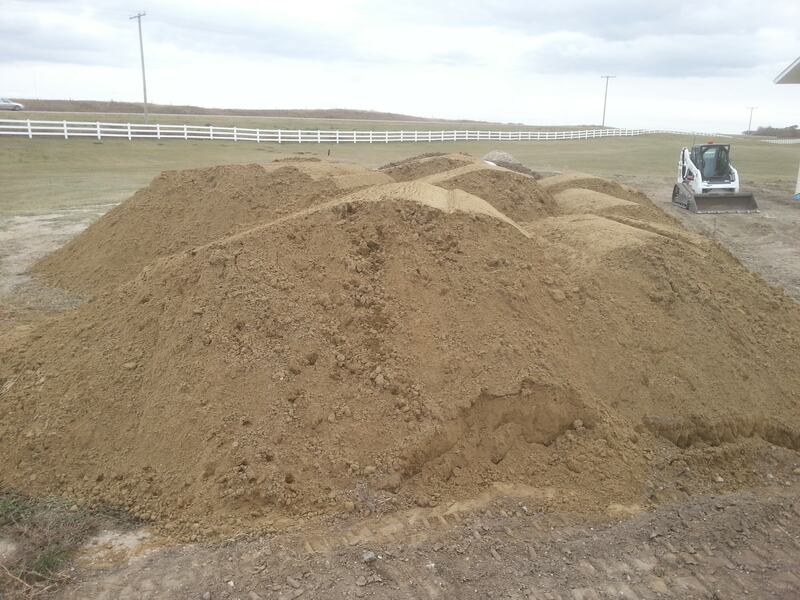 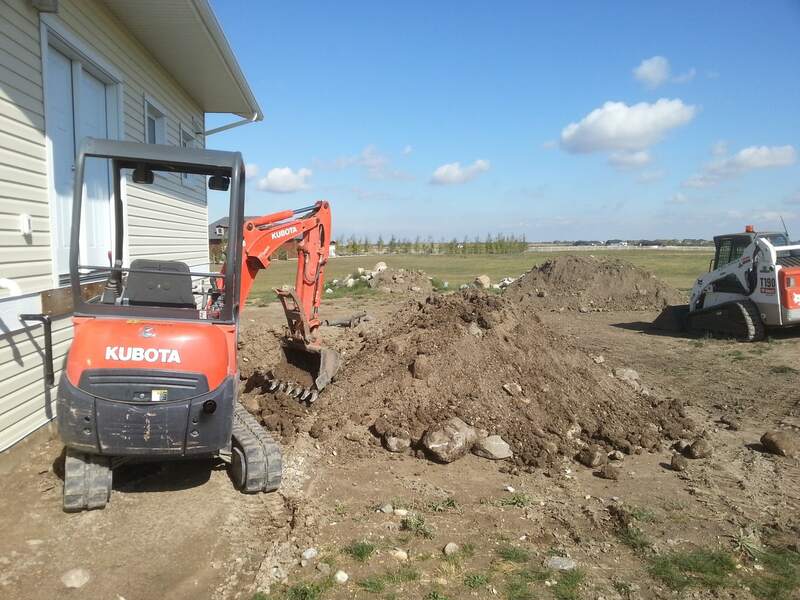 All excavated areas are backfilled and first grading completed. 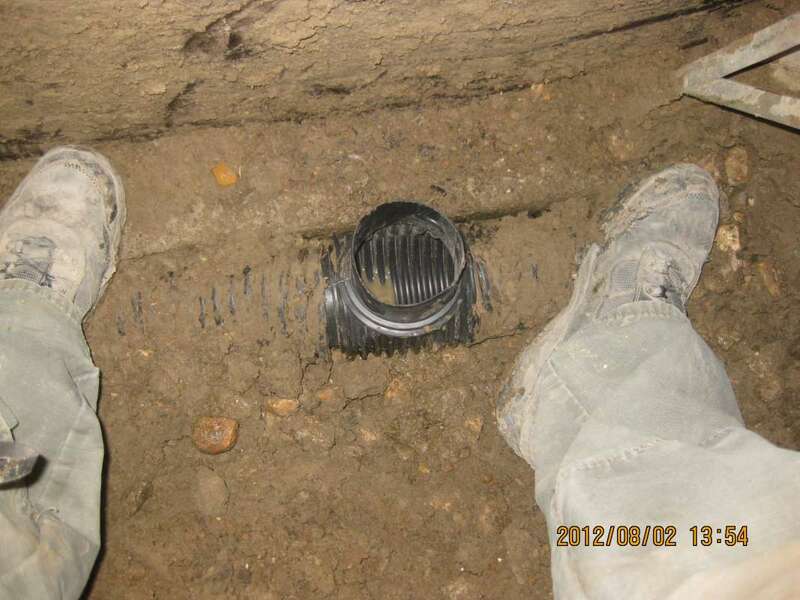 A detailed photo CD of the repair work is supplied to all customers. 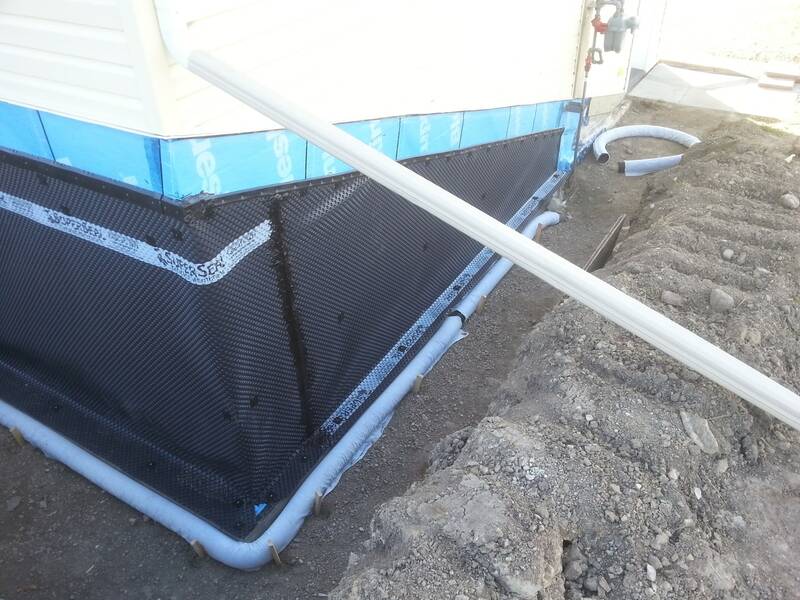 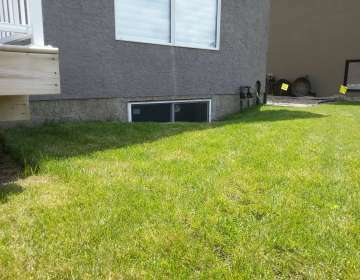 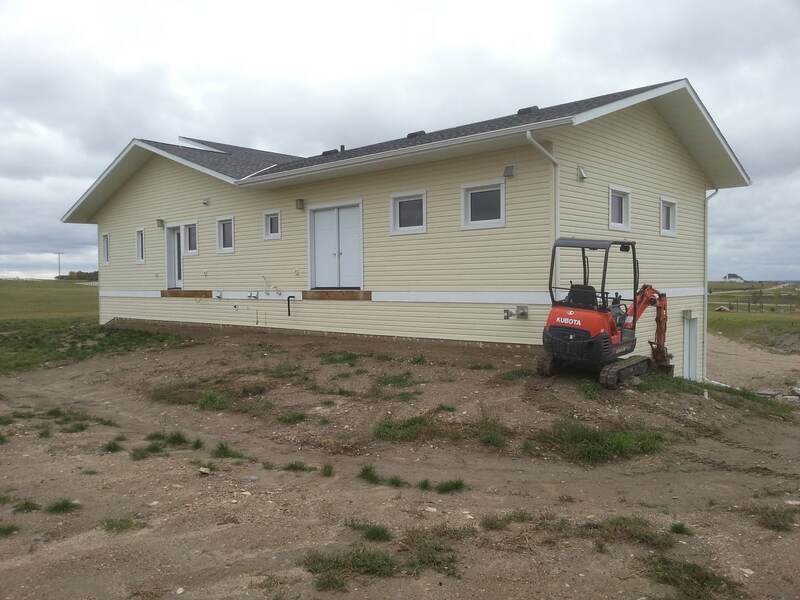 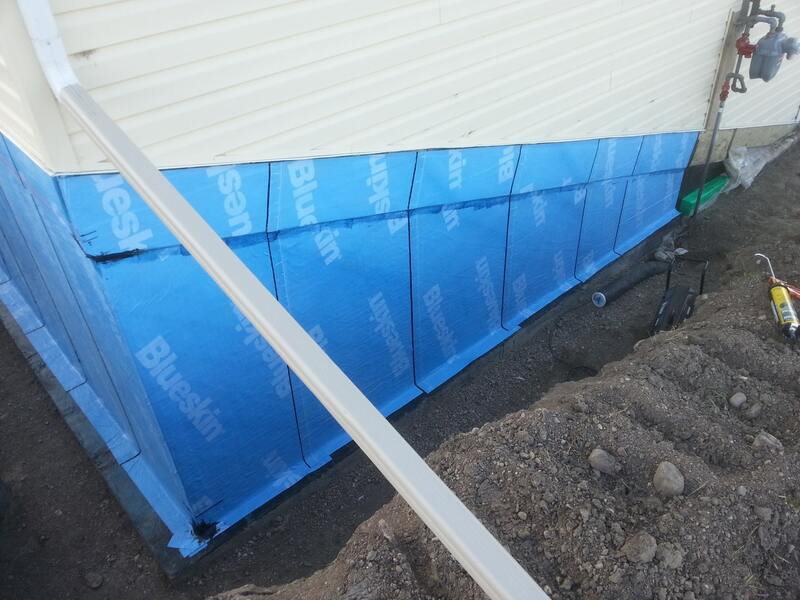 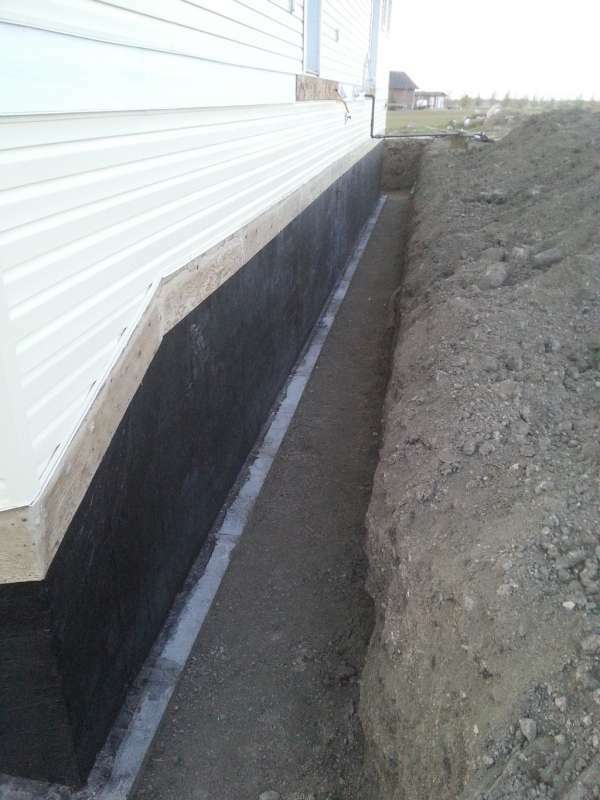 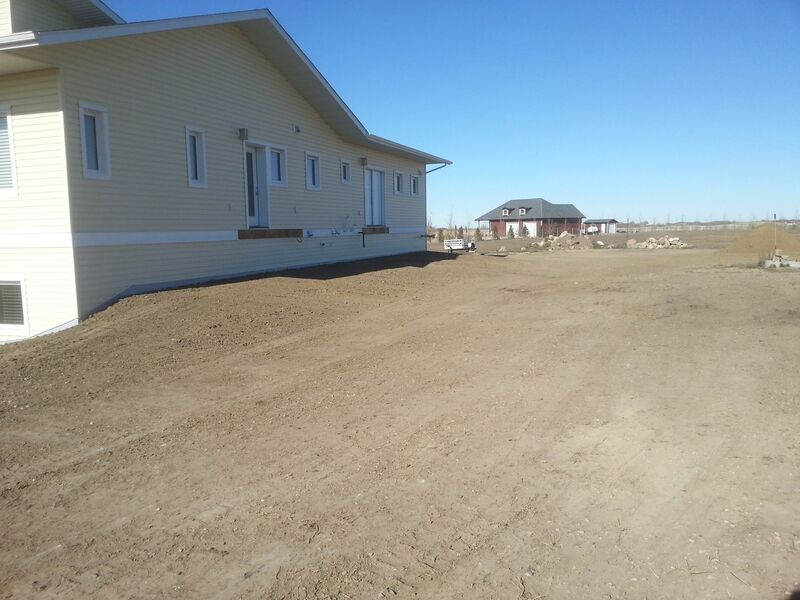 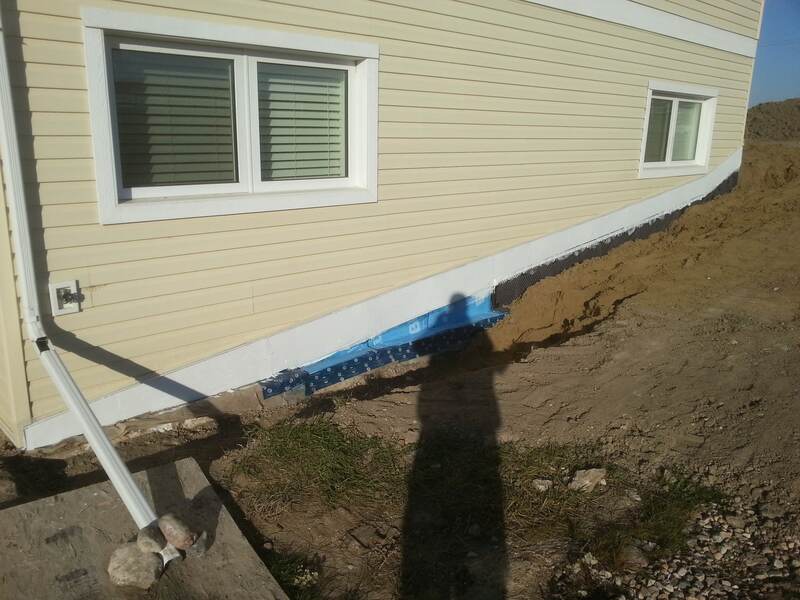 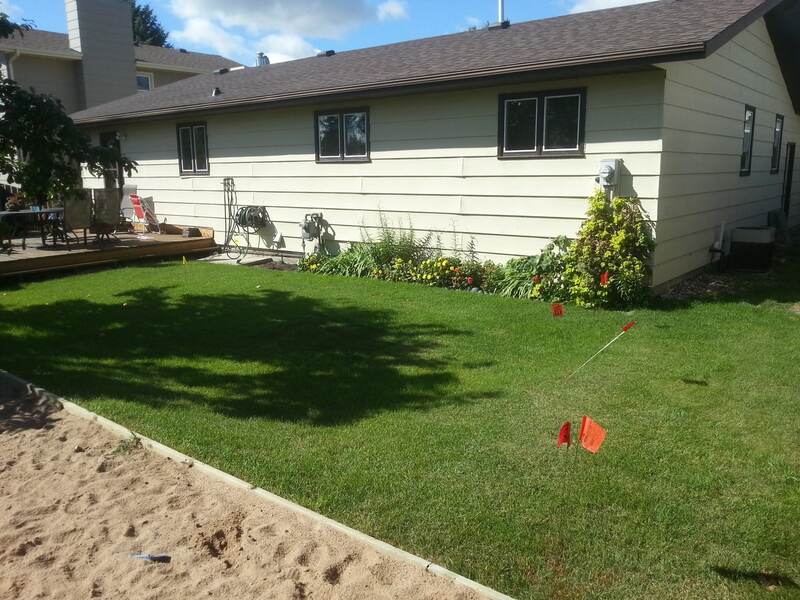 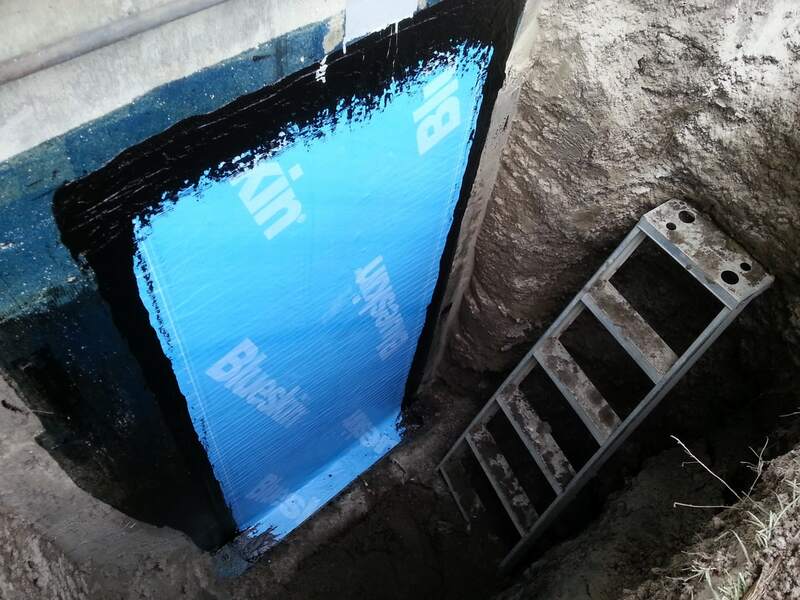 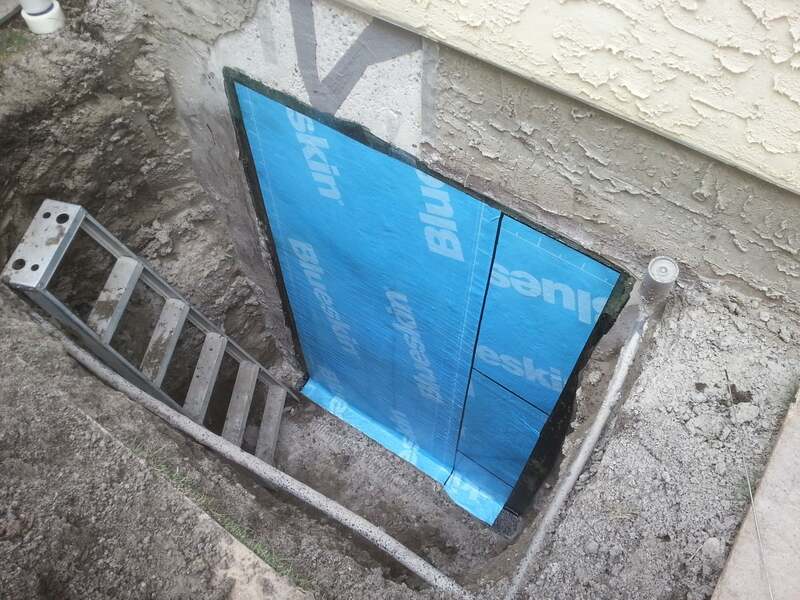 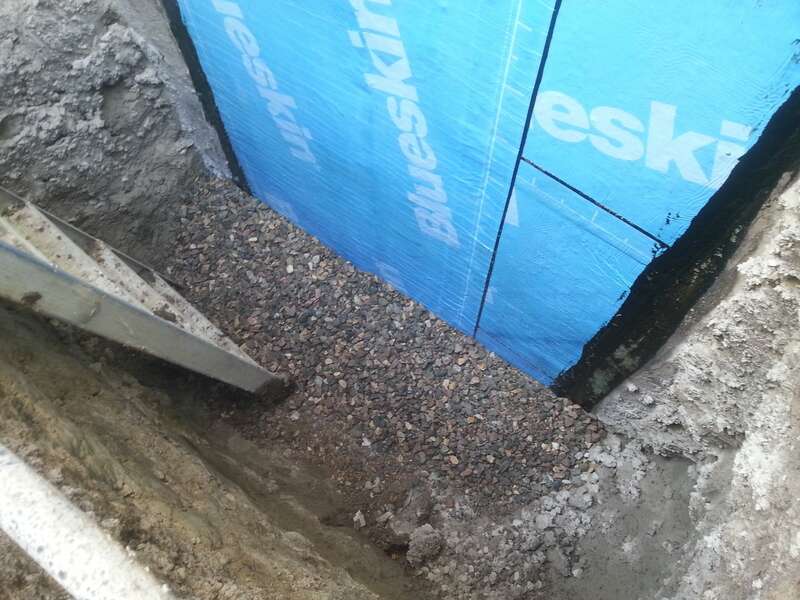 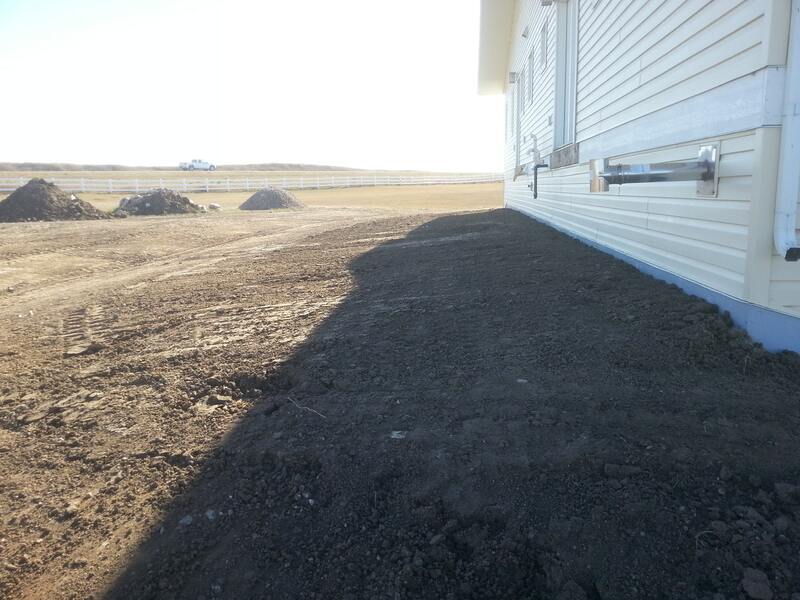 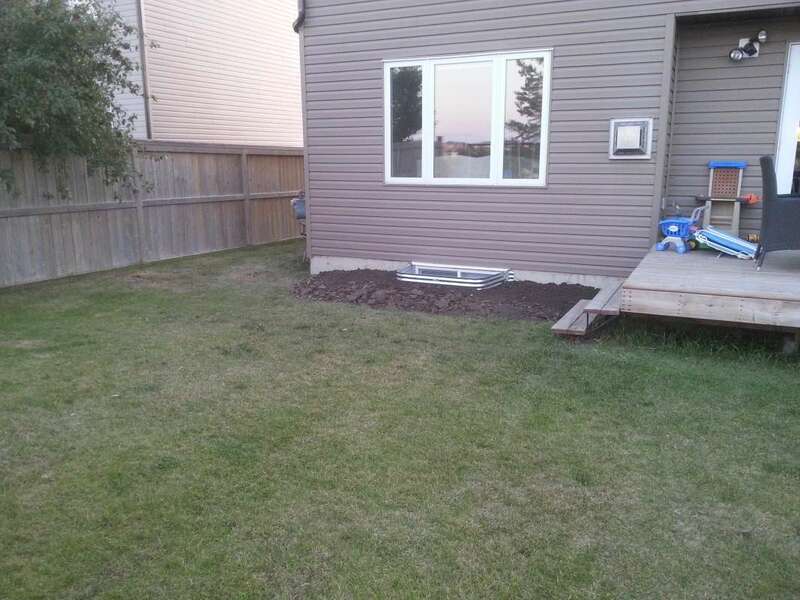 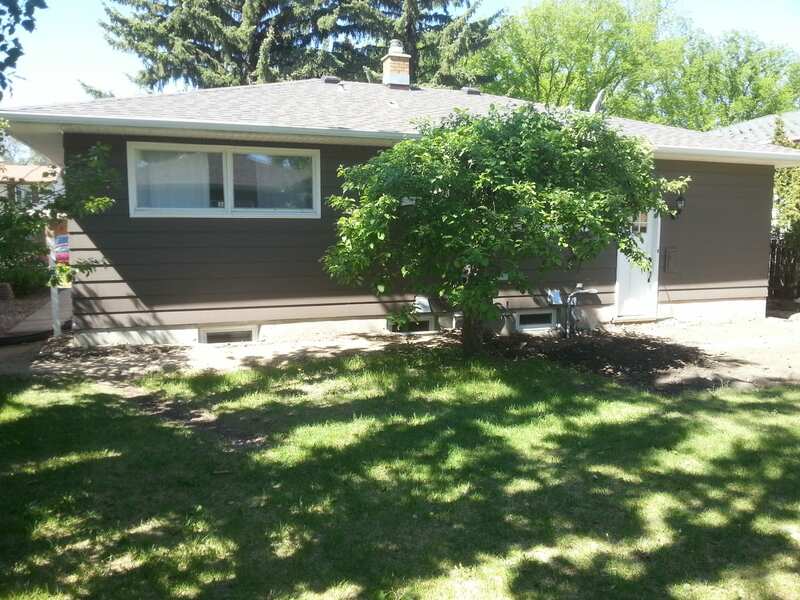 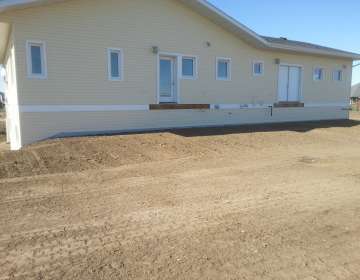 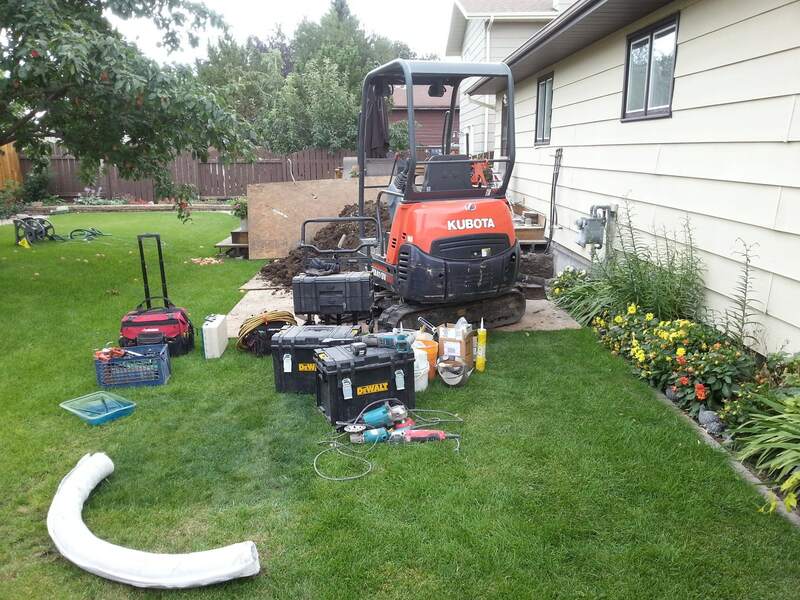 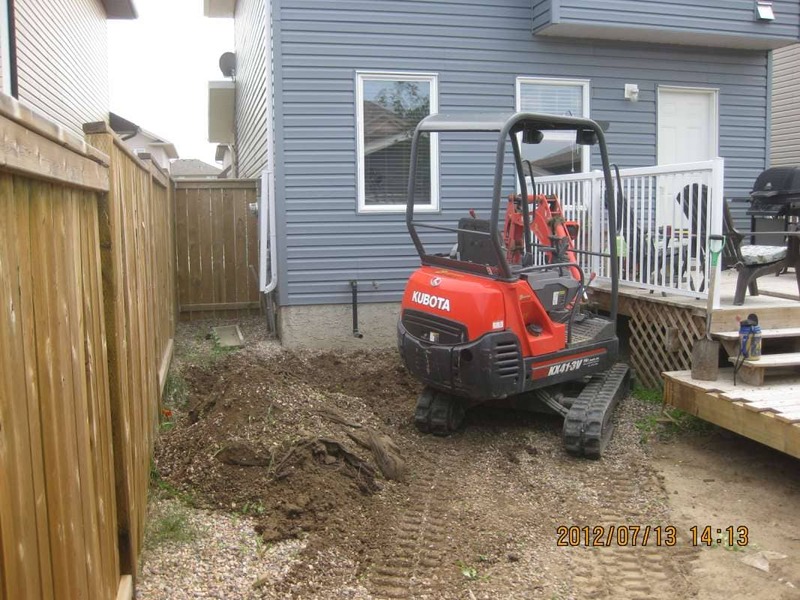 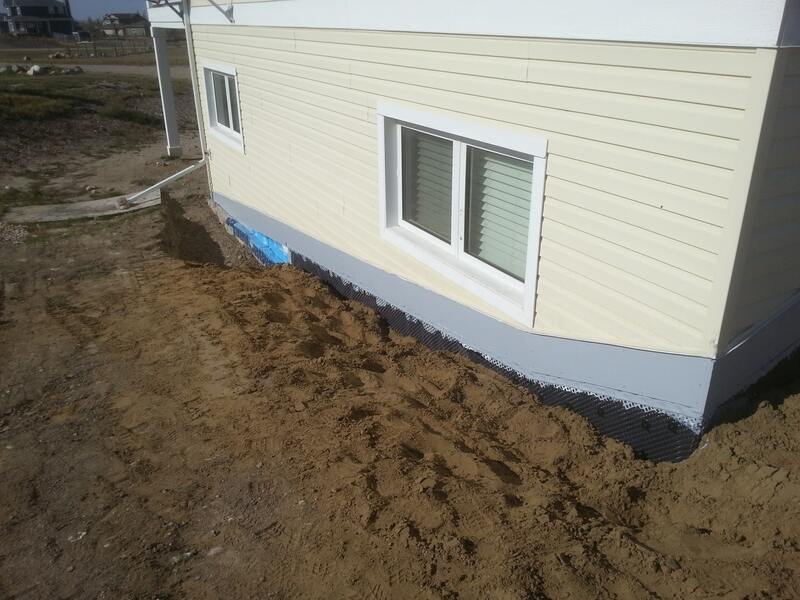 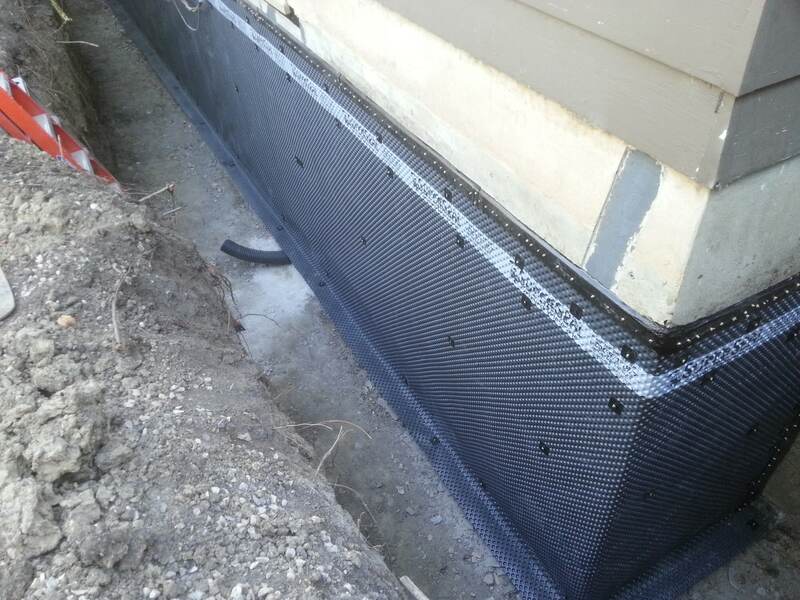 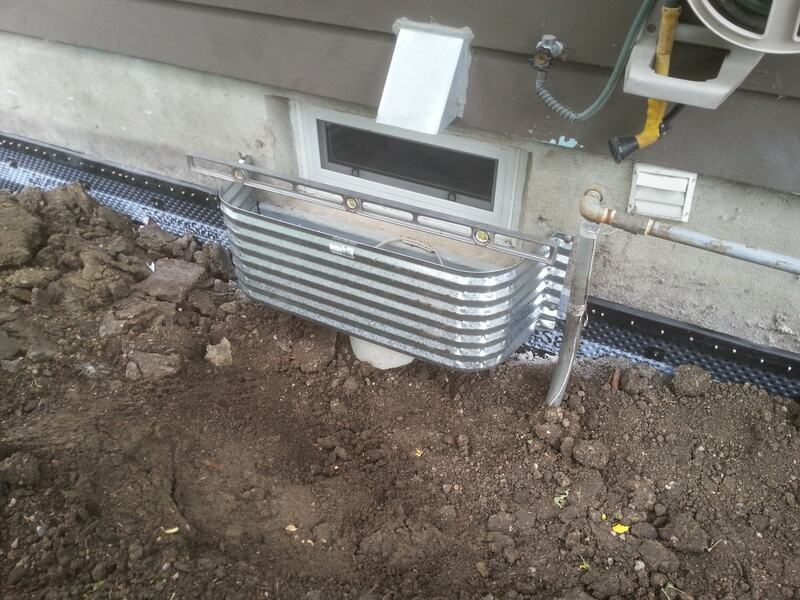 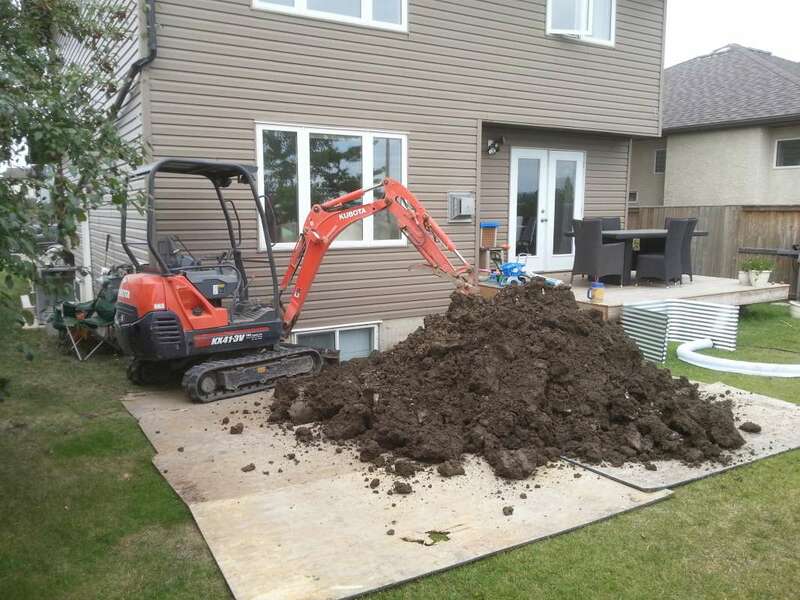 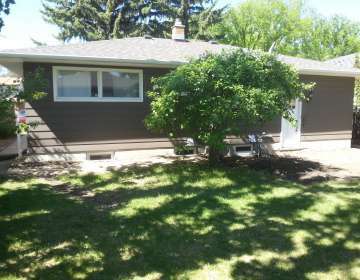 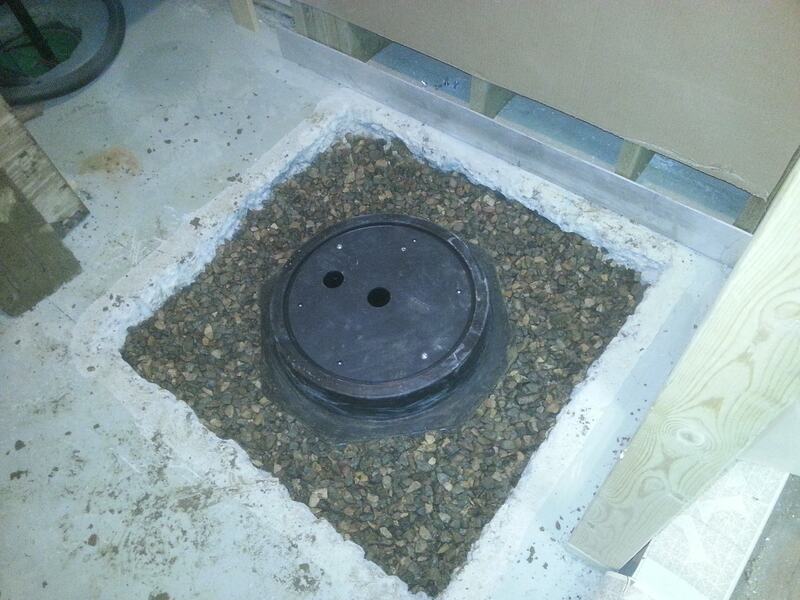 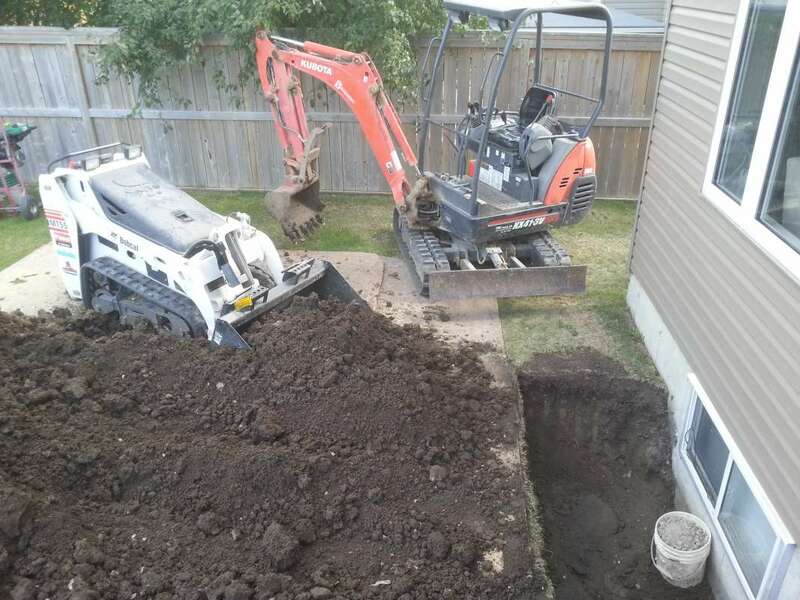 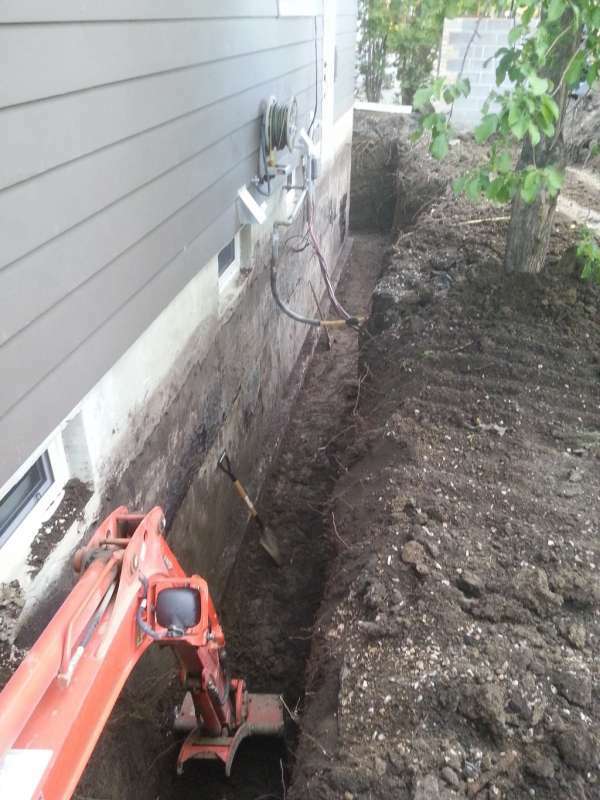 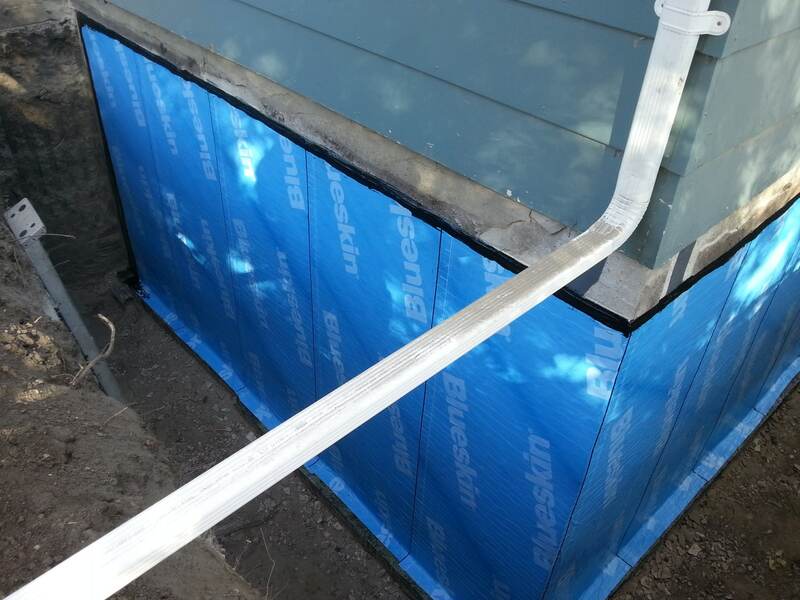 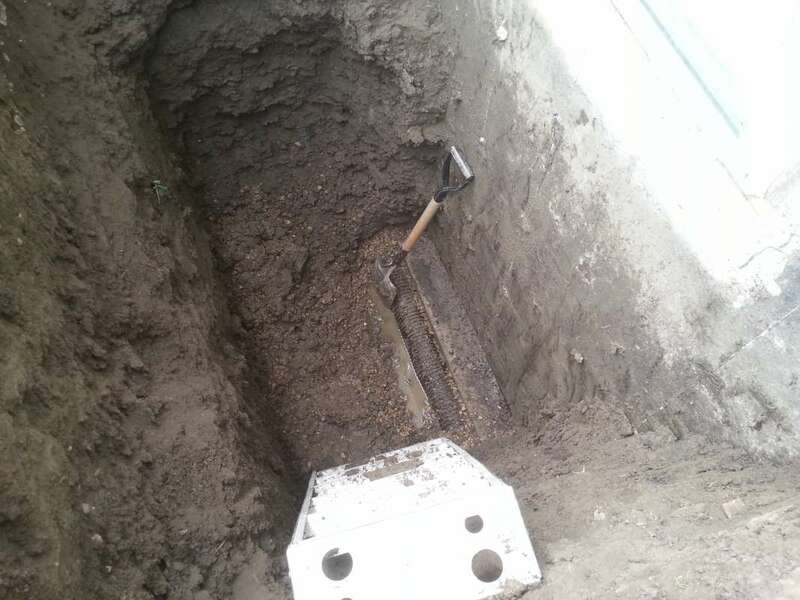 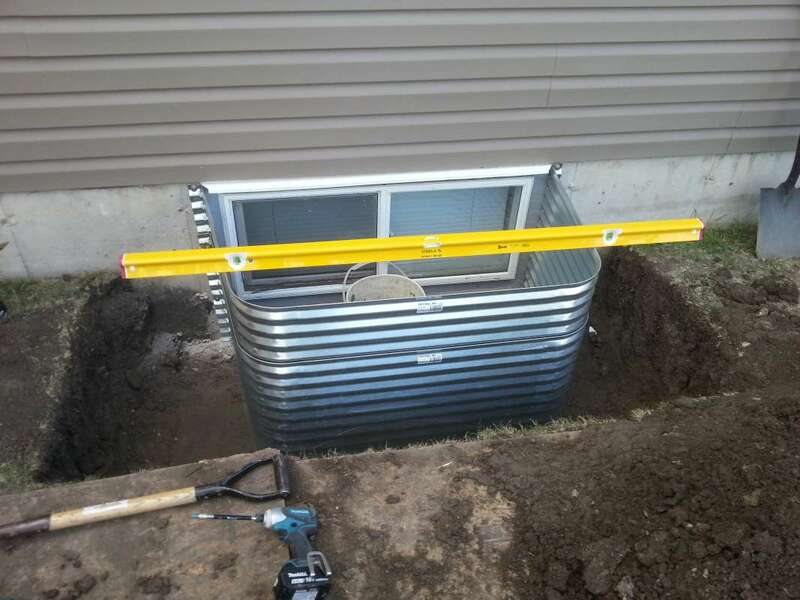 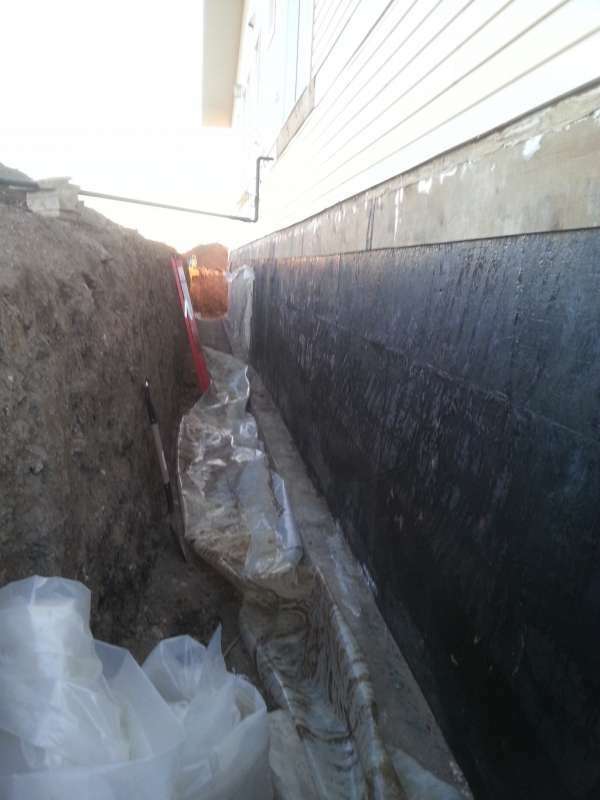 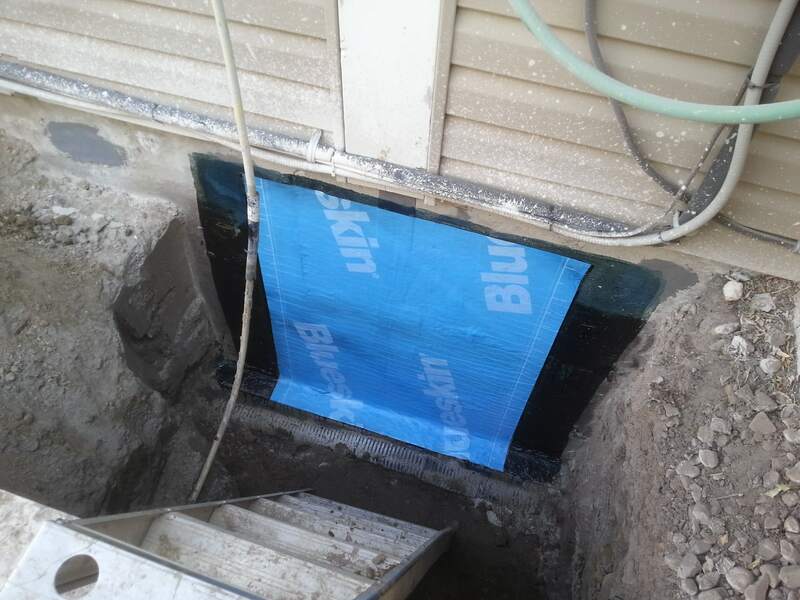 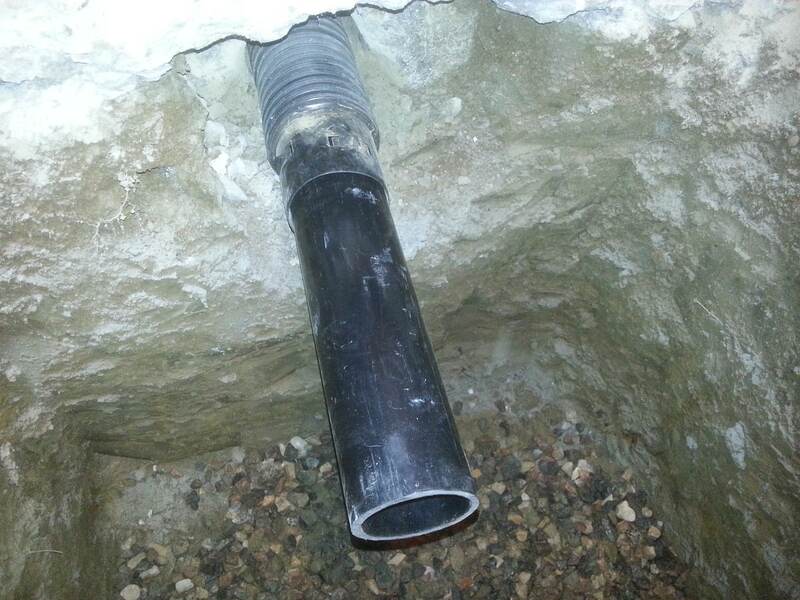 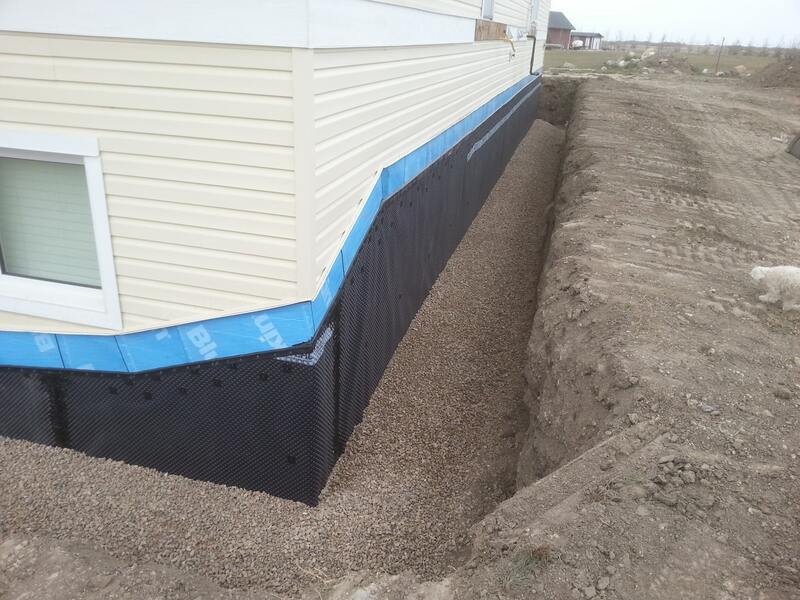 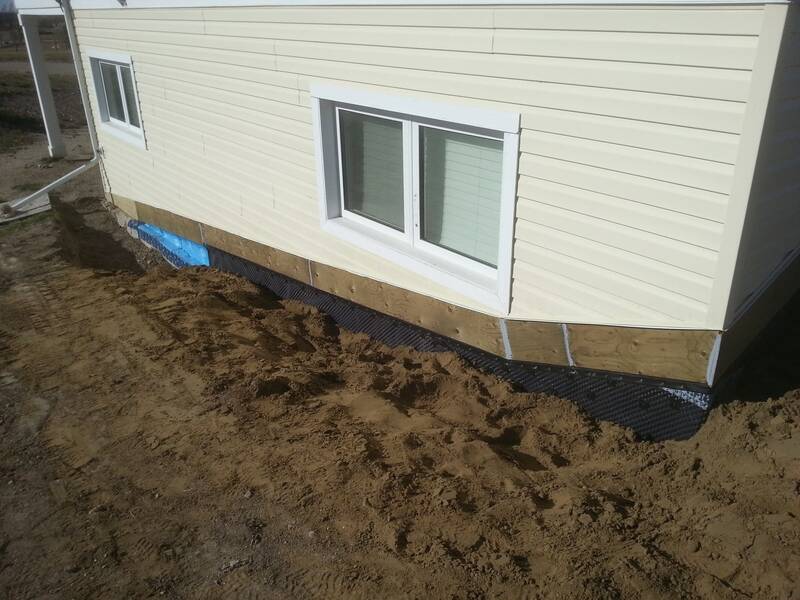 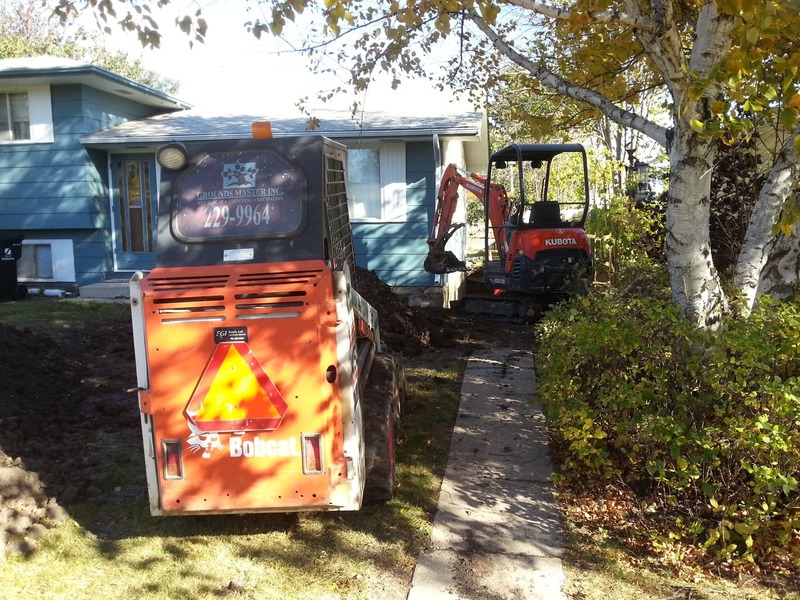 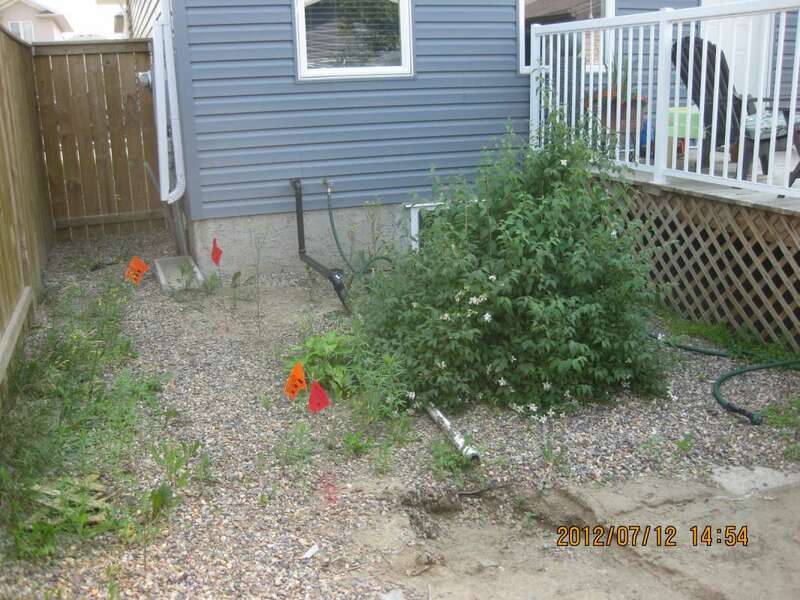 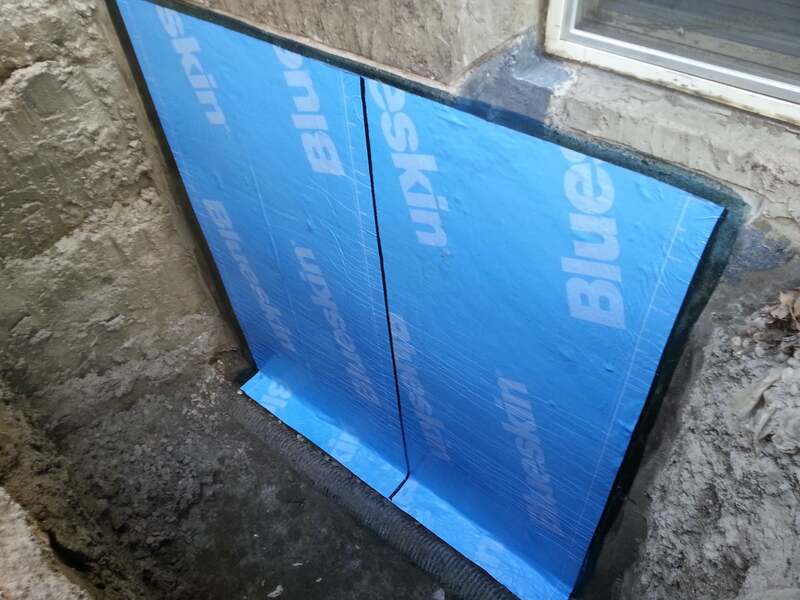 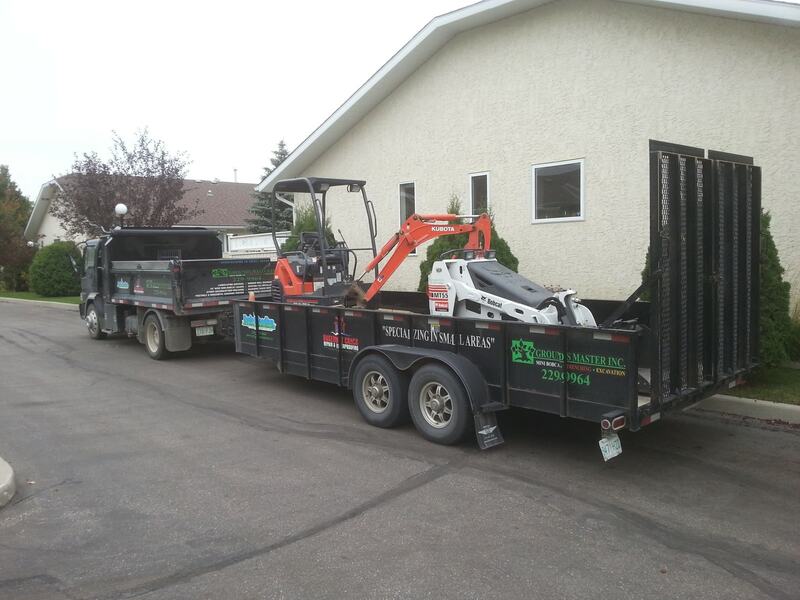 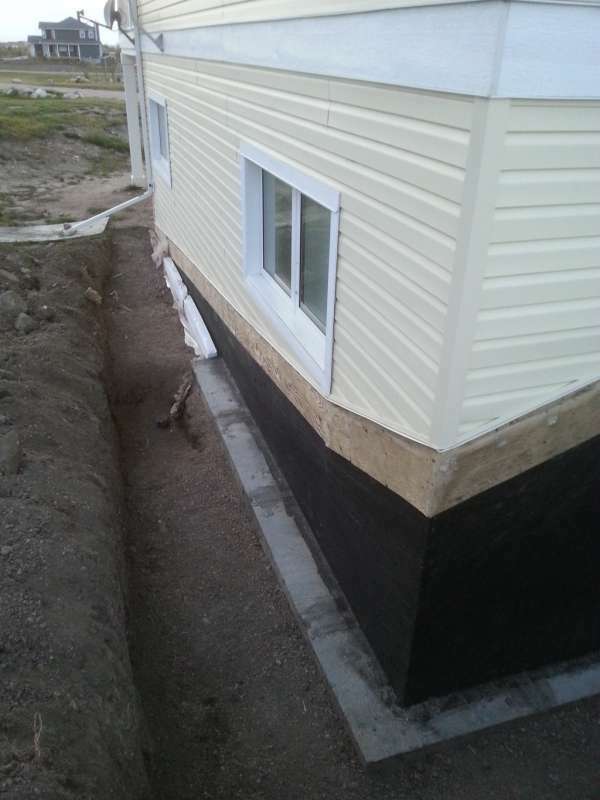 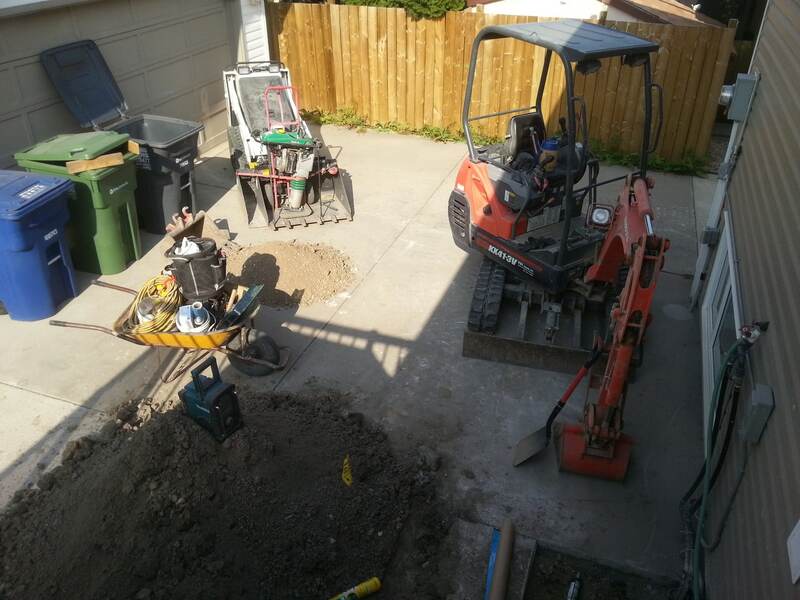 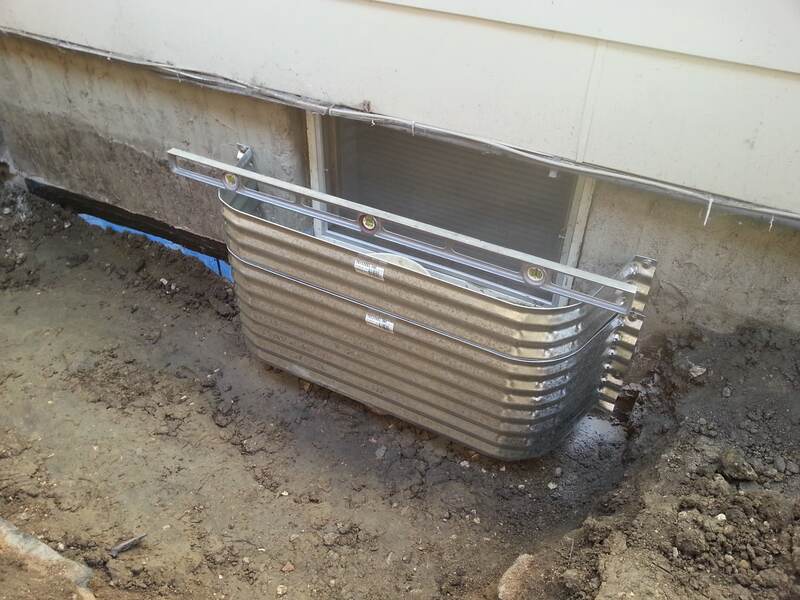 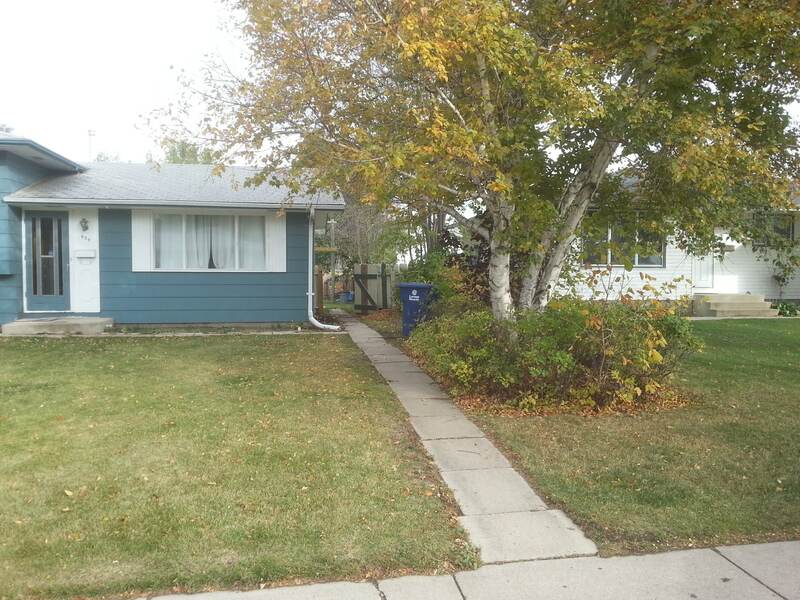 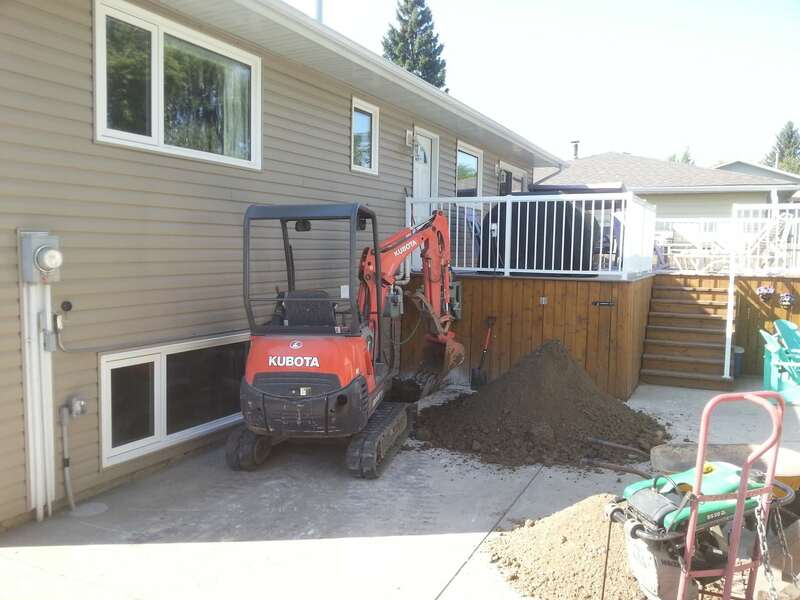 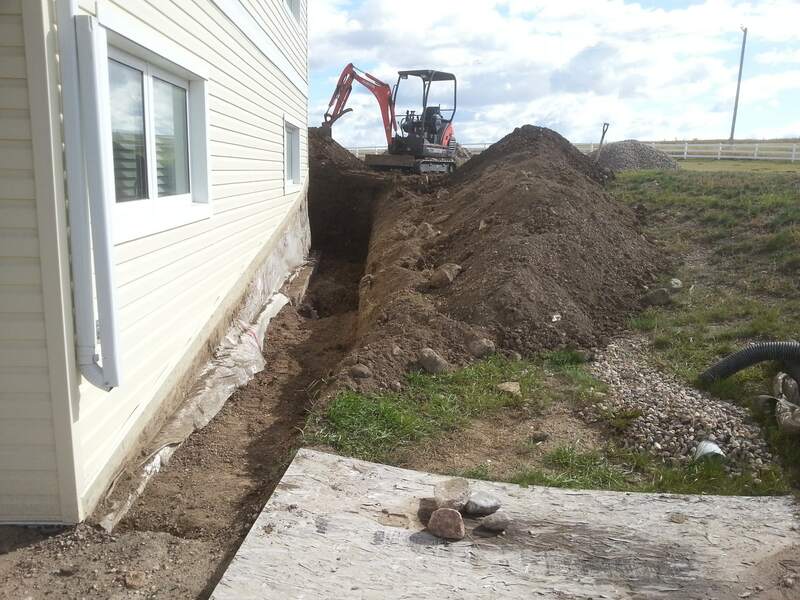 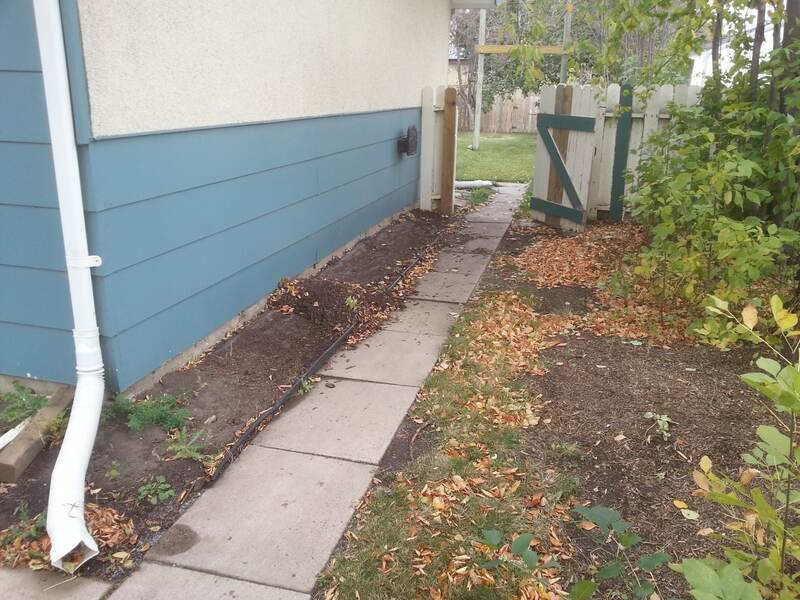 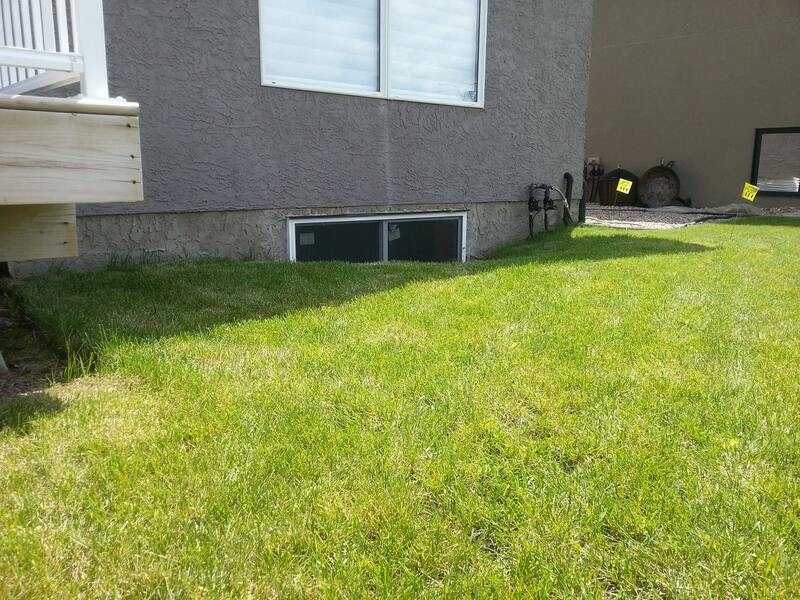 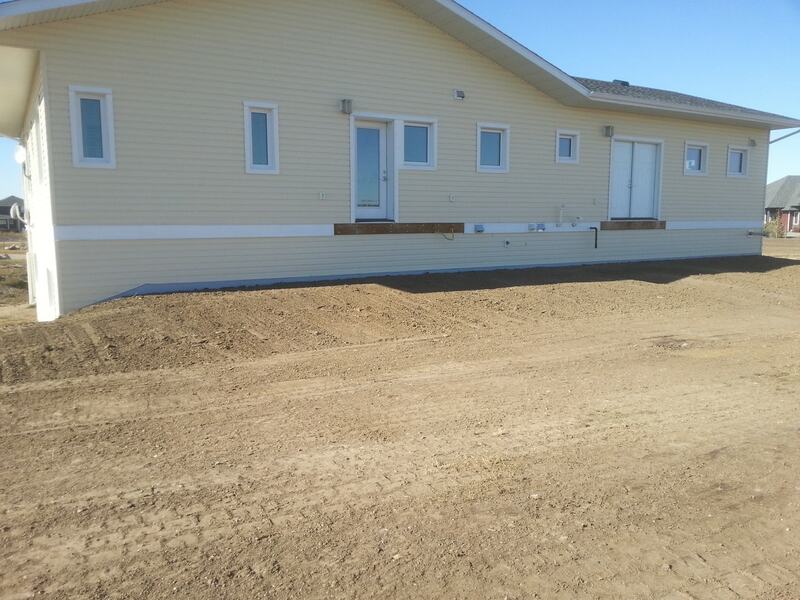 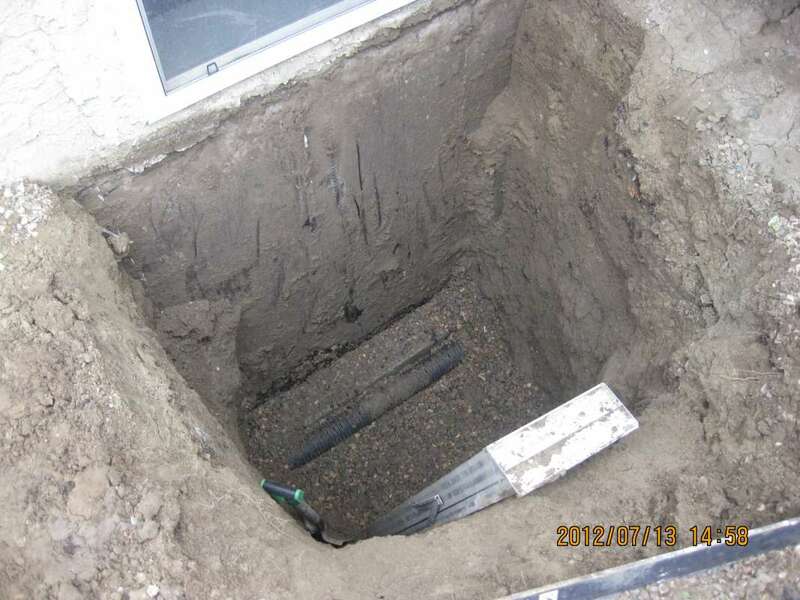 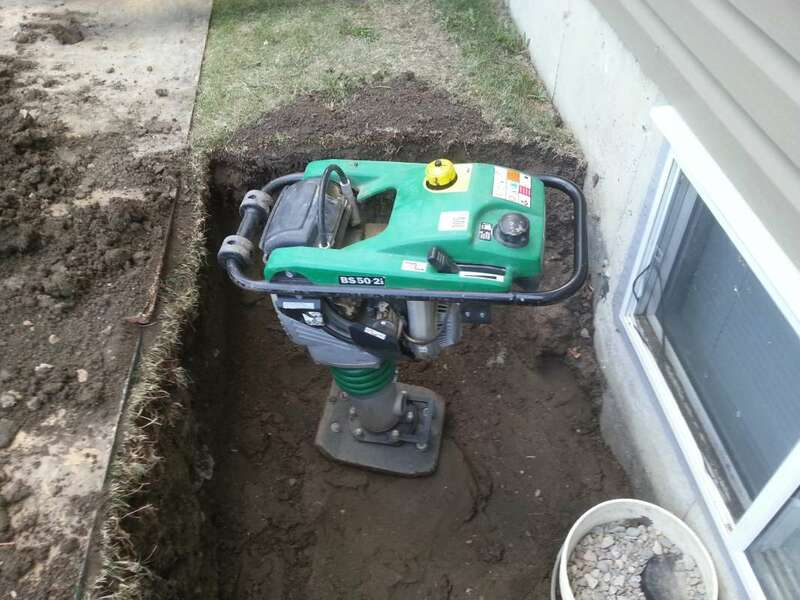 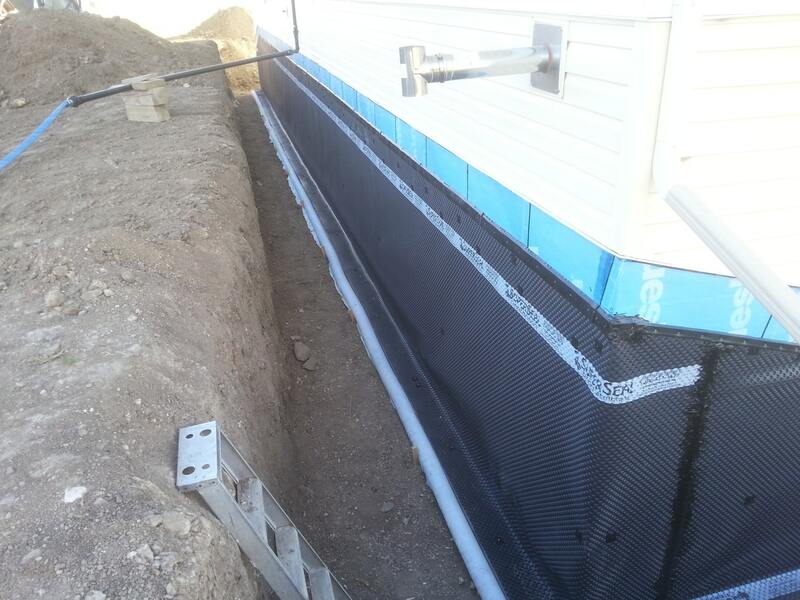 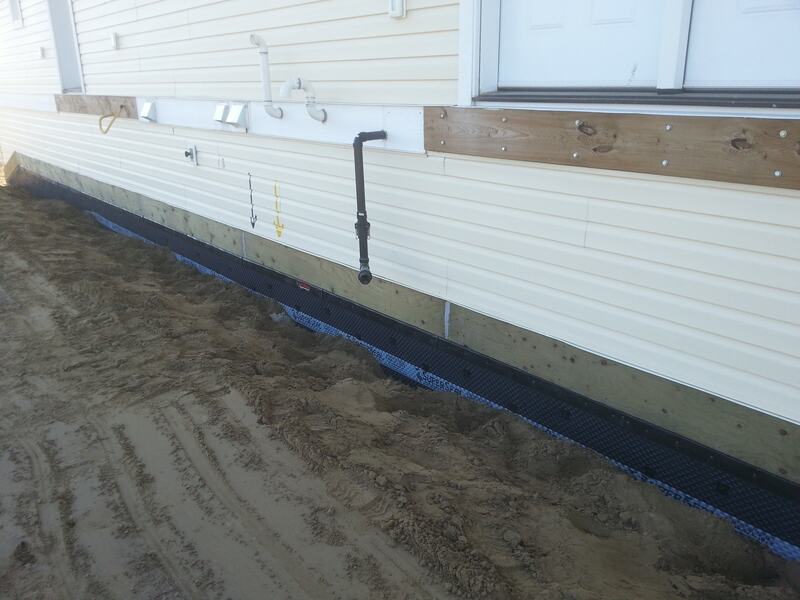 In the Saskatoon area, the current industry standard for new residential building construction includes the installation of weeping-tile around the foundation footing (bottom of the basement), vertical drain stacks at every basement window, and a sump-pit for the water to drain into. 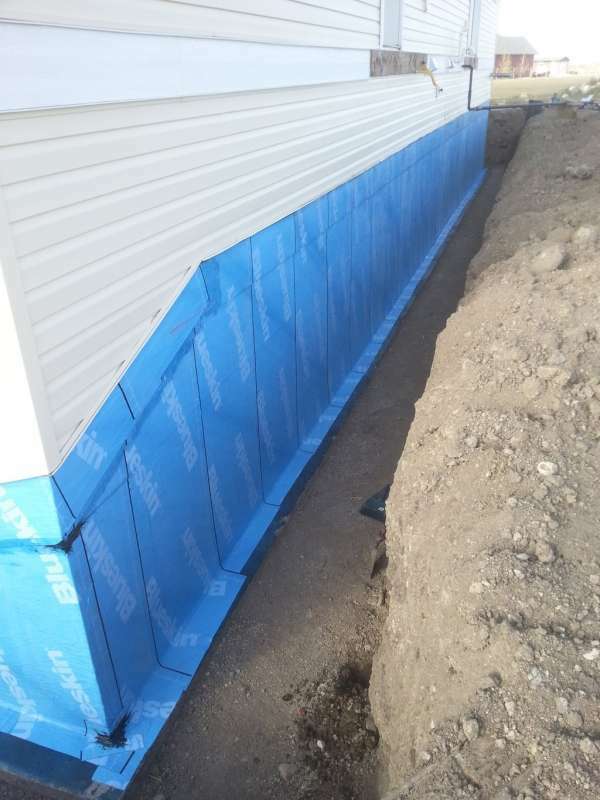 When one or more walls are excavated and waterproofed on an existing (older) foundation wall, the additional installation of weeping-tile should always be considered. 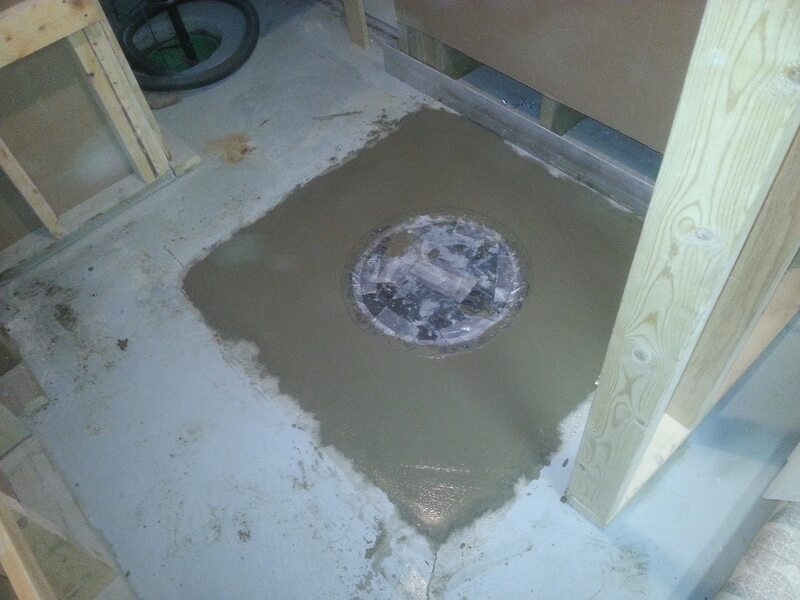 In a house that was constructed without a weeping-tile (or clay-tile) system, this means that the customer will be facing additional costs associated with draining off the water from the newly installed weeping-tile, into a sump-pit, which must also be installed inside the (interior) basement living space. 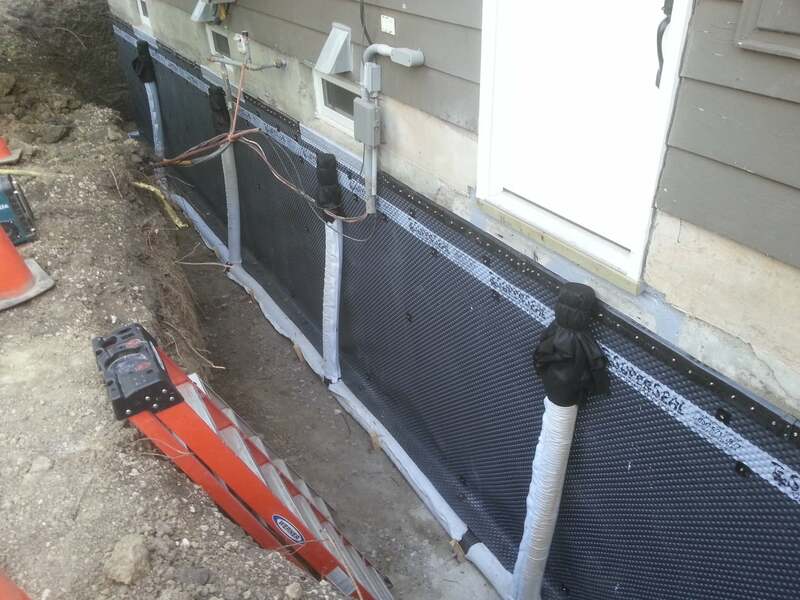 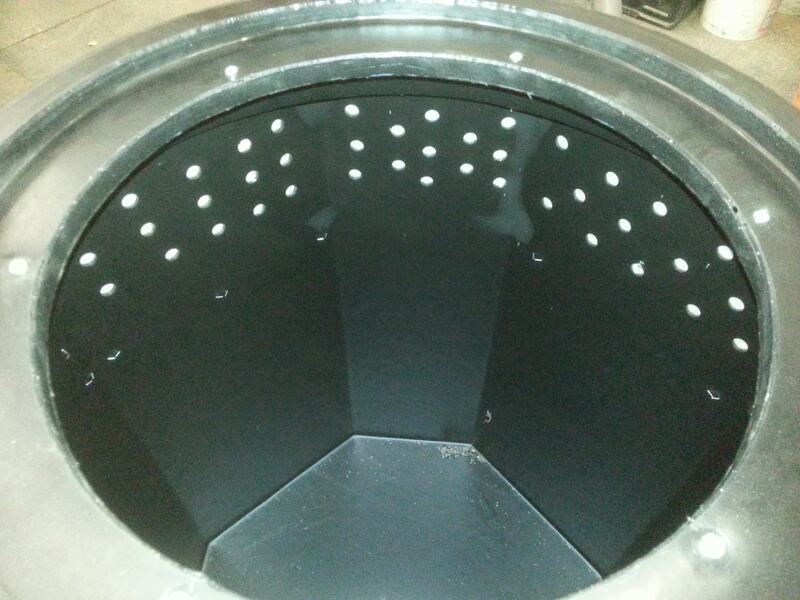 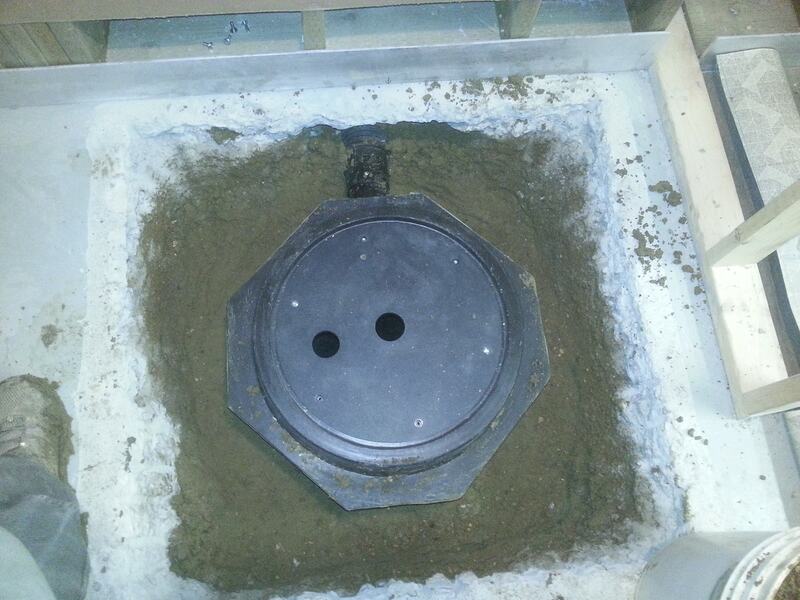 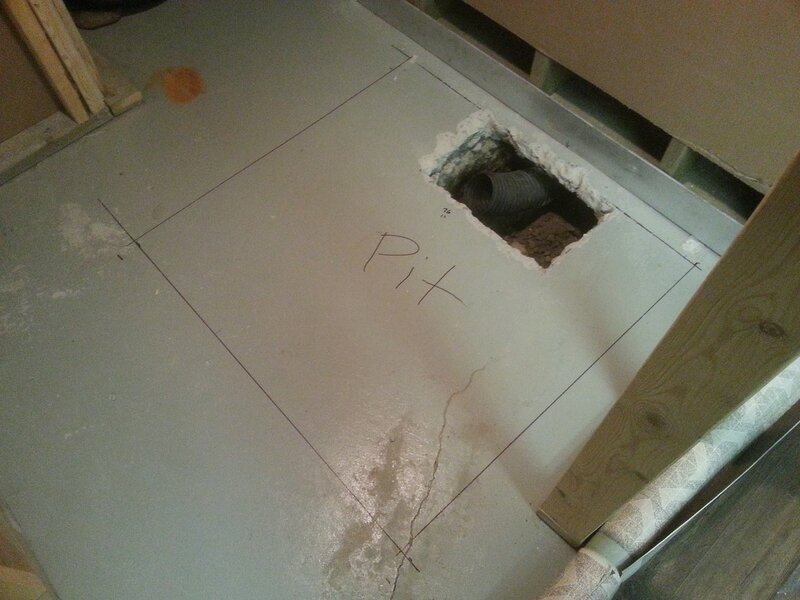 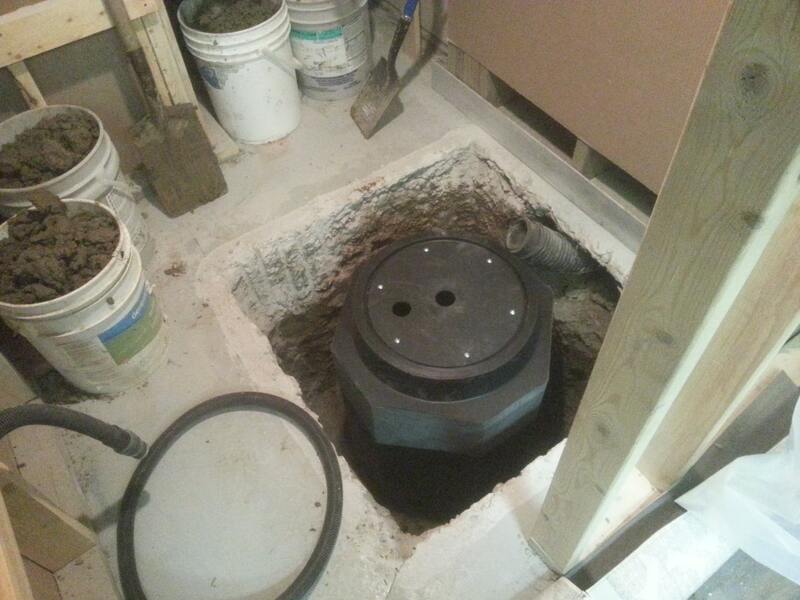 In the past, customers who were having basement waterproofing done, had opted to not have the new weeping-tile installed, mostly due to the additional costs associated with the sump-pit installation, and the fact that they did not want a sump-pit installed in their beautifully developed home. 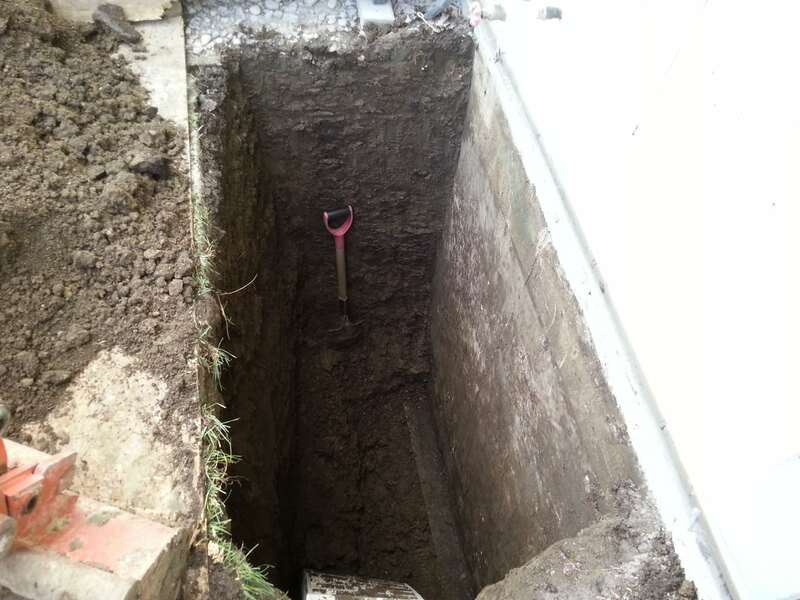 Though this is never recommended, in the end, the final decision will always be left up to the customer. 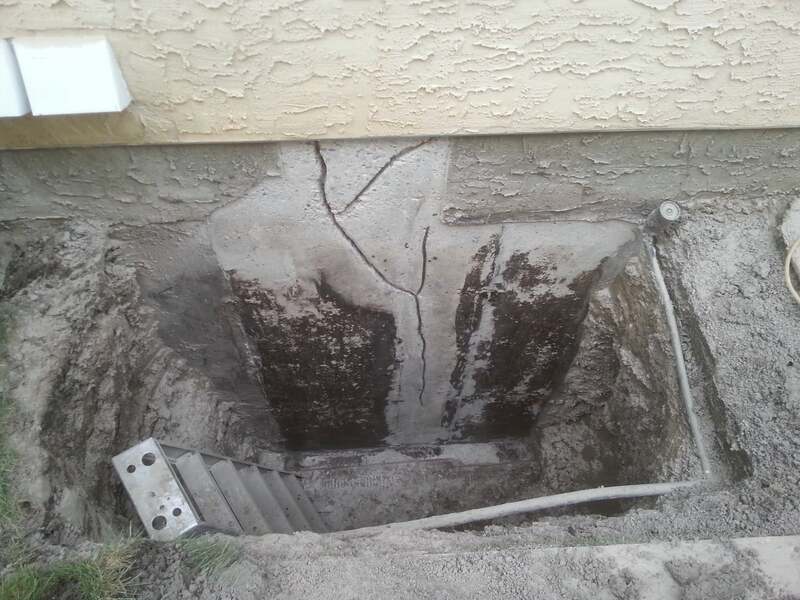 A proper weeping-tile system, located at the footing of the foundation, is a pre-requisite for this type of repair or upgrade. 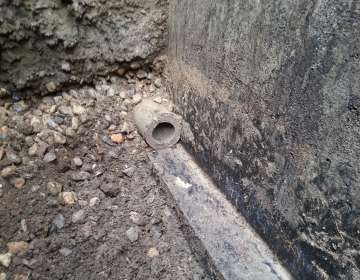 The window area is excavated down to the existing weeping-tile. 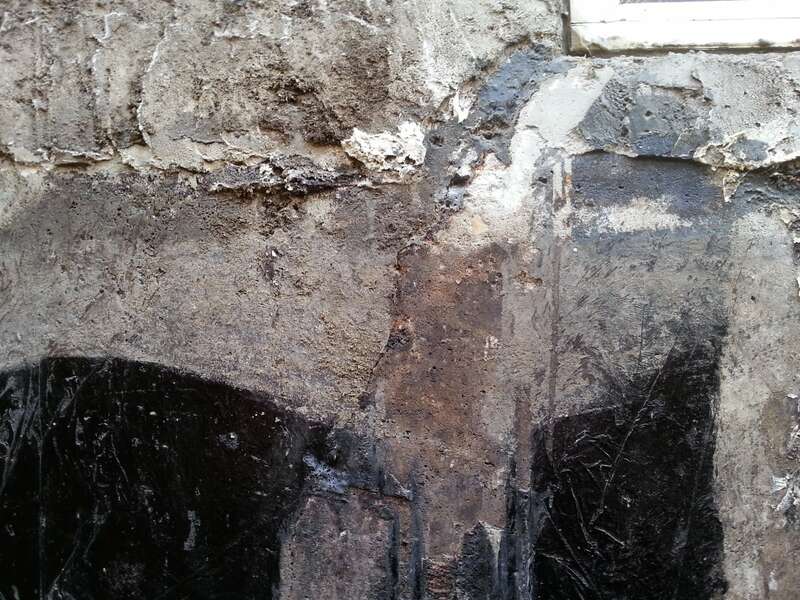 A vertical section of weeping-tile is “T”-ed into the main weeping-tile below. 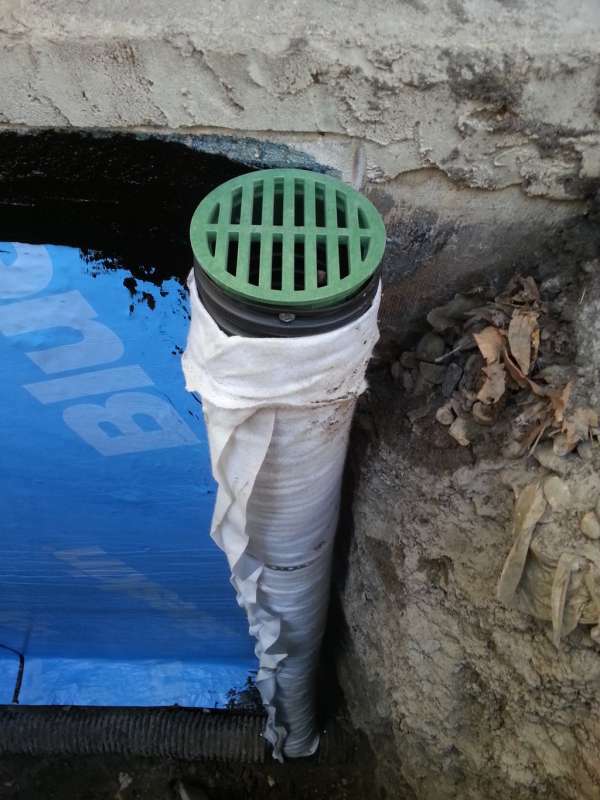 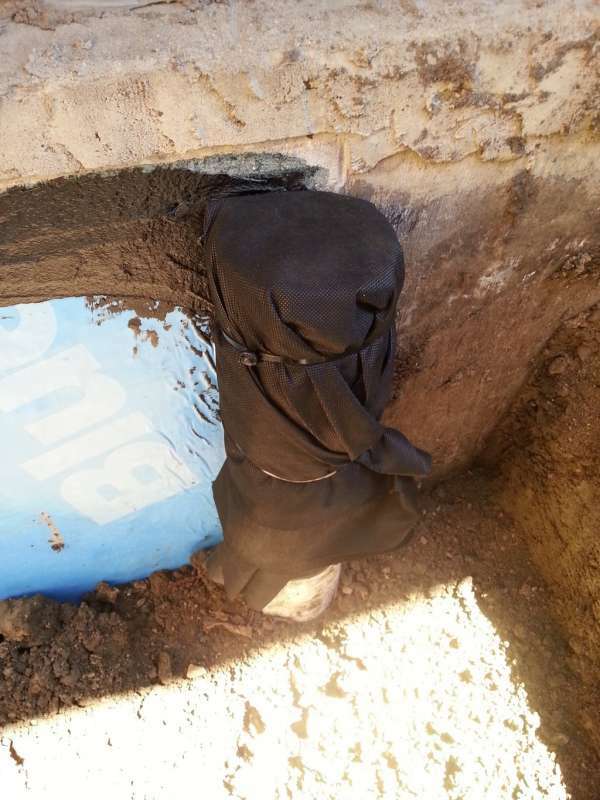 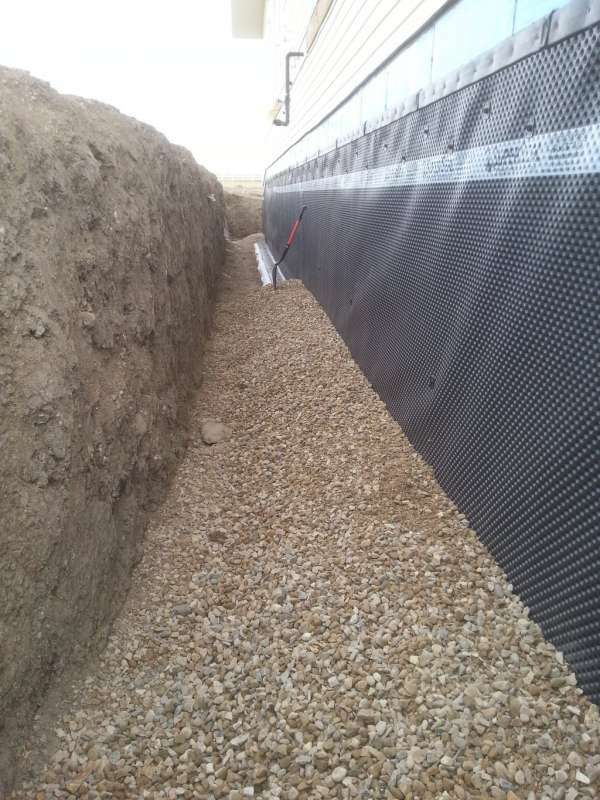 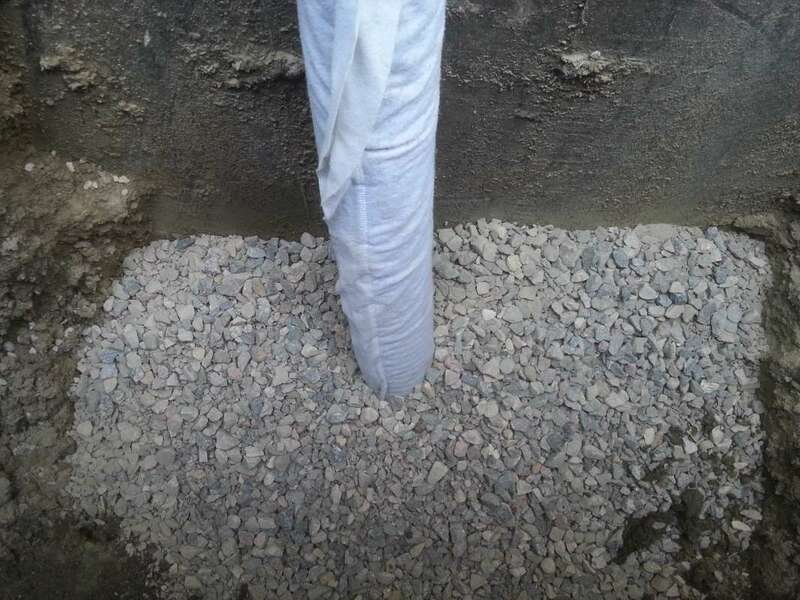 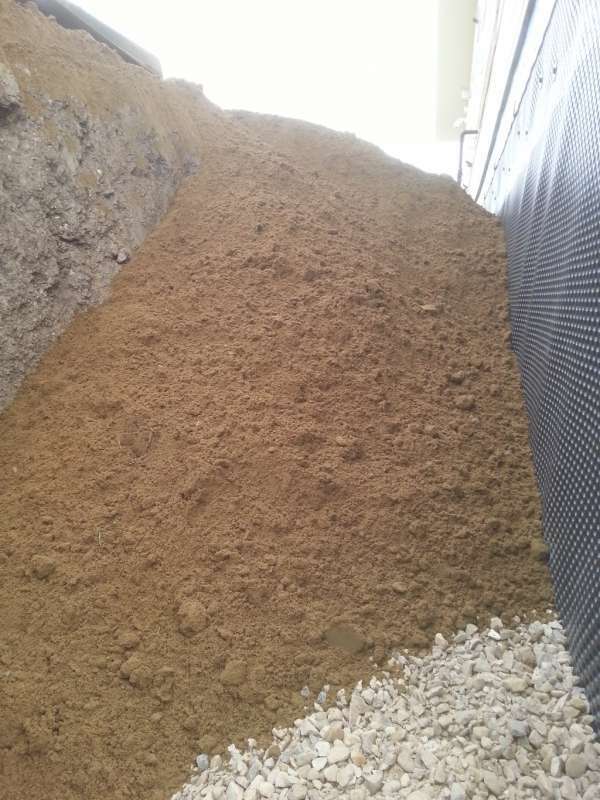 The new vertical drain stack is securely anchored to the wall to prevent movement, a drain cover and geotextile wrap is installed, and the excavated area is backfilled. 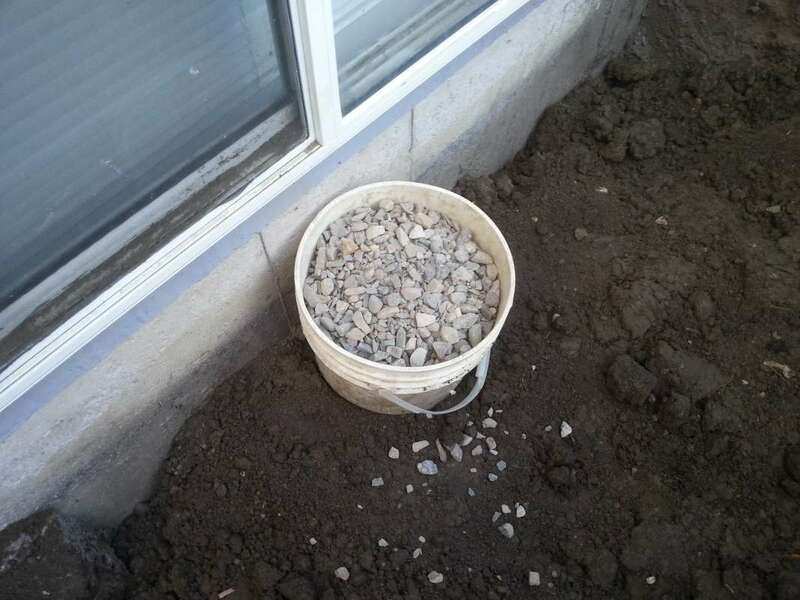 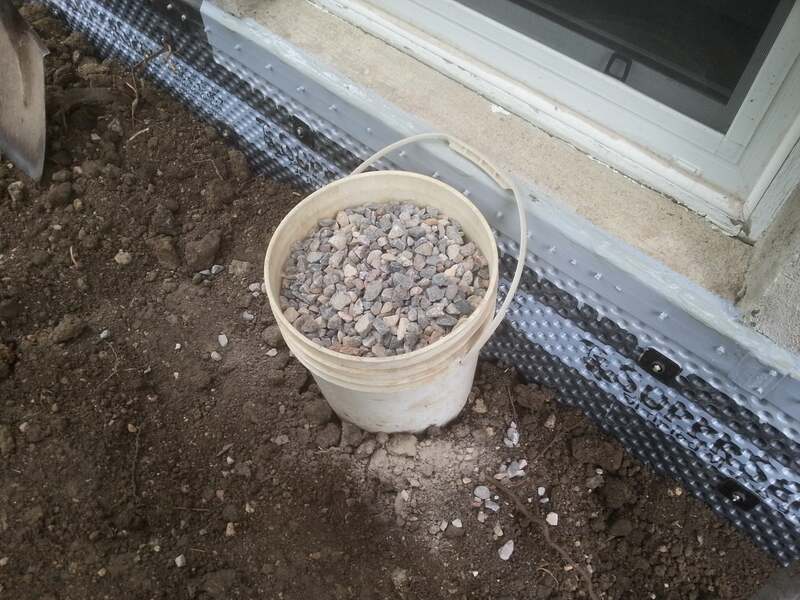 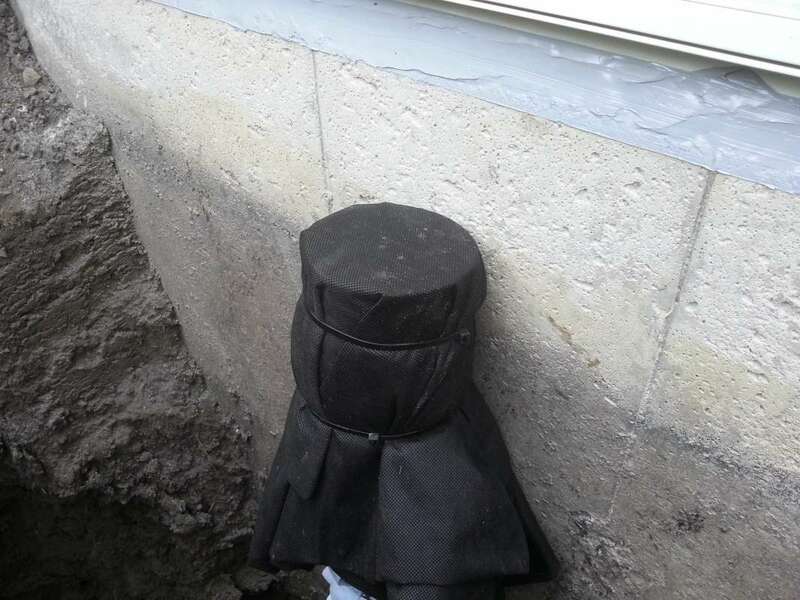 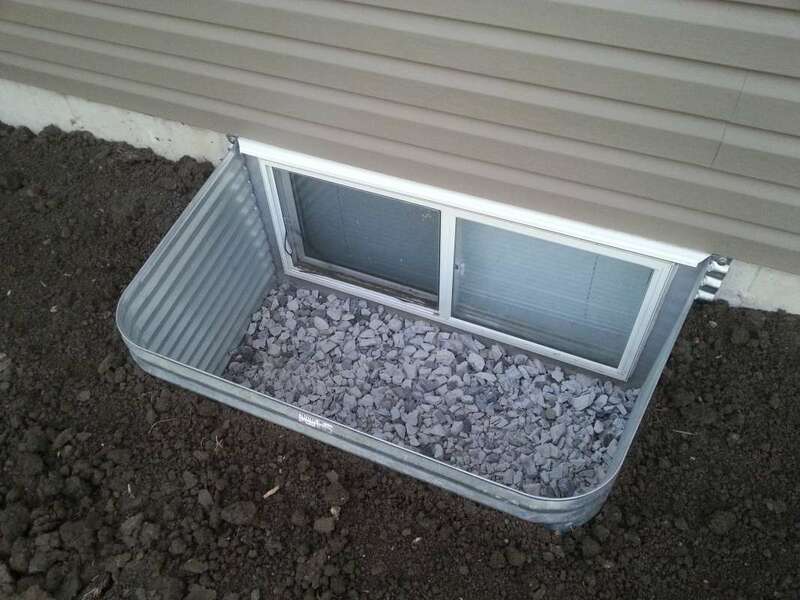 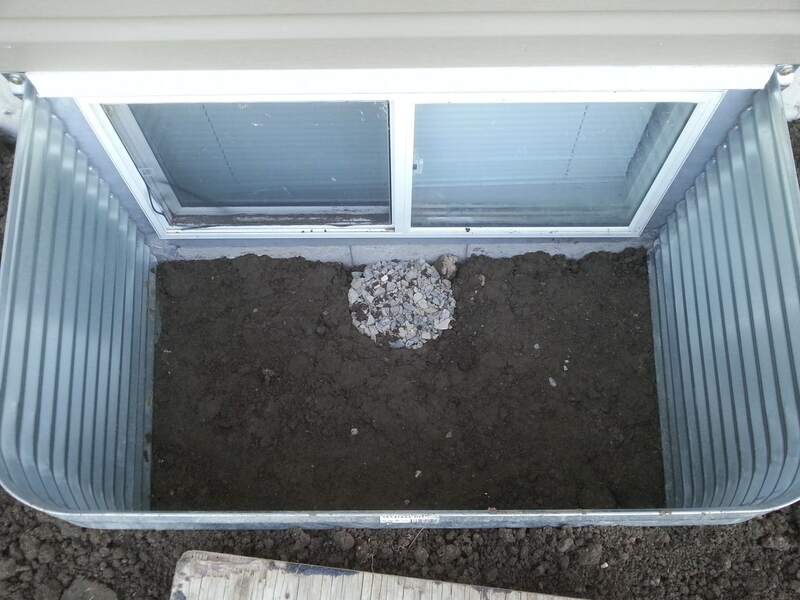 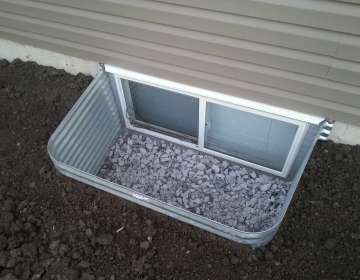 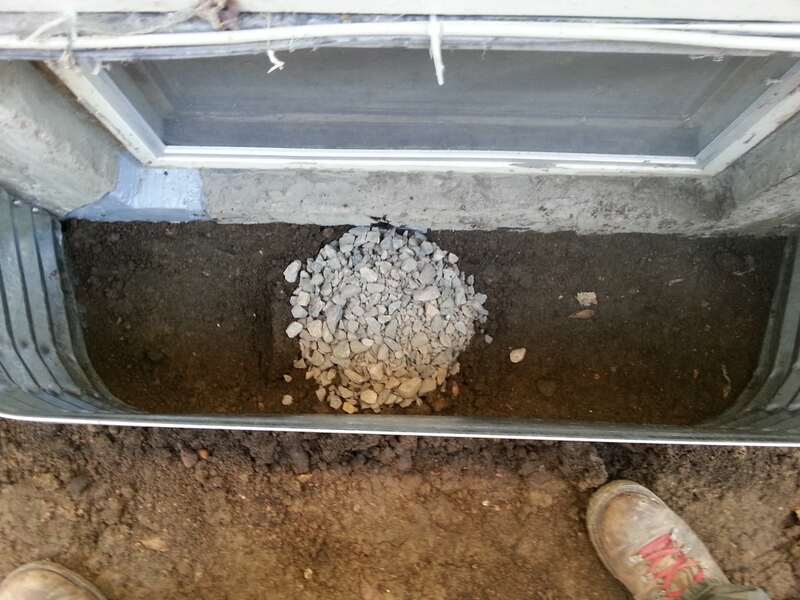 The new window-well will be installed and secured to the foundation around the window, and decorative landscape rock is placed inside the window-well, concealing the top of the new drain cover. 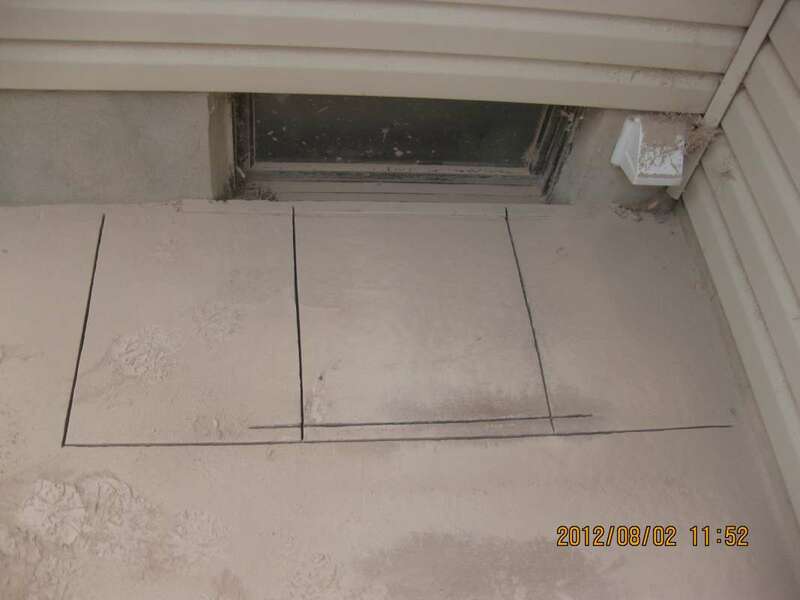 A detailed photo CD of the repair work is supplied to all customers. 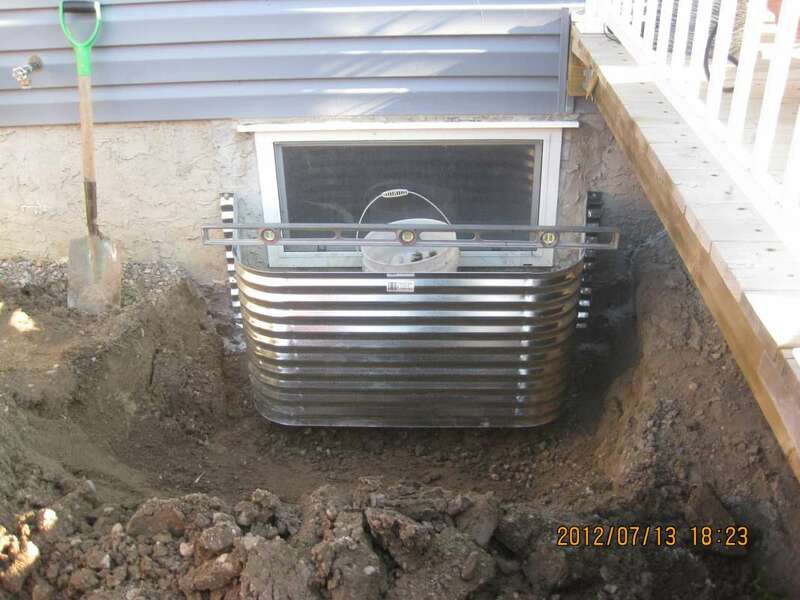 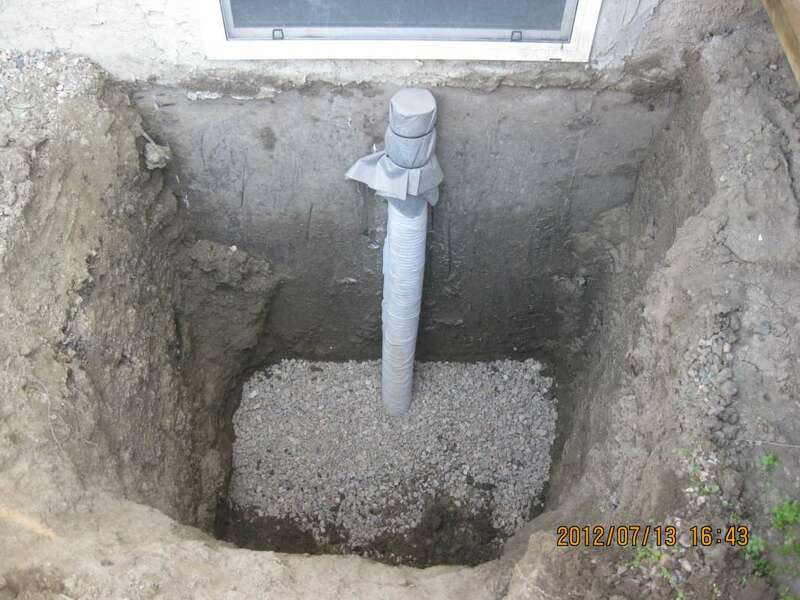 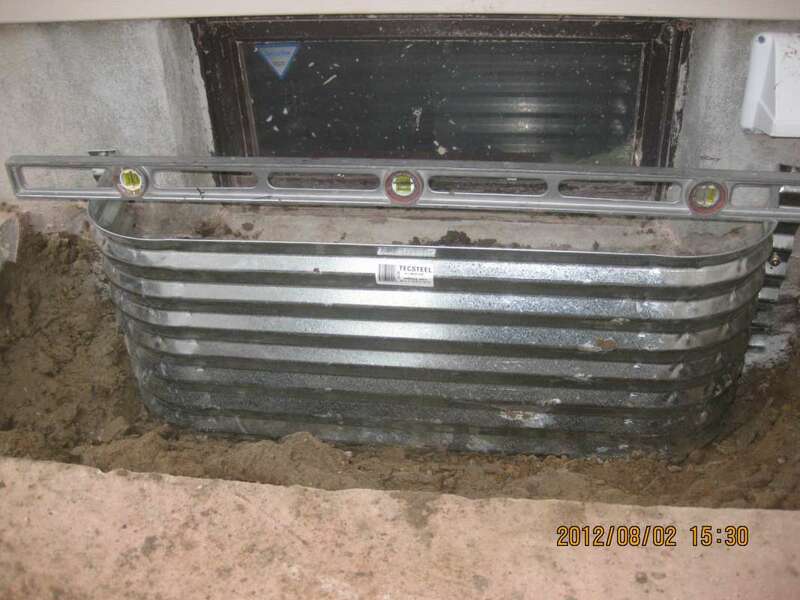 The current industry standard for residential building construction includes the installation of weeping-tile around the foundation footing, vertical drain stacks hung at every basement window, and a sump-pit for the water to drain into. 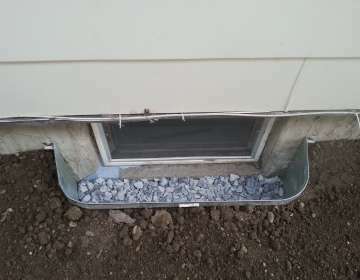 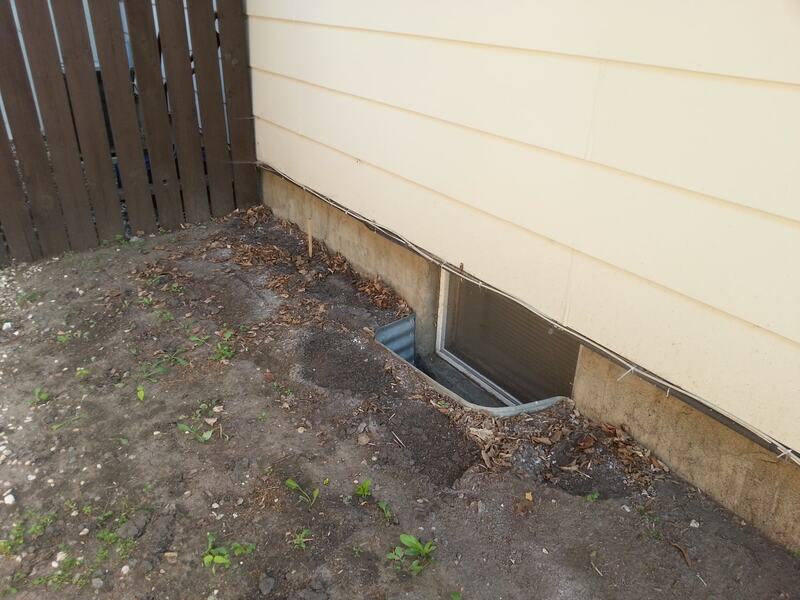 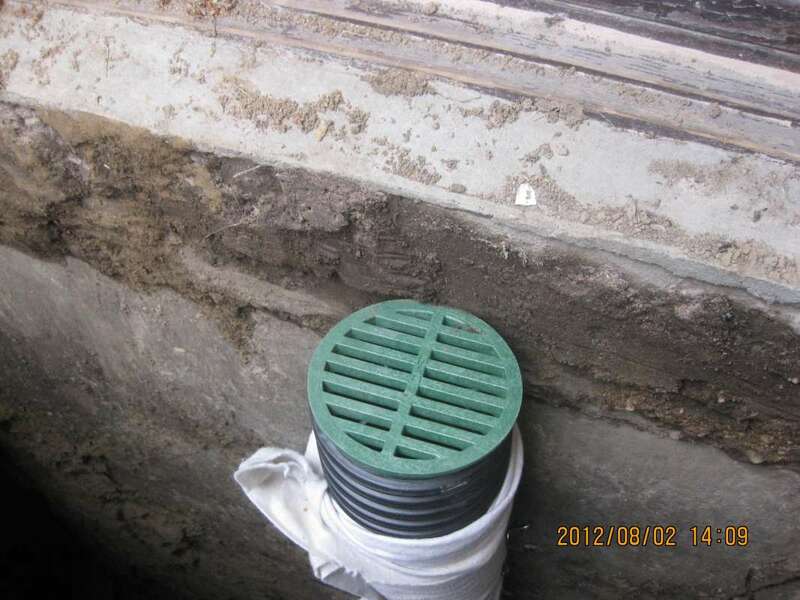 In the past few years, some new homes have begun developing a window-well drainage problem with their window-well drain stacks. 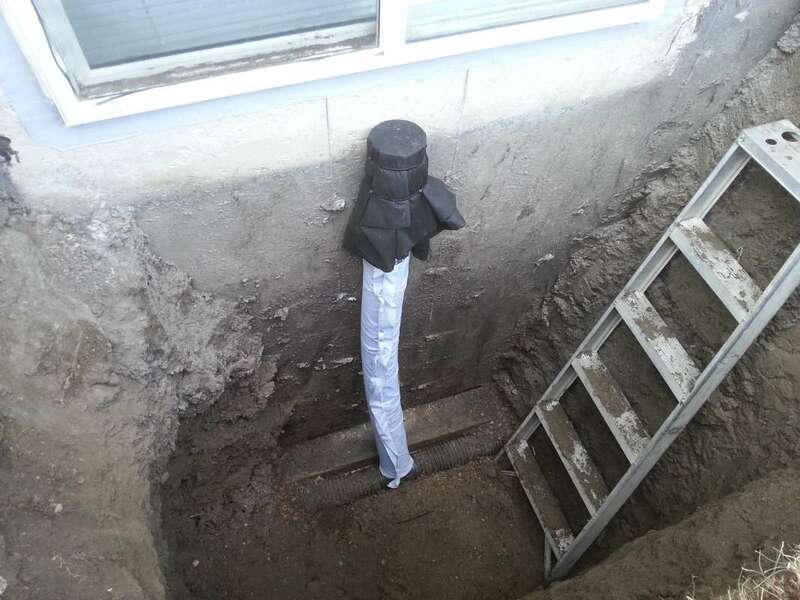 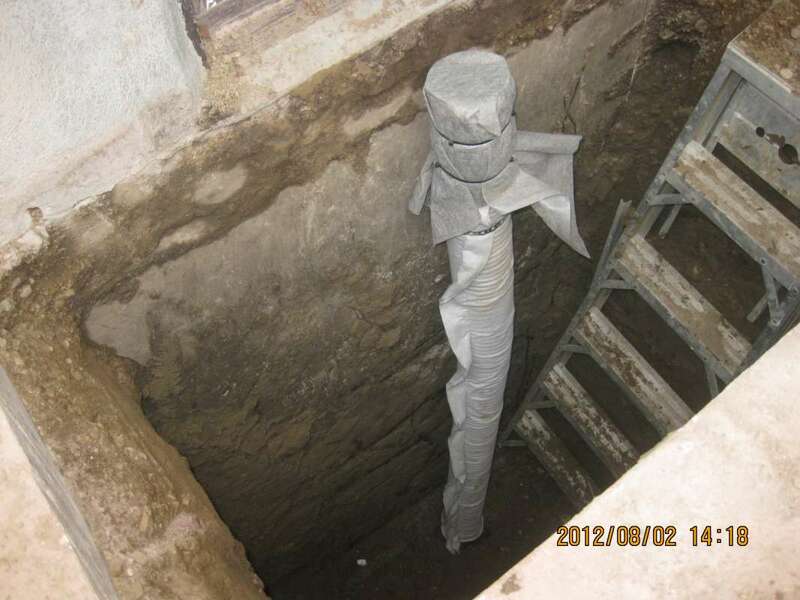 At the time of construction, these vertical drain stacks were simply hung over-top of the foundation weeping-tile, the drain pipe filled with crushed rock, then the area got back-filled. 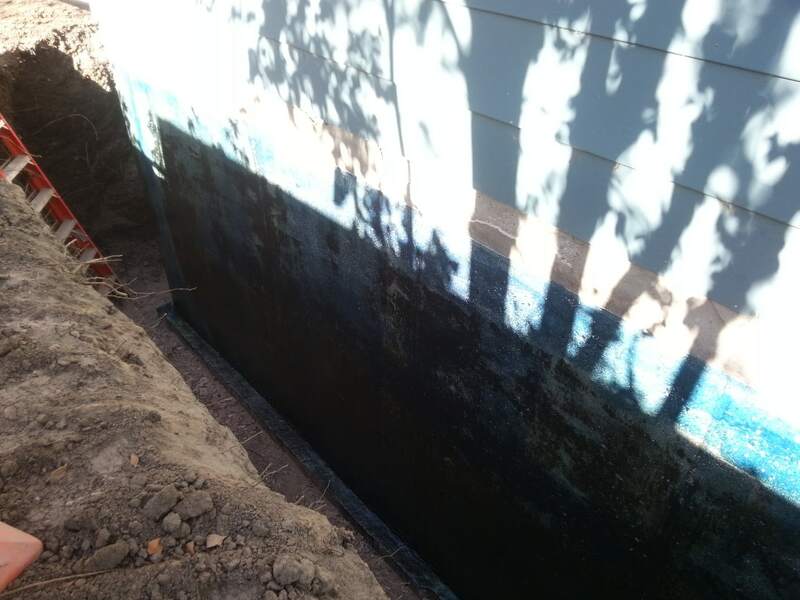 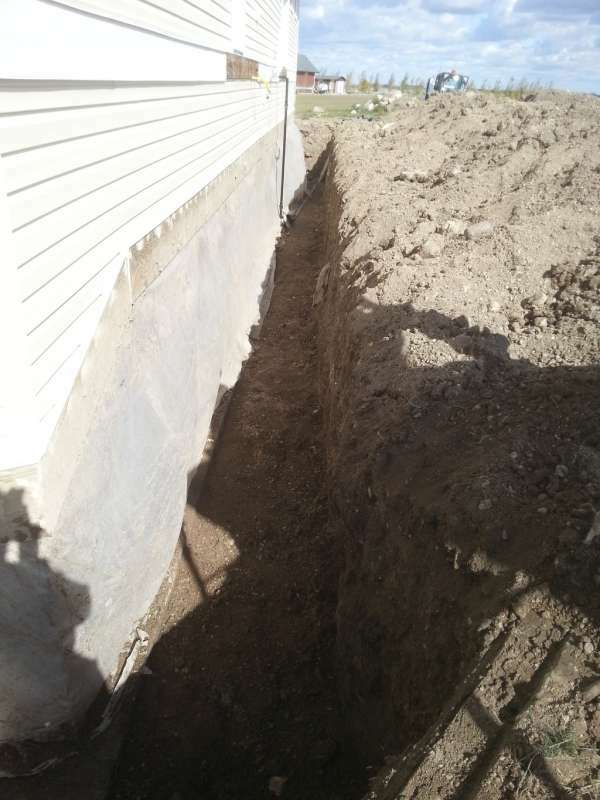 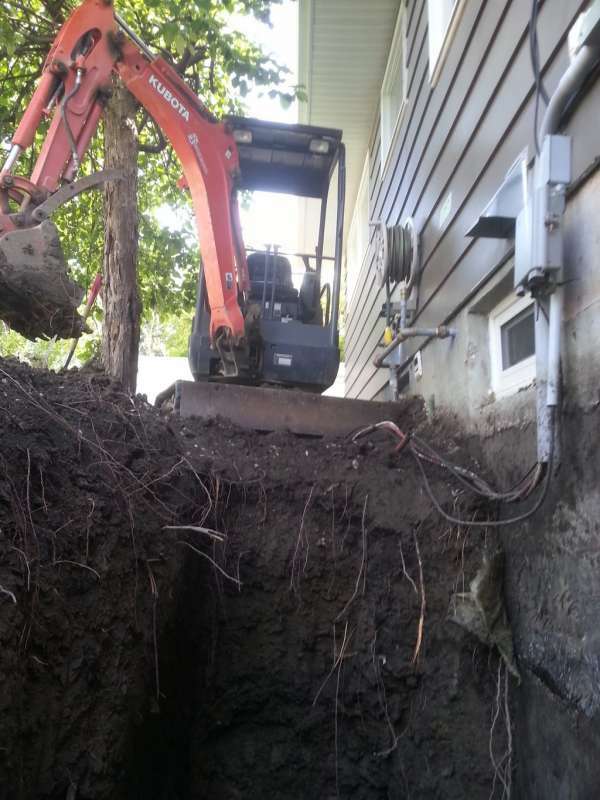 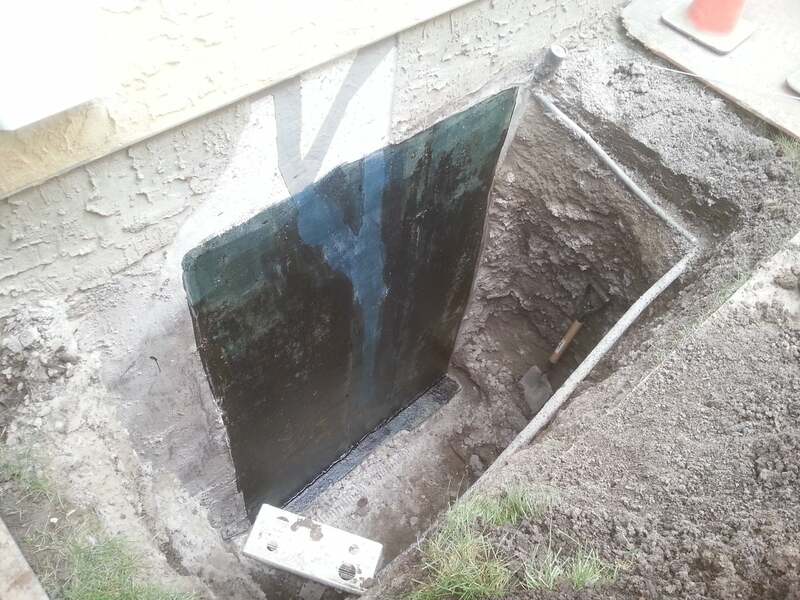 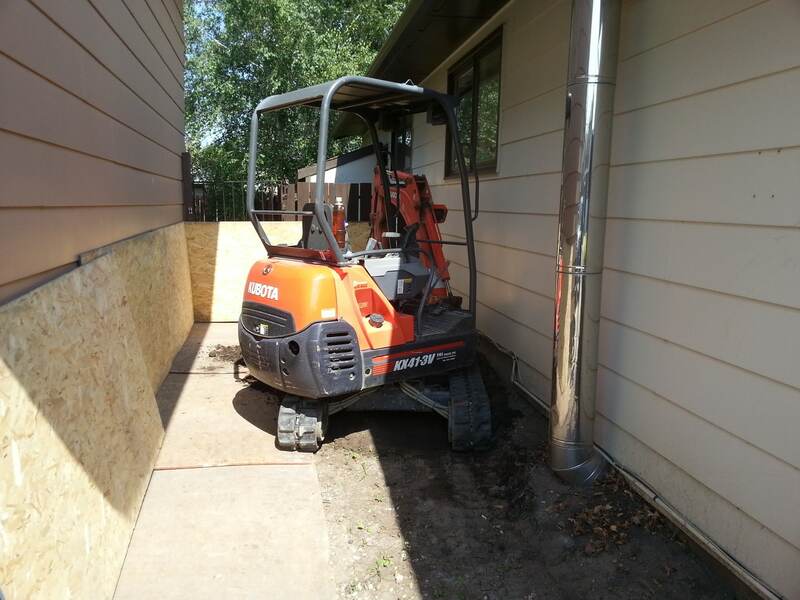 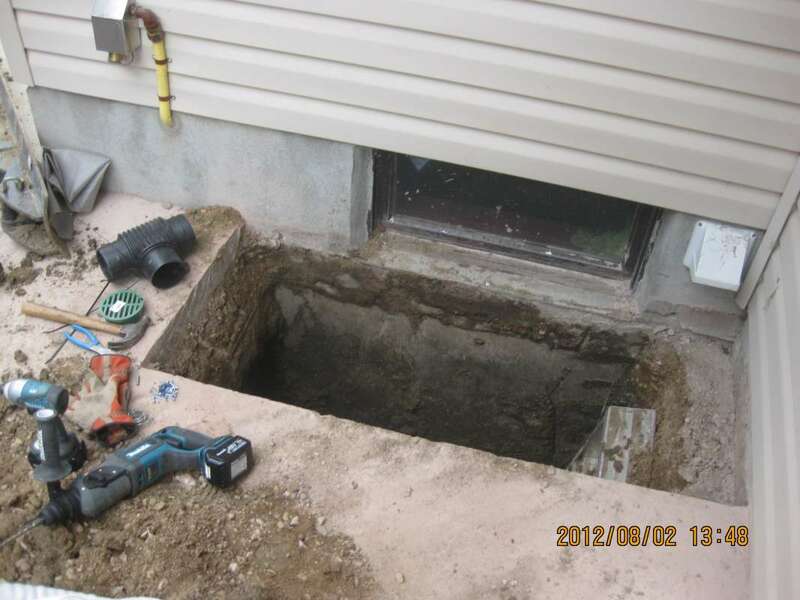 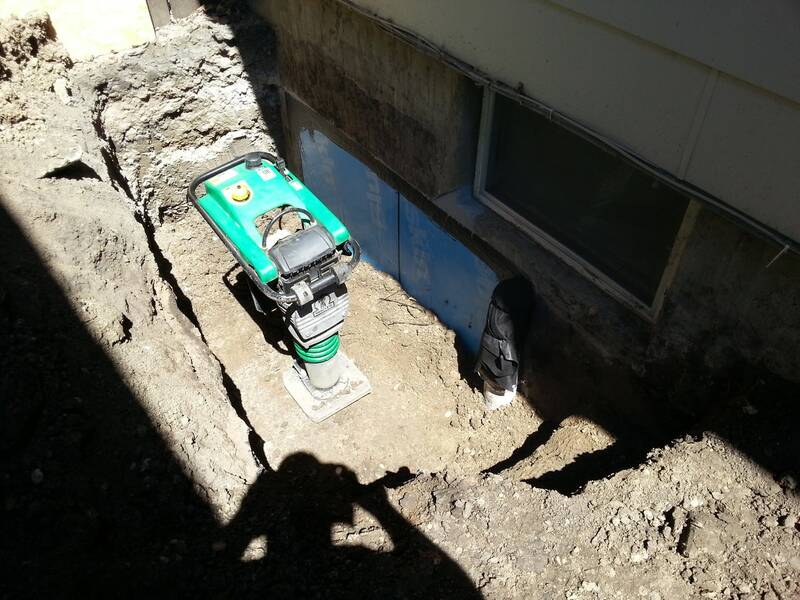 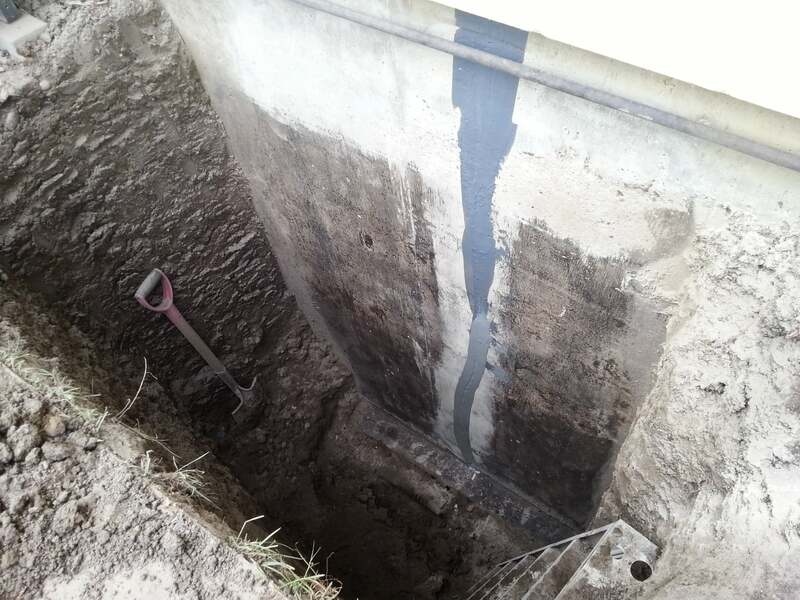 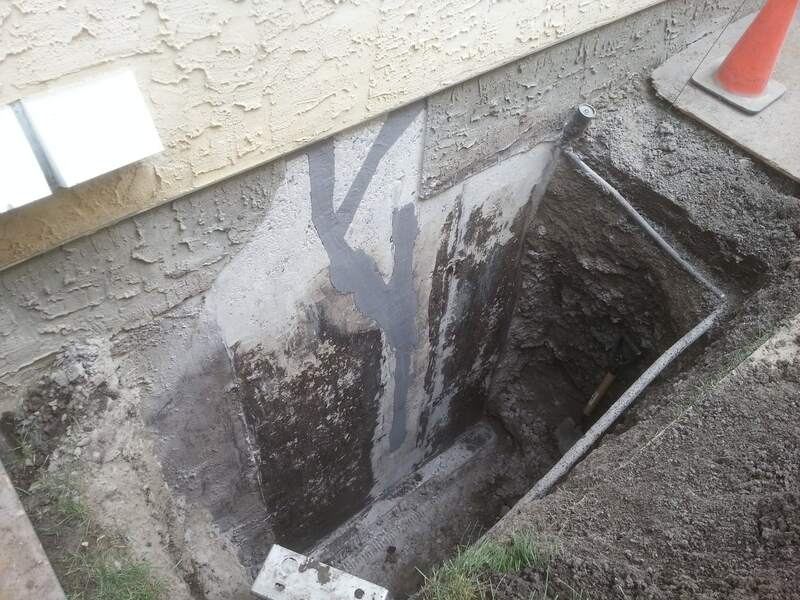 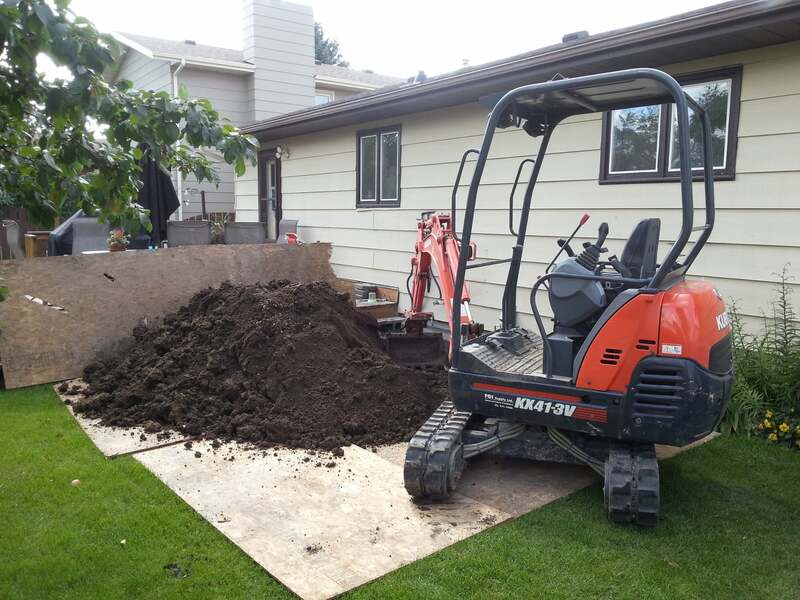 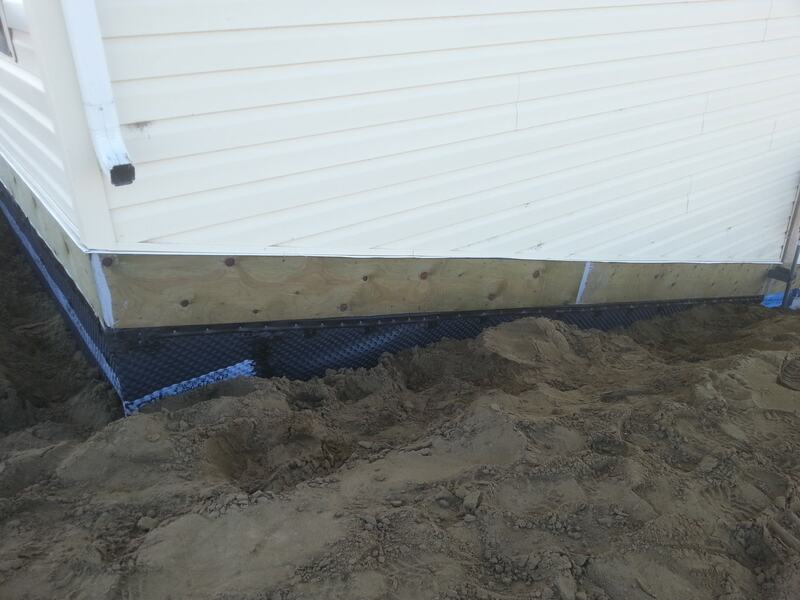 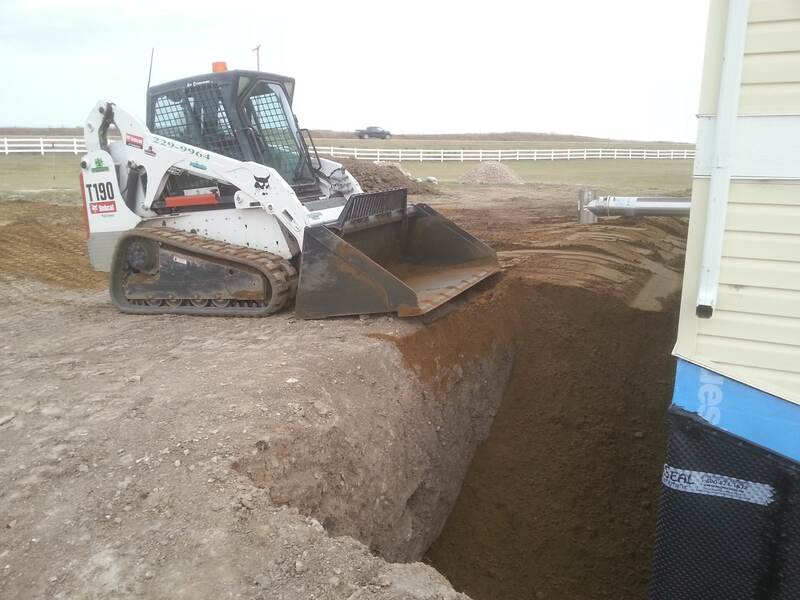 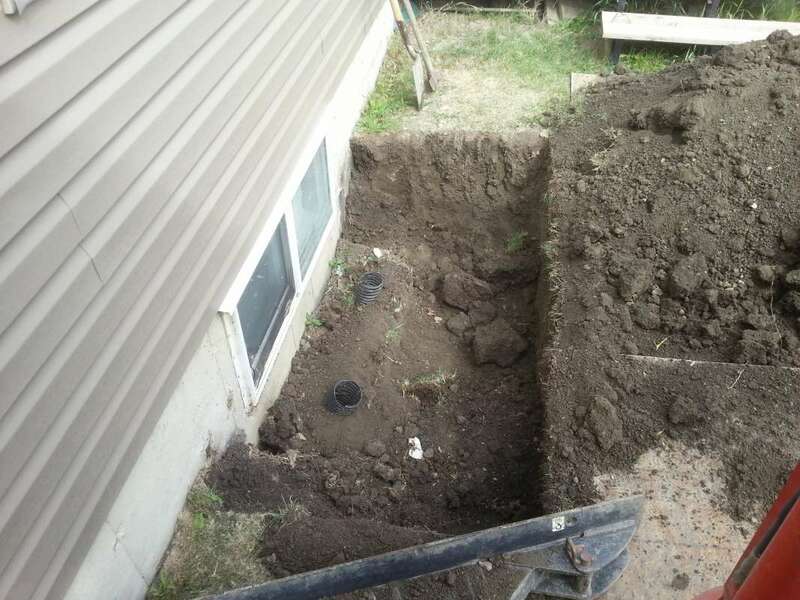 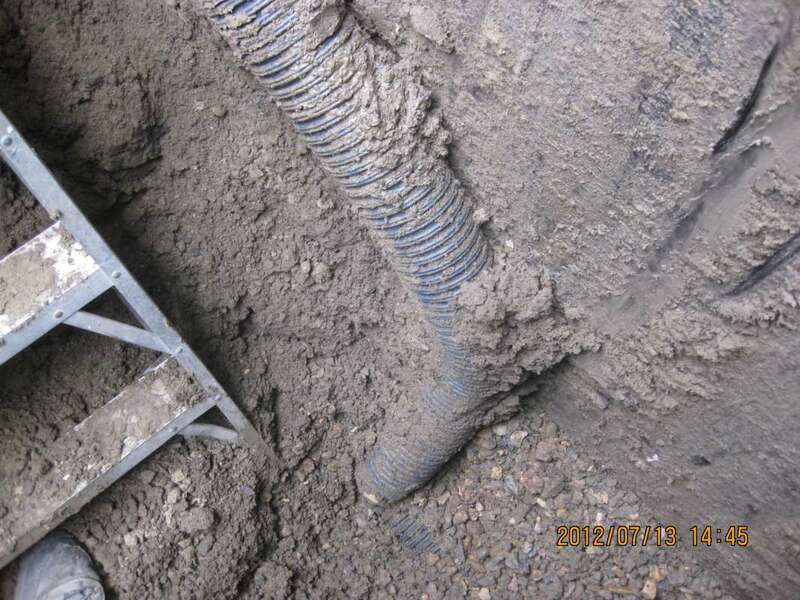 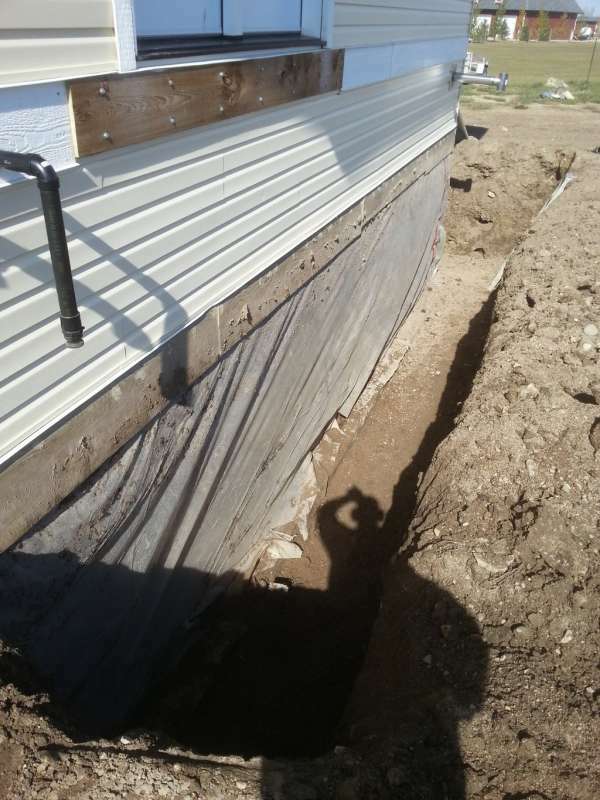 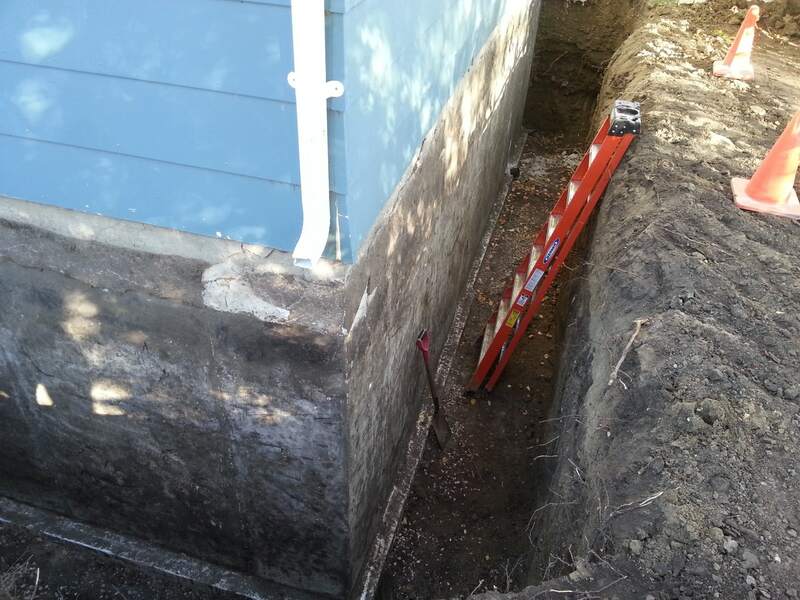 One of two problems occurred, First, the vertical drain stack was not mounted to the foundation and simply moved during the backfill process. 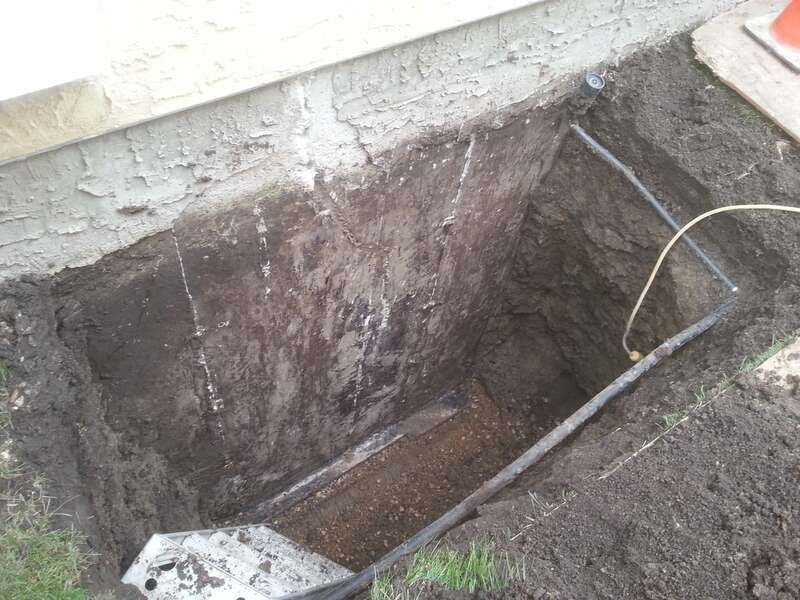 It no longer was in place to drain over the foundation weeping-tile. 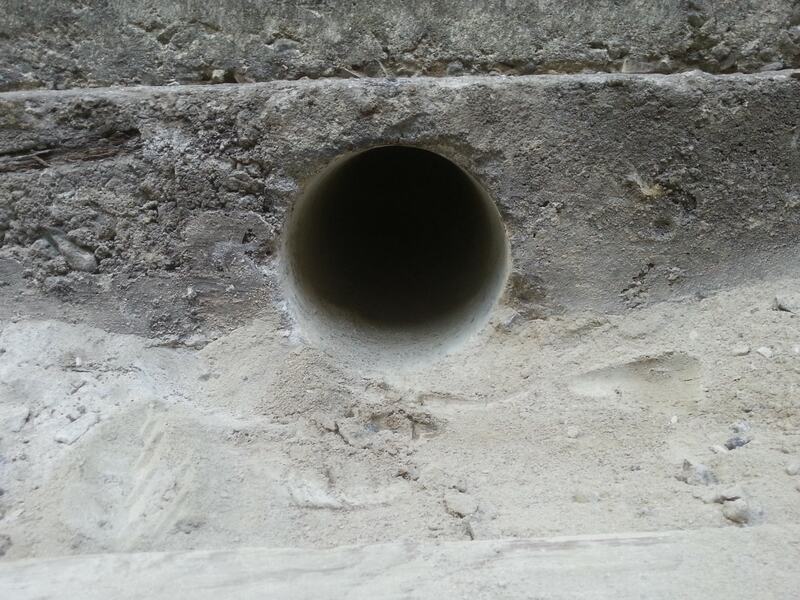 Secondly, the practice of filling the vertical window-well drain stack with crushed rock was thought to serve two purposes: it prevented the vertical drain stack from collapsing (crushing) during the backfill process, and it slowed the infiltration of dirt and sediment into the system. 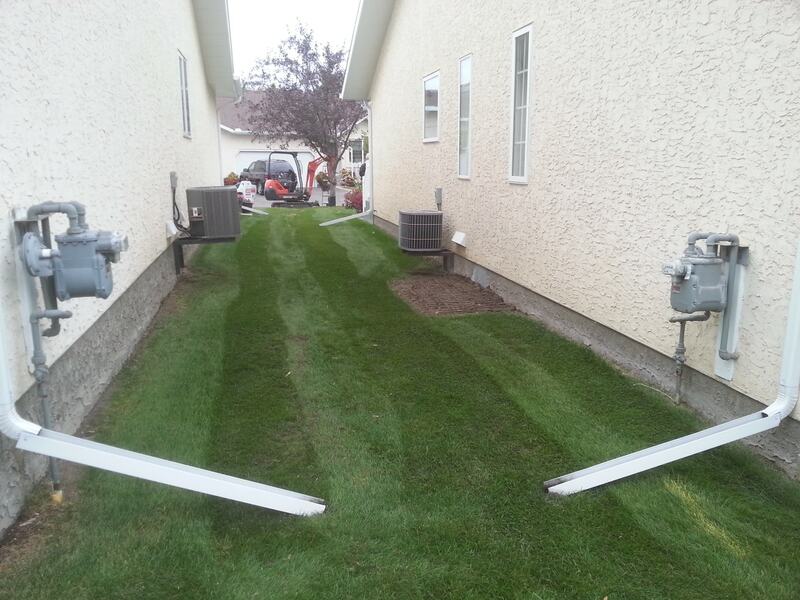 This was a failed use of logic in a cold Canadian climate. 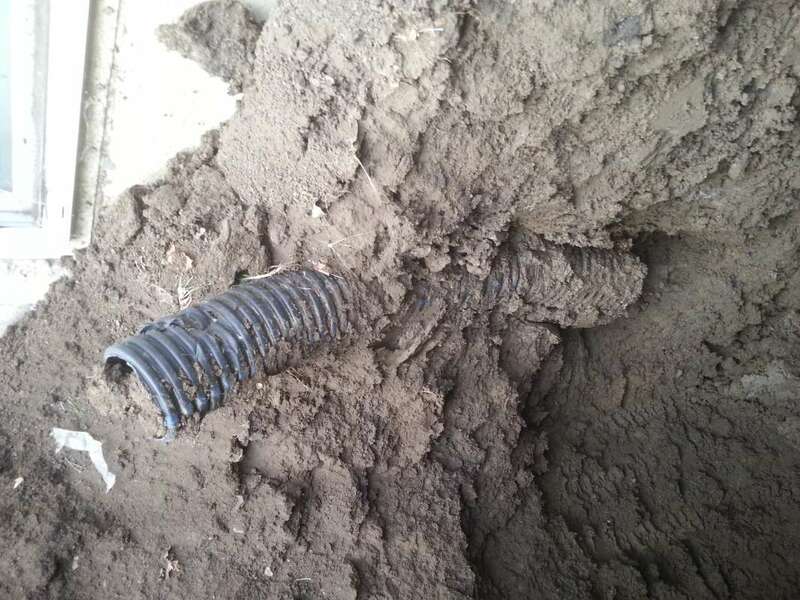 Aside from the sediment slowly making its way into the pours of the crushed rock and solidifying, the spring snow melt adds further complications. The melting snow would travel through the rock in the vertical drainage pipe, then freeze due to the cold ground temperature. 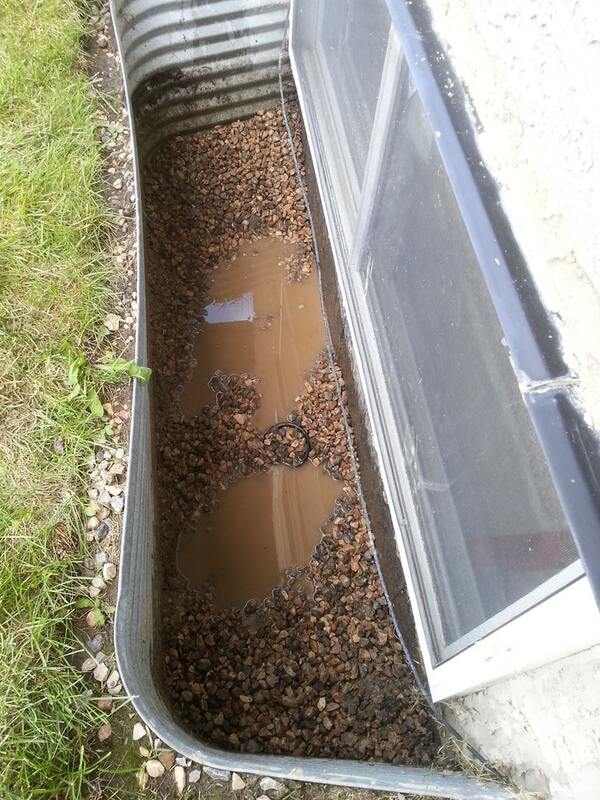 The porous rock simply turned into a solid mass and window-wells started accumulating surface water. 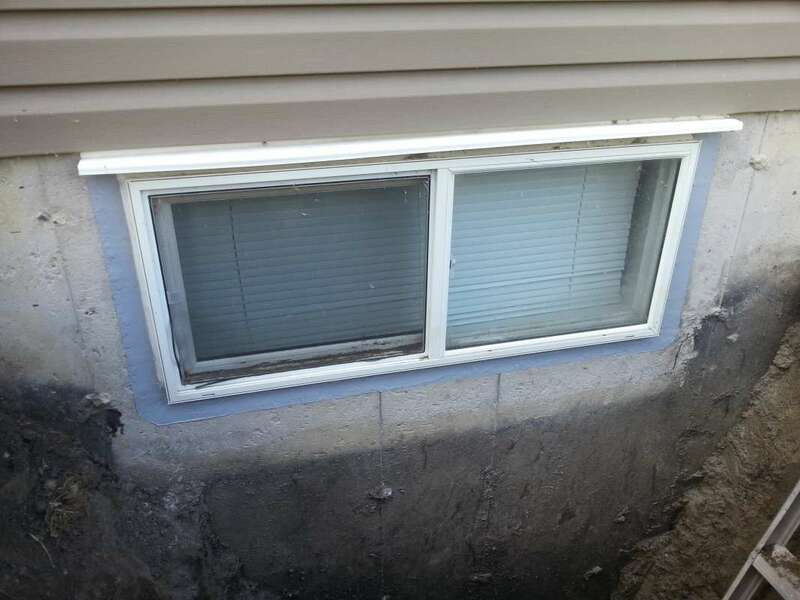 The windows themselves would fail to drain properly and then start to leak water into the basement living space. 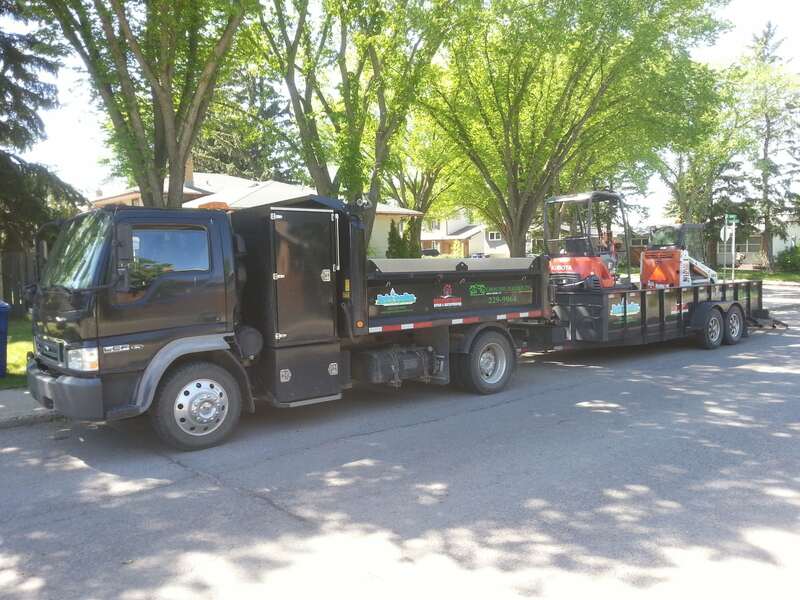 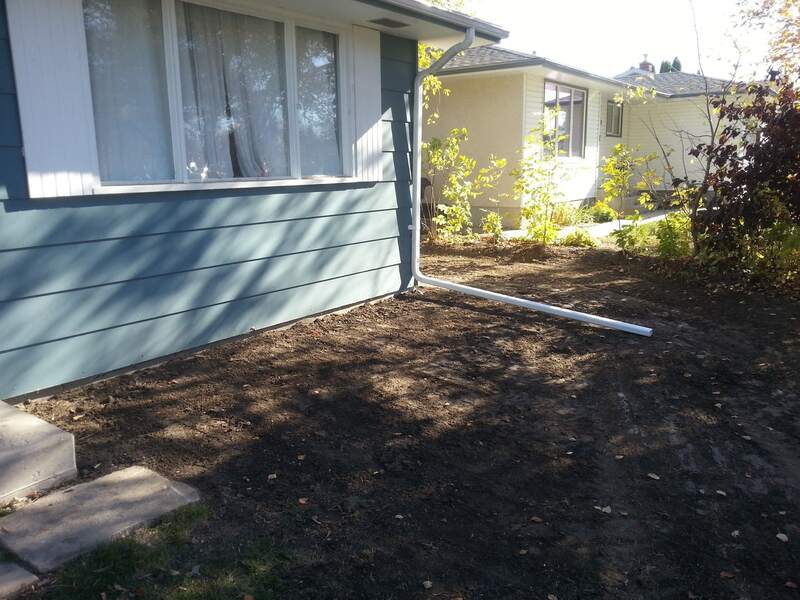 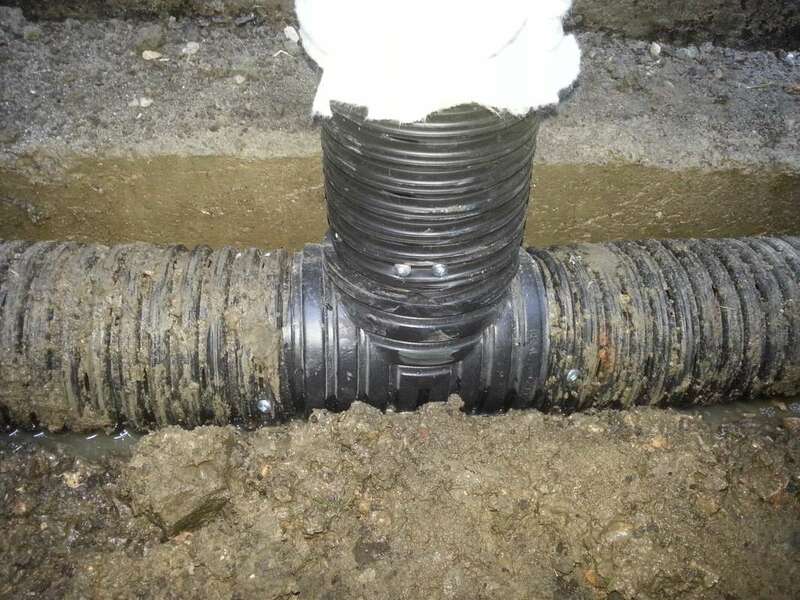 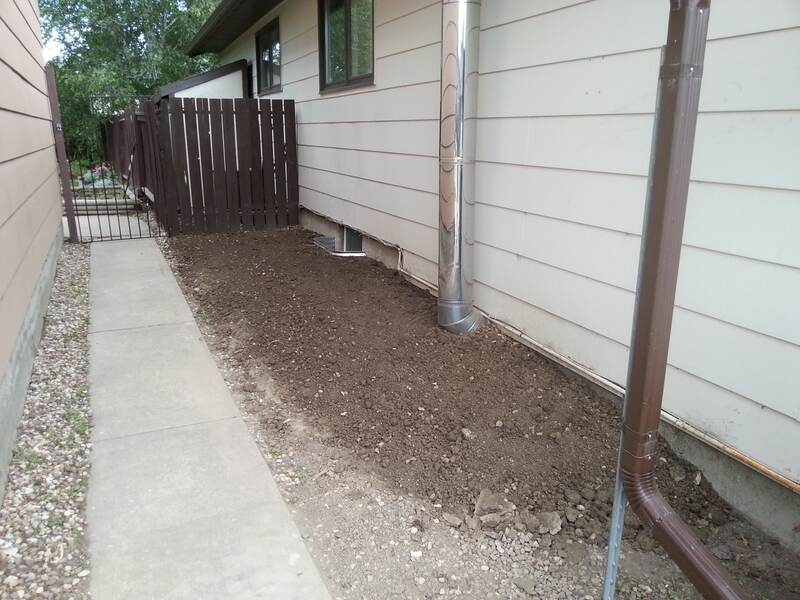 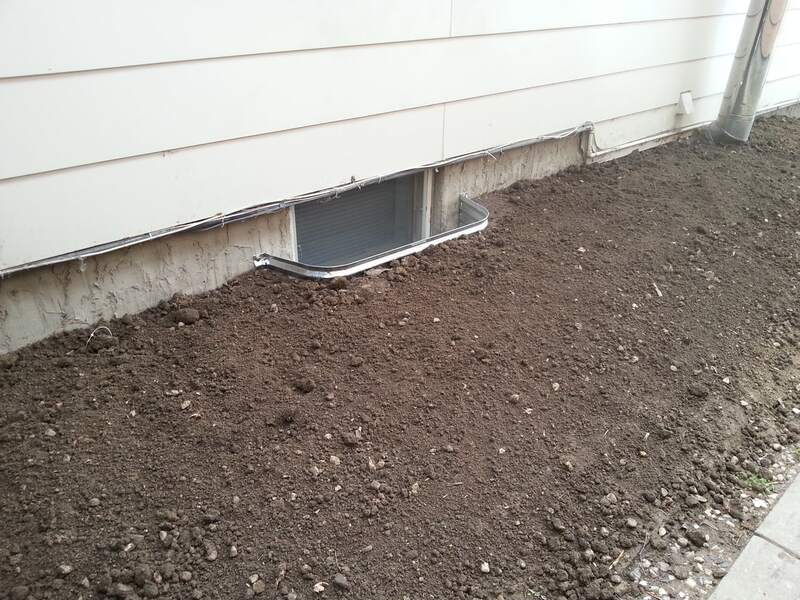 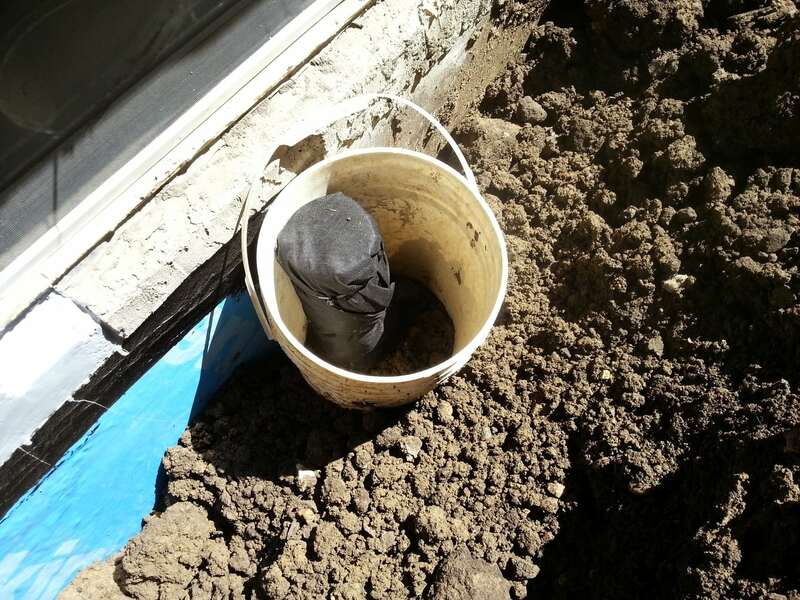 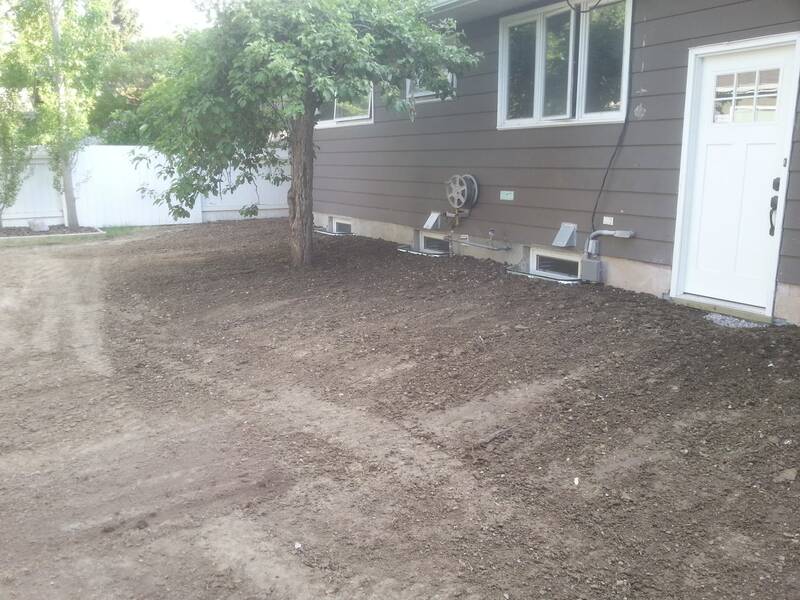 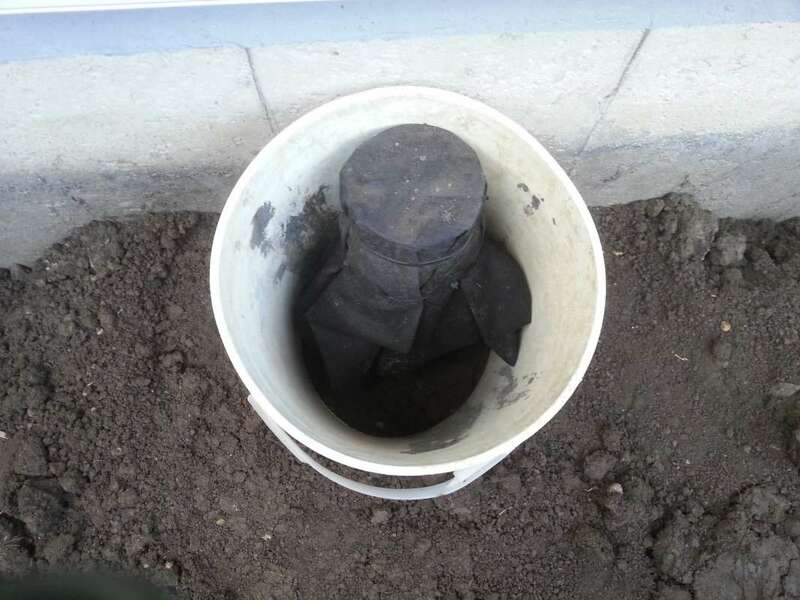 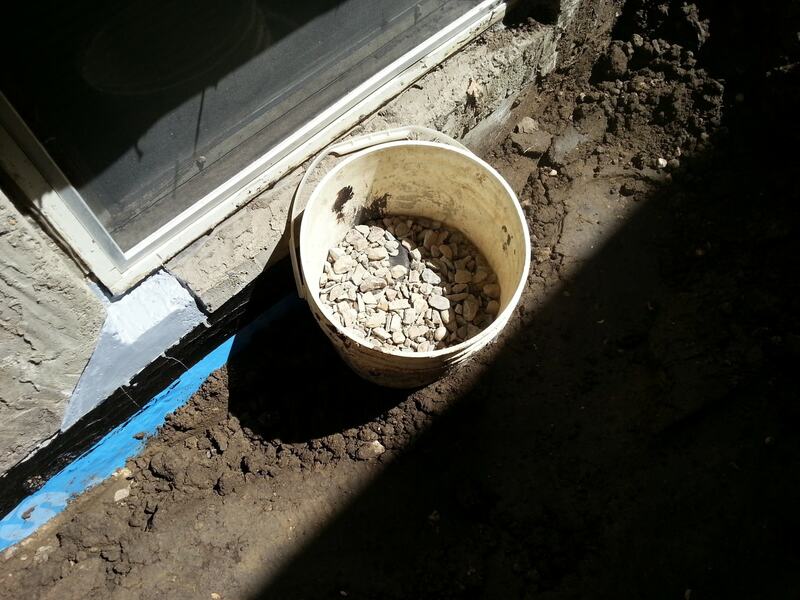 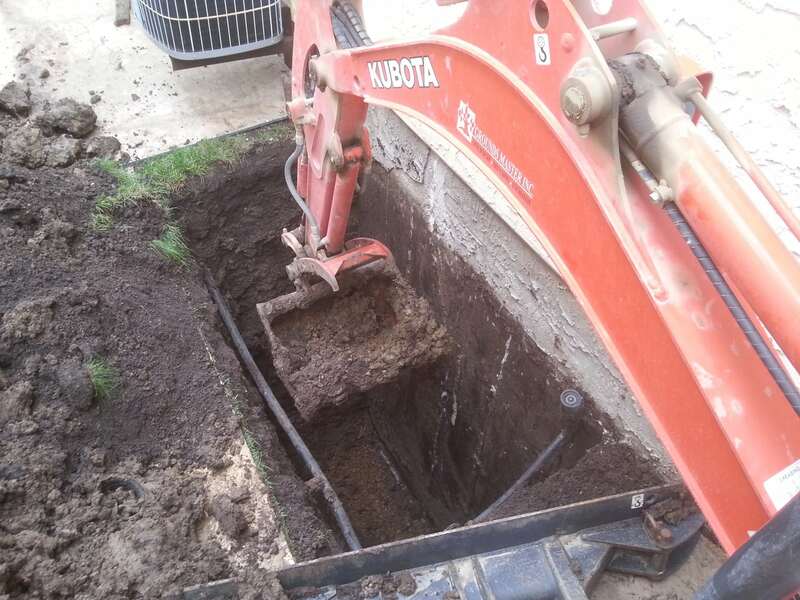 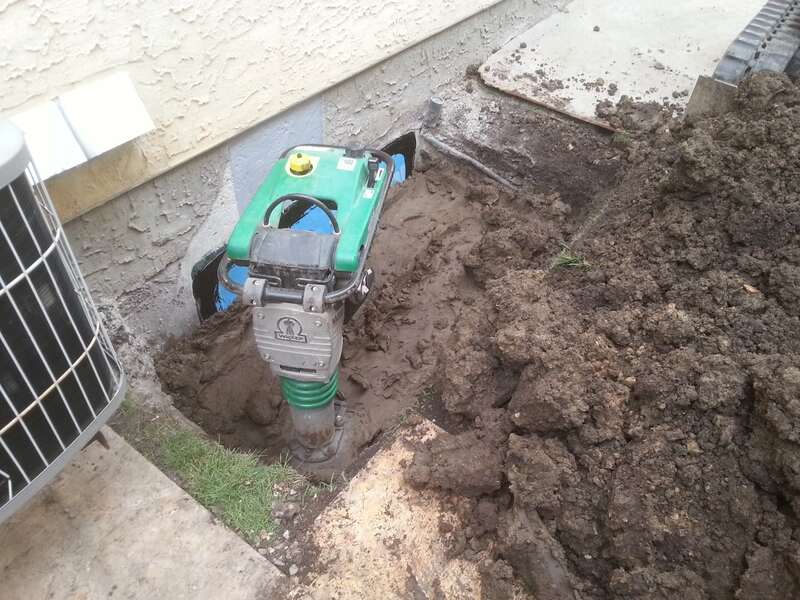 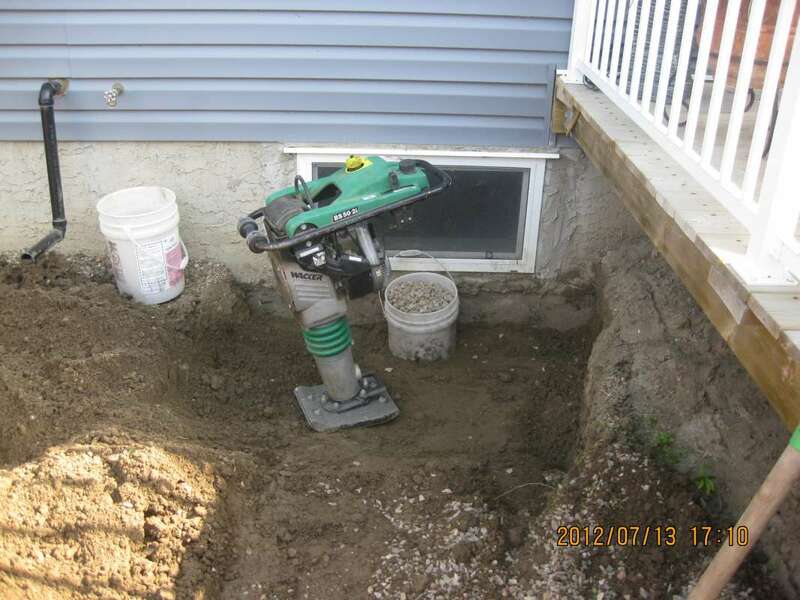 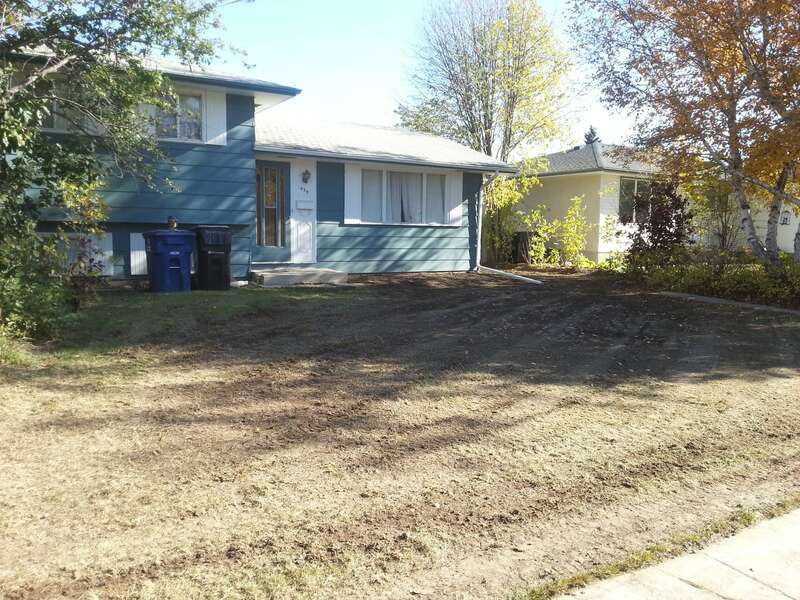 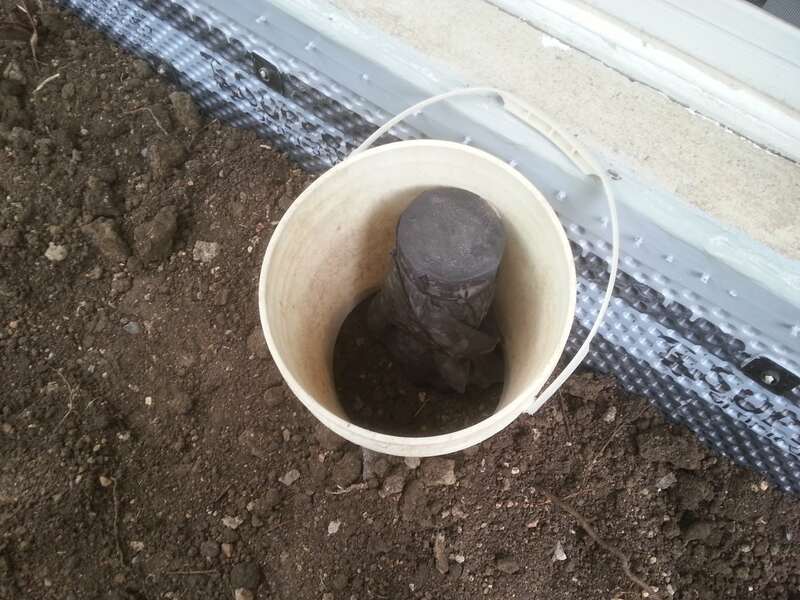 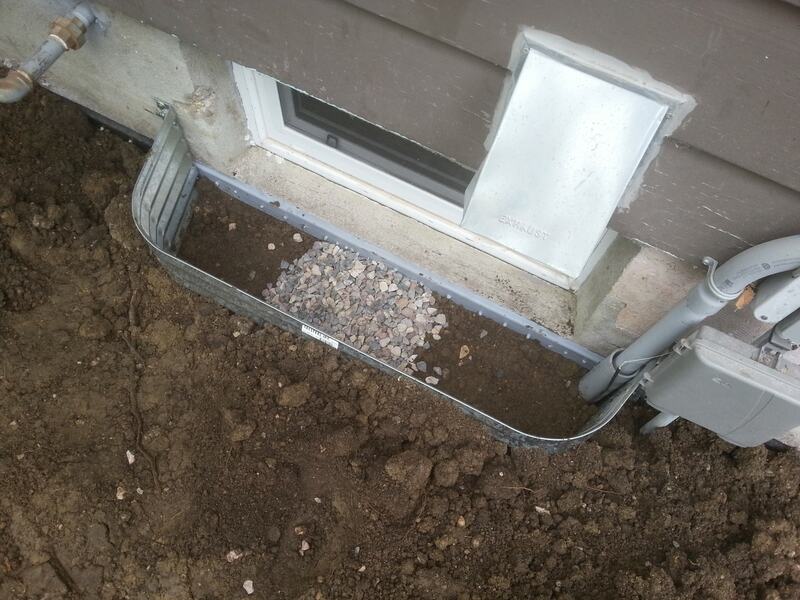 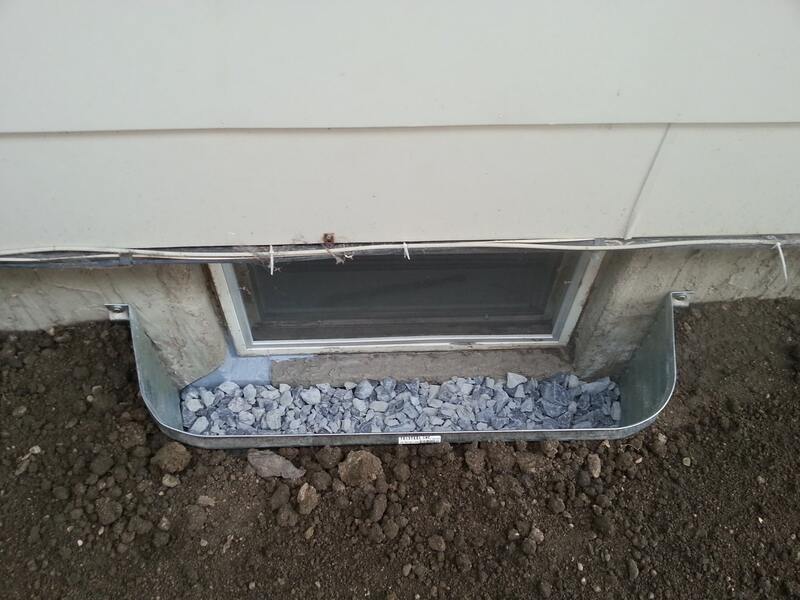 Grounds Master Inc. has always taken an alternative approach to the installation of window-well drainage, to which point, others have eventually followed suit. 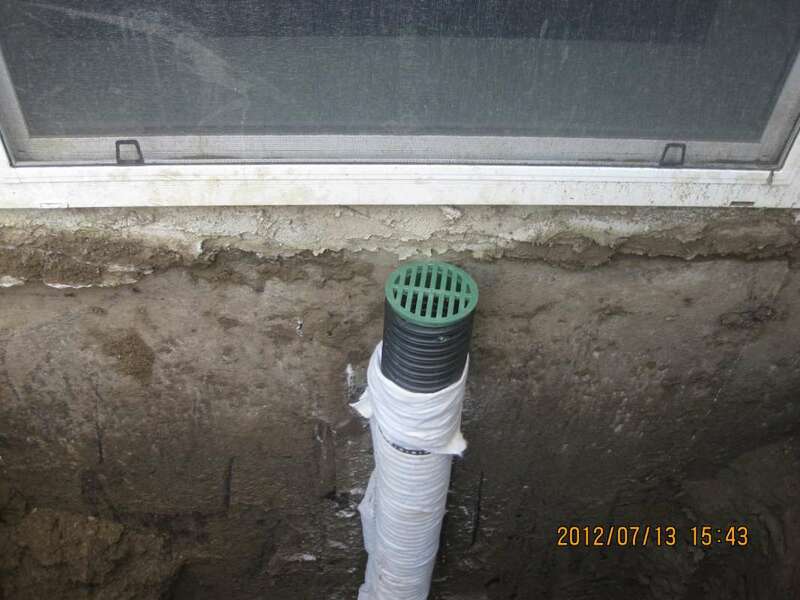 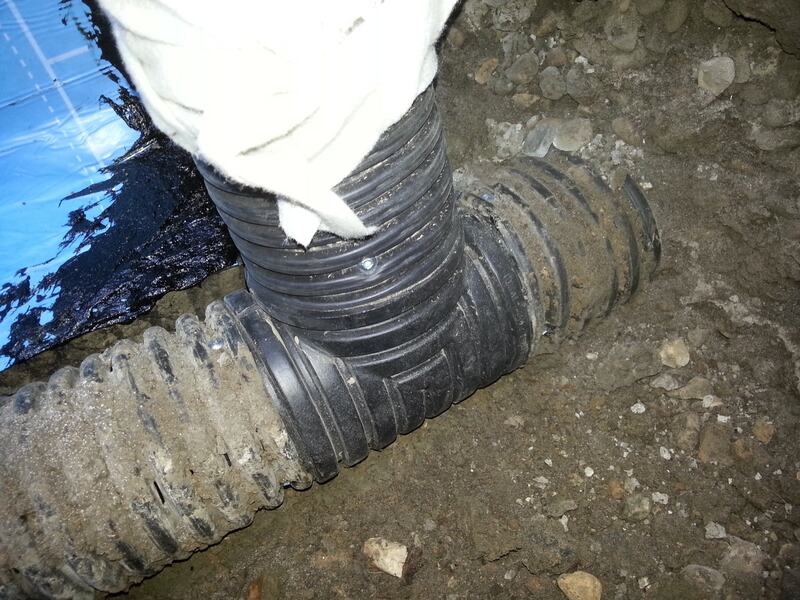 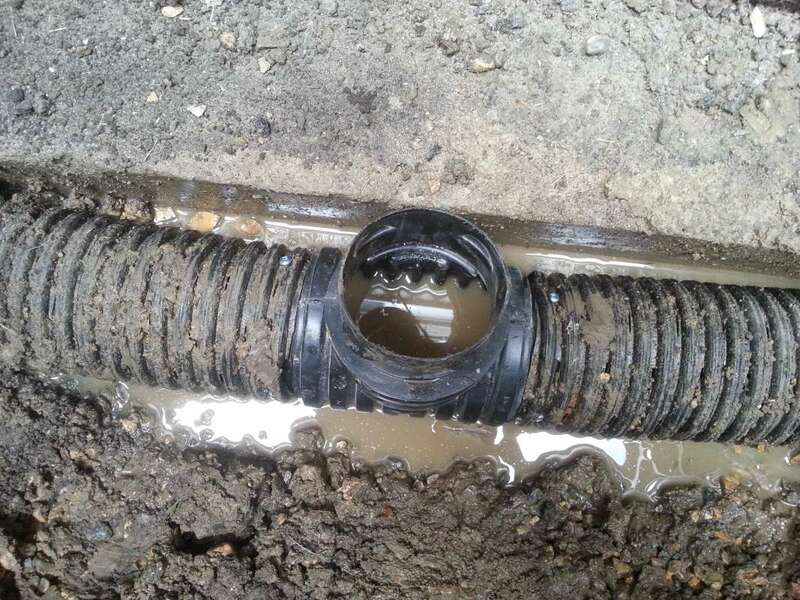 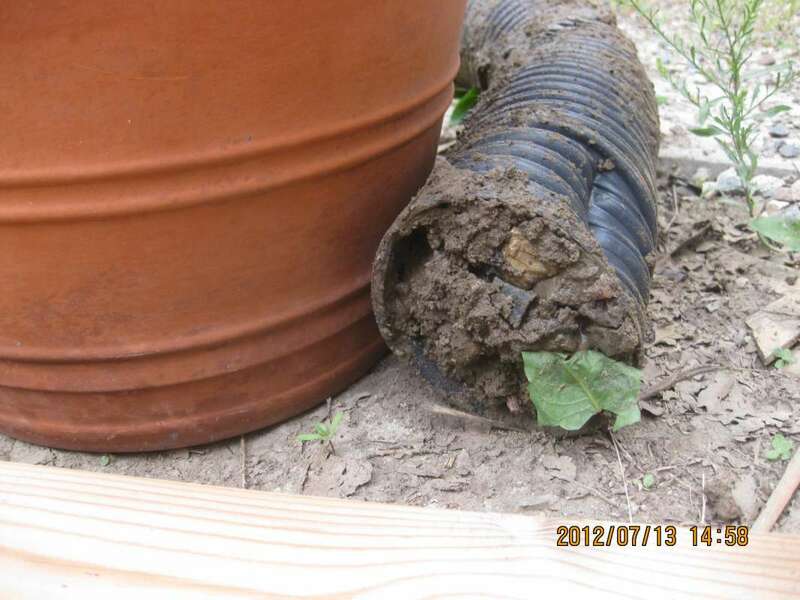 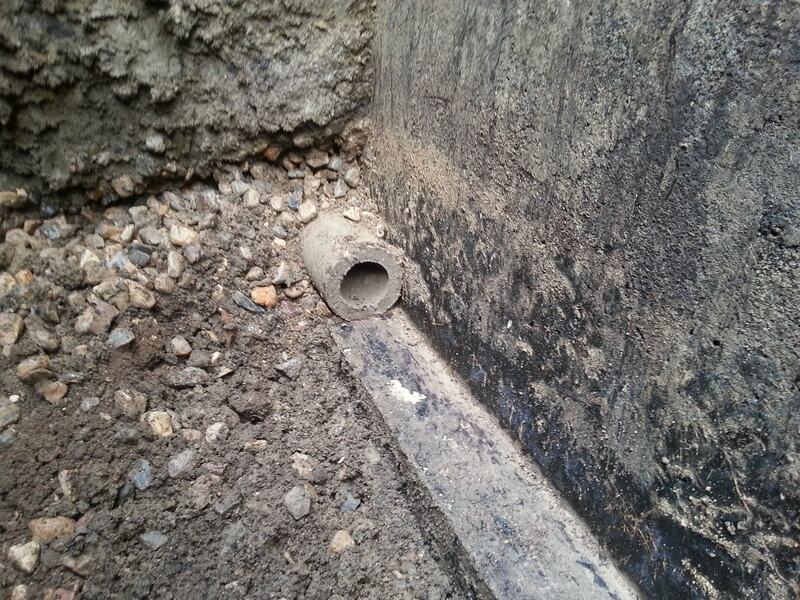 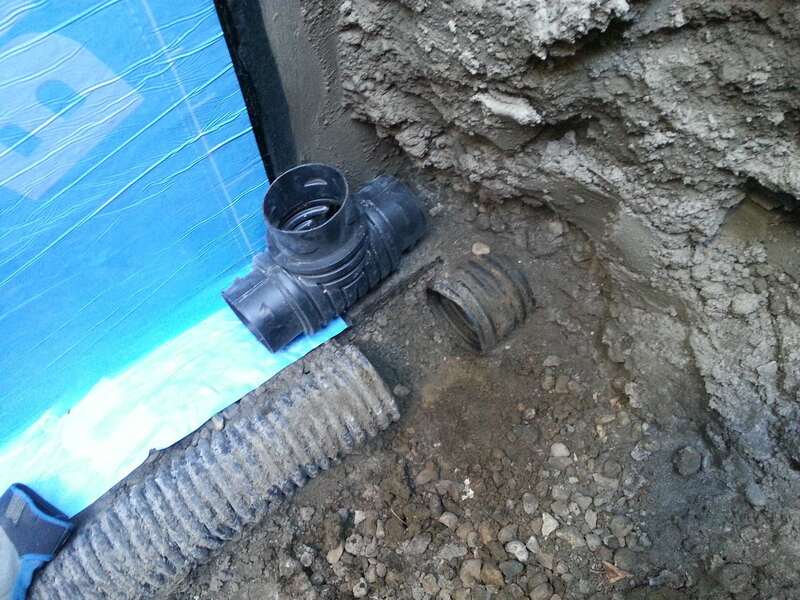 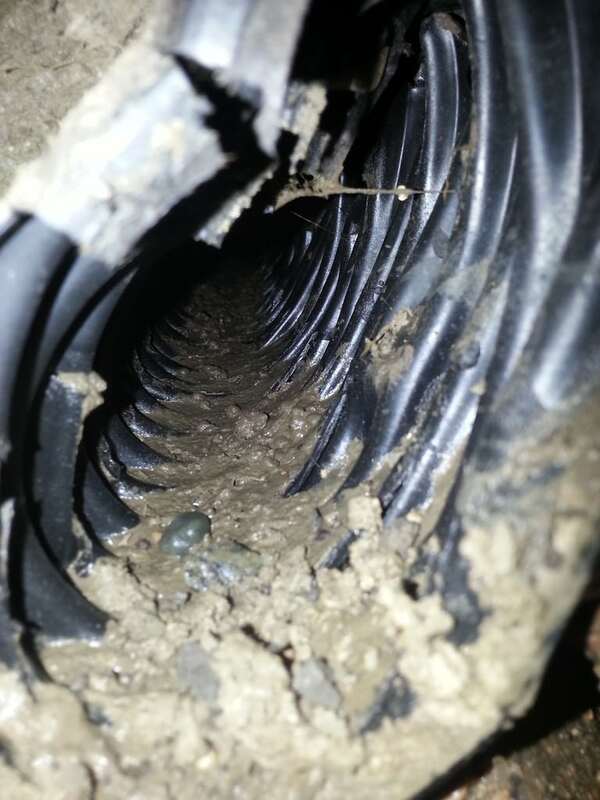 Window-well drainage pipes have always been “T-ed” into the working weeping-tile system and never filled with any drainage material which can slow down the flow of water. 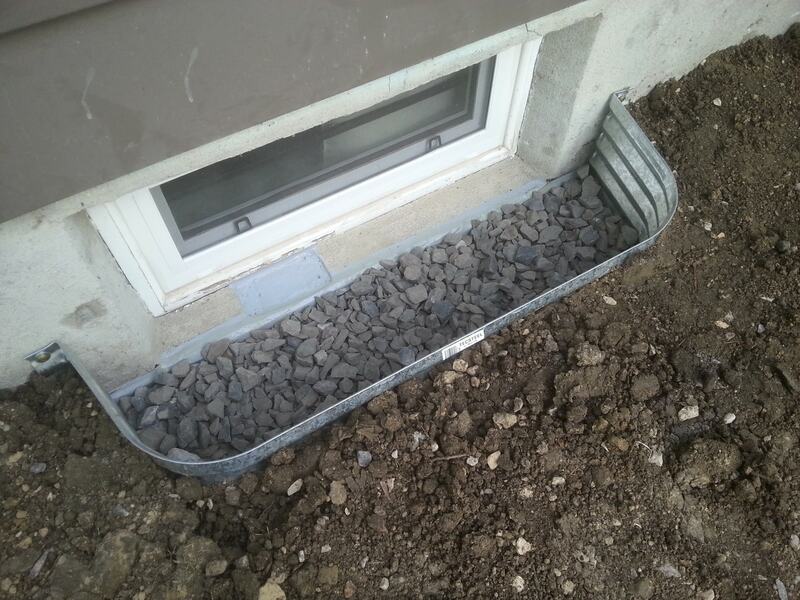 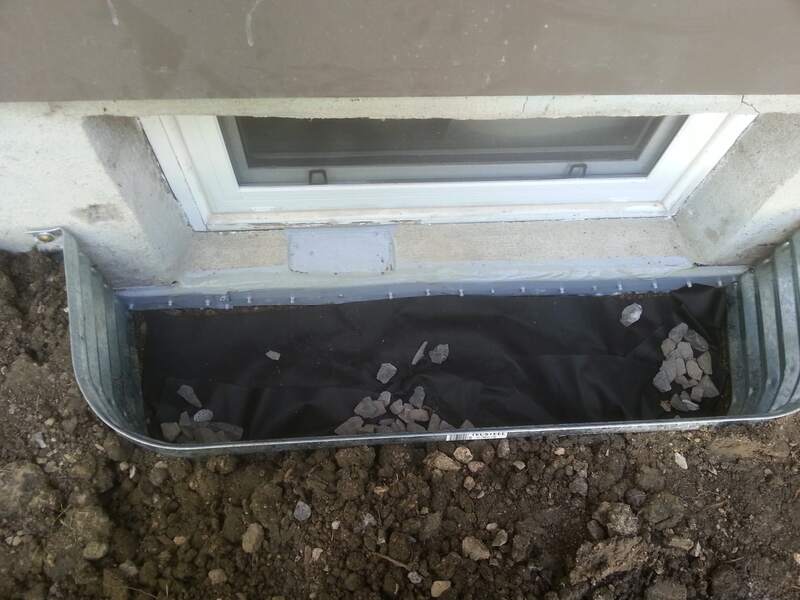 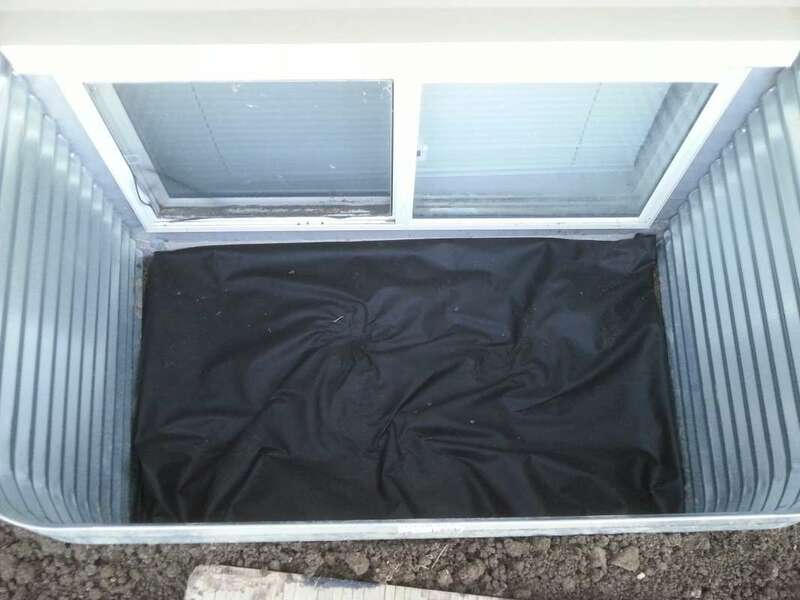 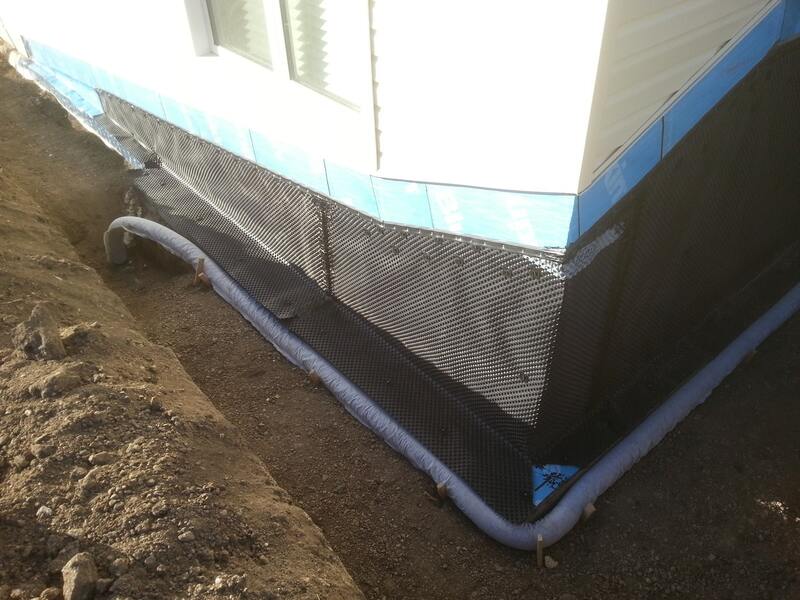 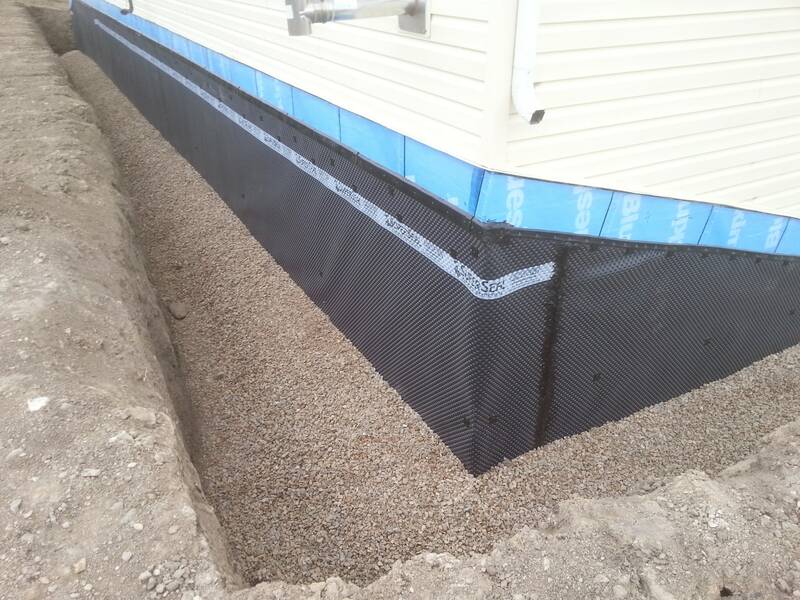 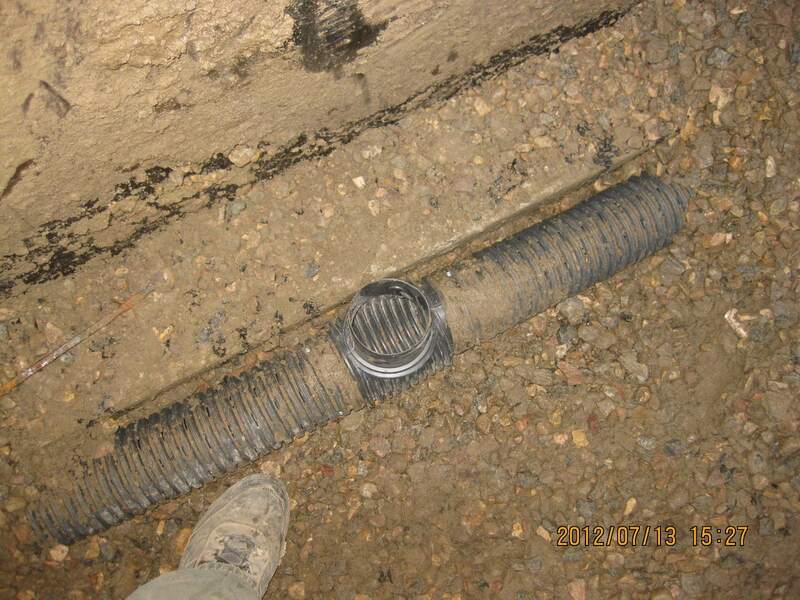 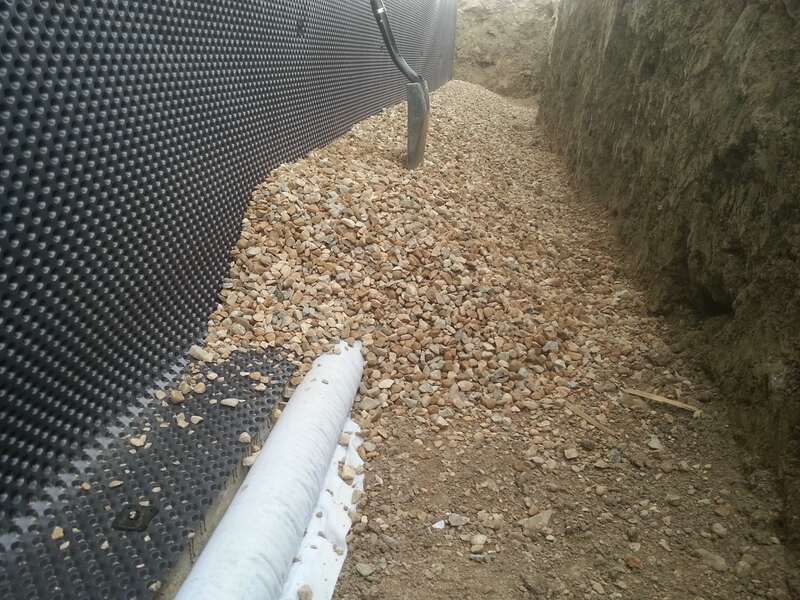 All window-well drainage pipes are secured to the wall and have drain covers and a geotextile clothe over them to filter out the soil.